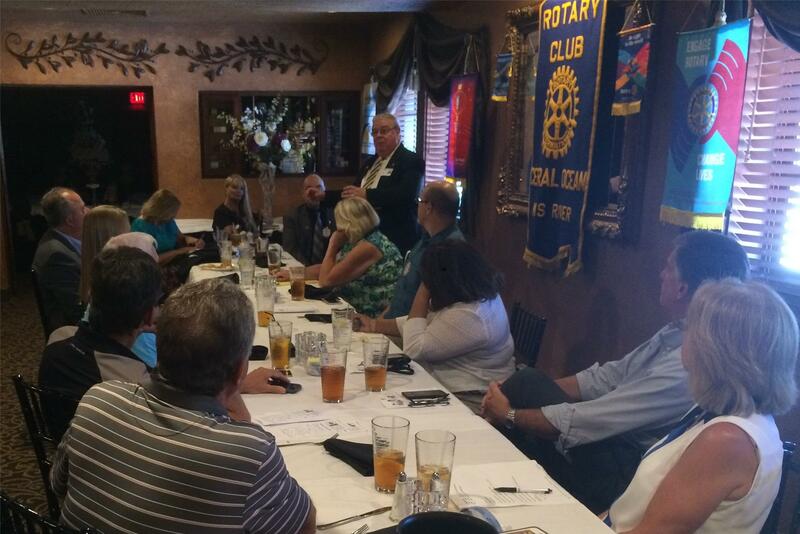 There will be no regularly scheduled Rotary meetings on Tuesday, July 3rd or Tuesday, July 10th. Please join us at our next regularly scheduled meeting on Tuesday, July 17th at Artisans. 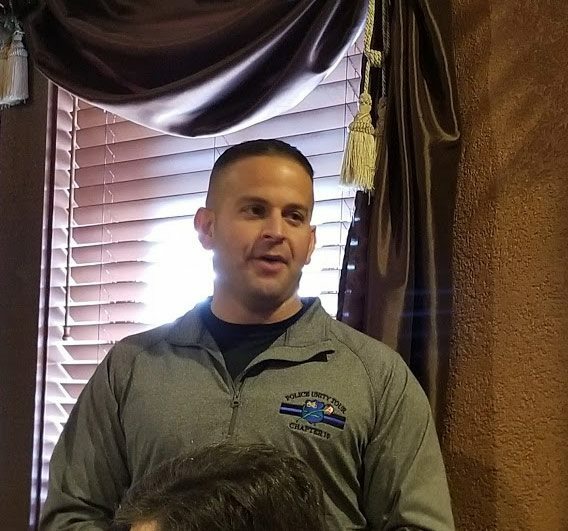 A few weeks ago, Pat Lathan stopped by to talk to us about Contact of Ocean & Monmouth Counties and all the great work they do offering free confidential crisis intervention. At that moment we knew we wanted to assist this volunteer-based organization. Service Dog Project a Success! 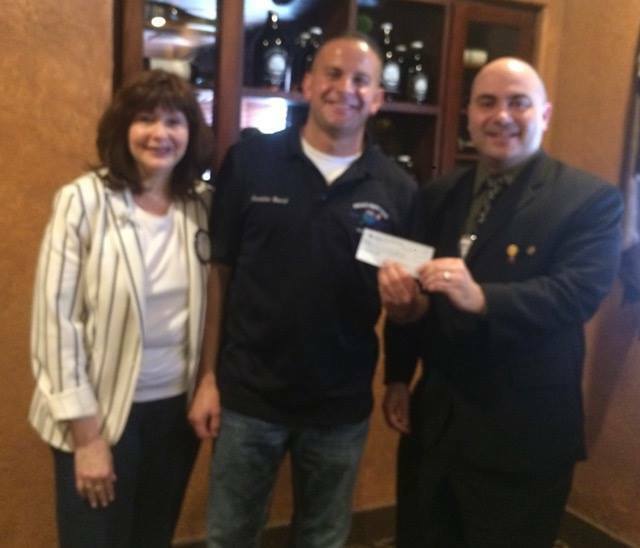 President Mike DellaRocca presented District Governor Diane Latza Rotondelli a check for the service dog project. 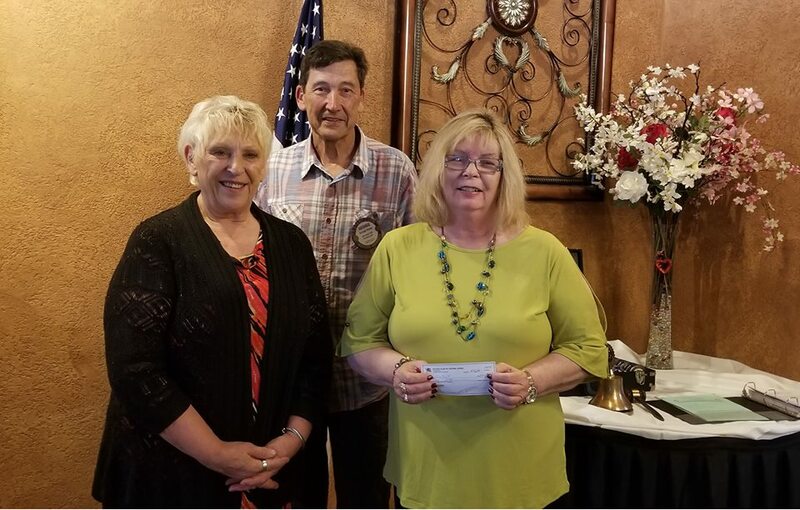 The goal was to provide 2 service dogs to veterans in need and because of everyone's efforts, Rotary District 7500 will be providing THREE service dogs! 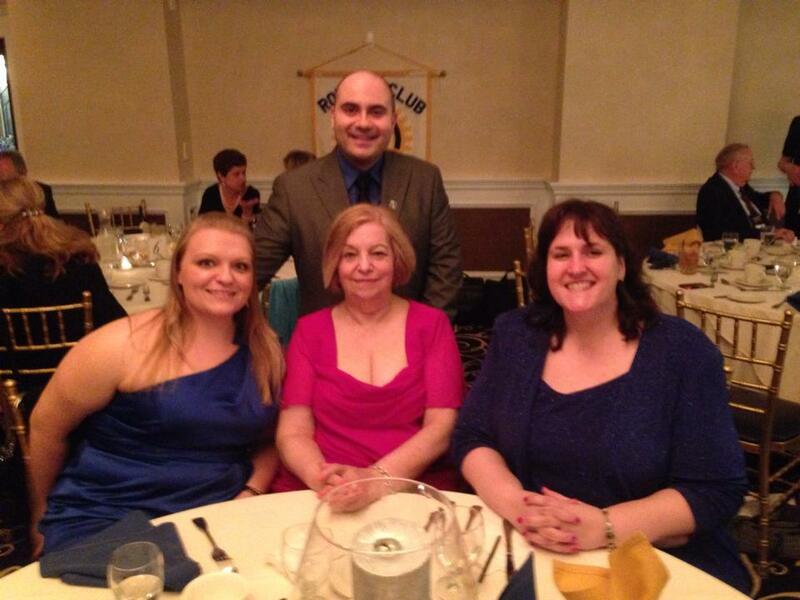 Pictured is her sponsor Elizabeth, Jill and Club Membership Chair Michael Bucca. 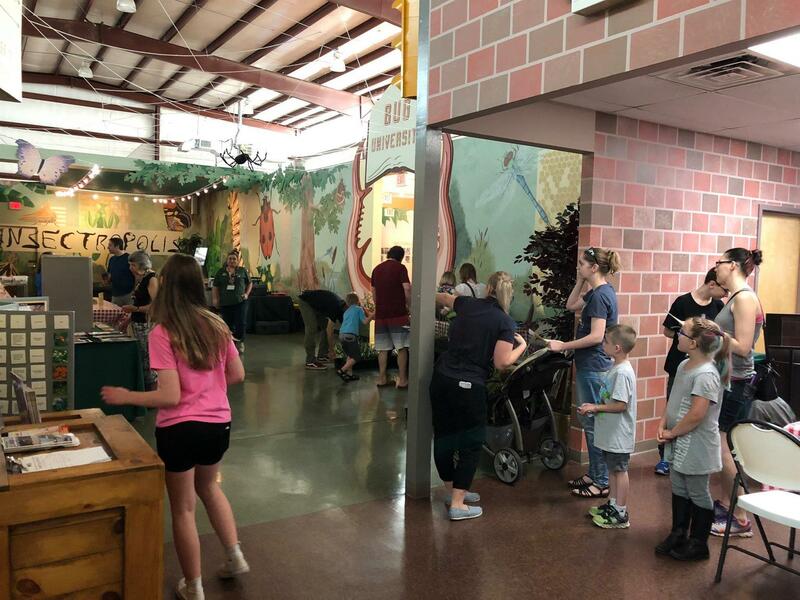 We are so grateful for all of the families and friends that came out to BugFest 2018 at Insectropolis! A good time had by all. Funds raised will benefit our club's scholarship fund. 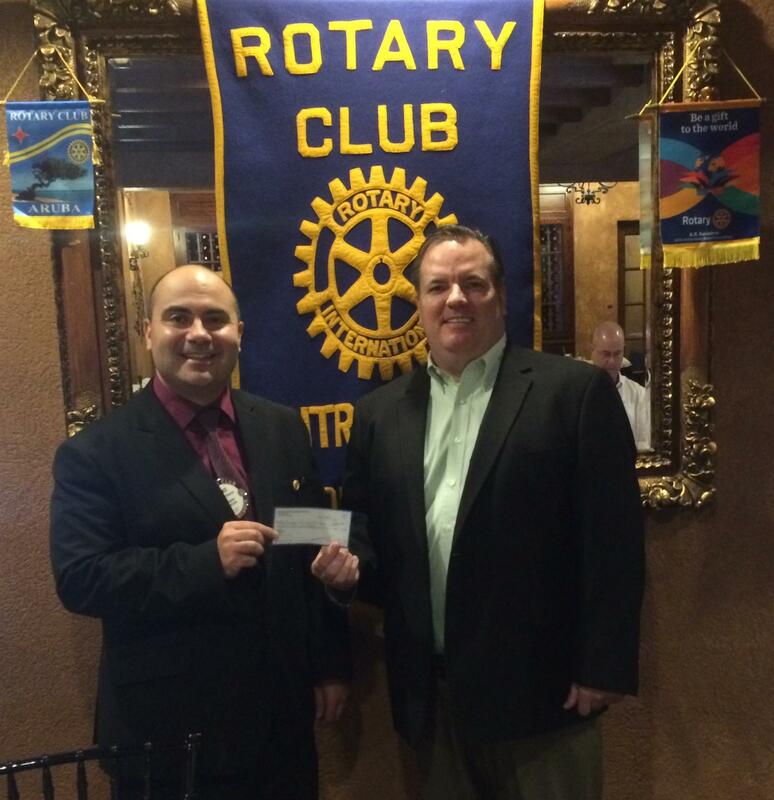 Special thanks to past president Chris Koerner and OZANE Termite and Pest Control for their support of Rotary! 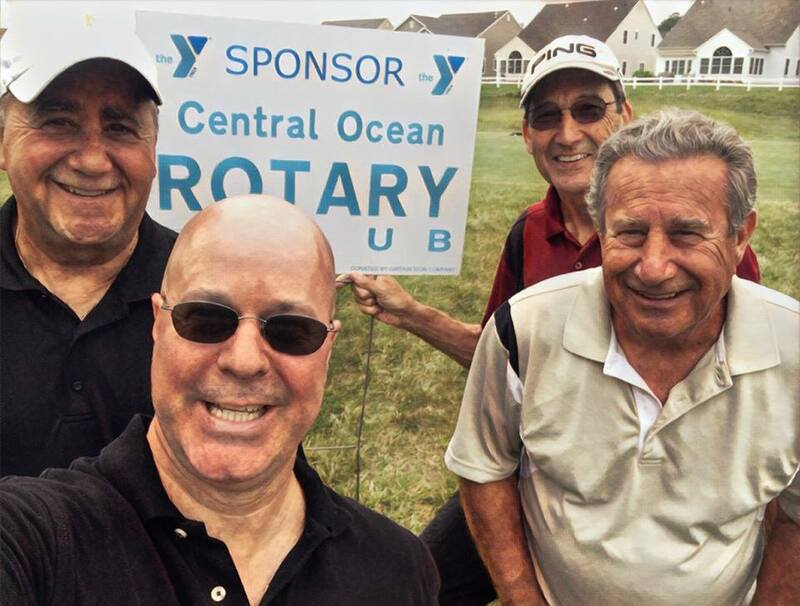 Central Ocean Rotary was proud to be a sponsor of the 37th Annual Ocean County YMCA Golf Outing. 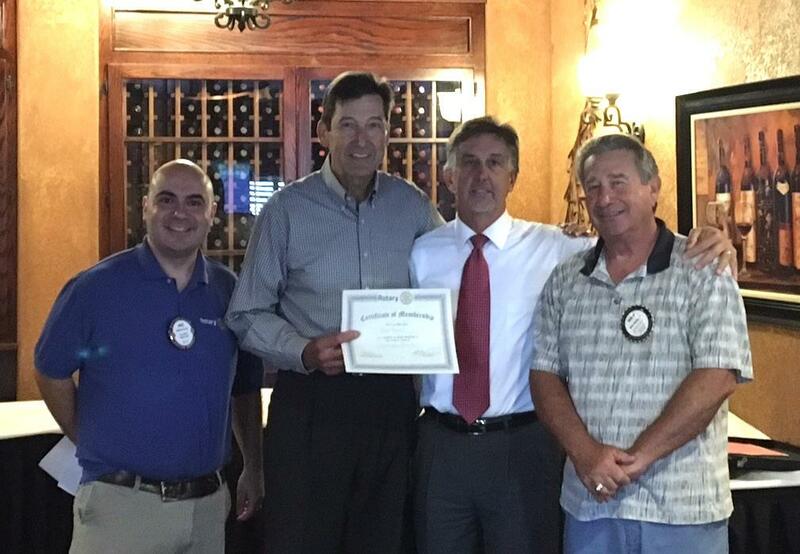 Special thanks to members Jim Koerner, George Hanna, Peter Singagliese, and Mark Rushwald for representing the club! PS - We might need some selfie taking lessons for our golfers! 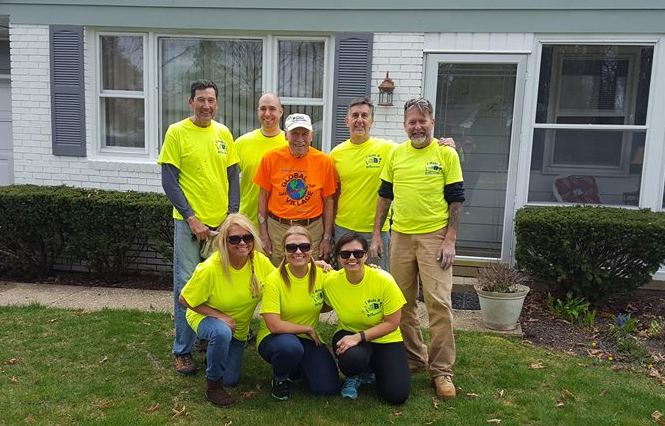 Central Ocean Rotary members volunteered their time to work with Northern Ocean Habitat for Humanity. 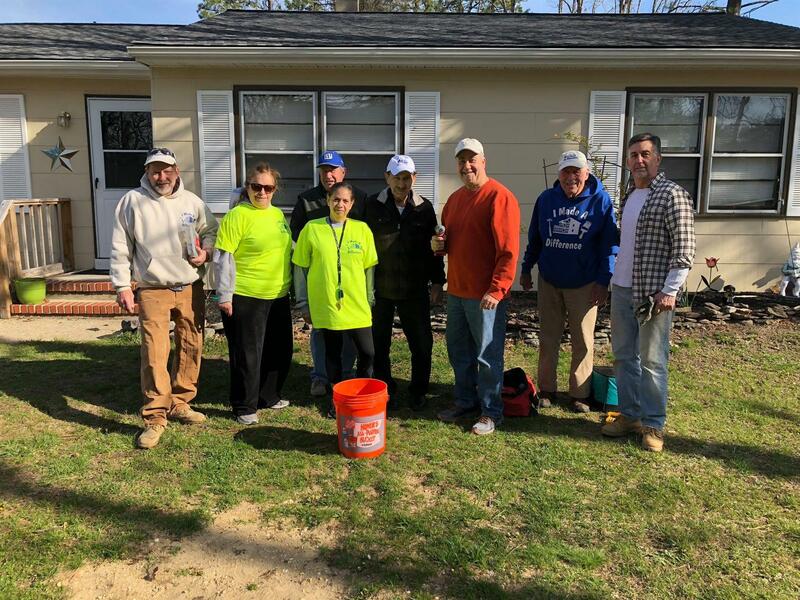 Rotarians performed various tasks to help revitalize a home for a veteran in need in our community. Thank you so much to all of the volunteers who helped on this project. Dawn Doherty from the Society for the Prevention of Teen Suicide (SPTS) came to talk to us about all the great work they do in schools and our community. 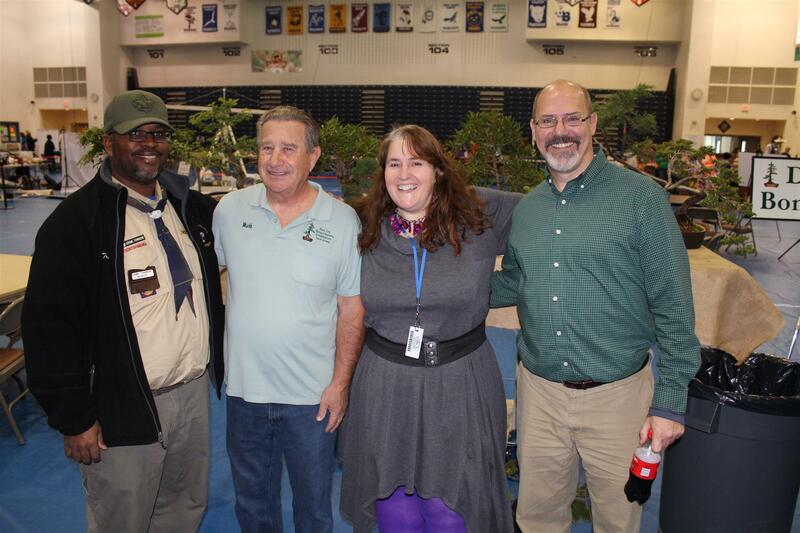 Central Ocean Rotary is proud to support the Jersey Shore Council Boy Scouts of America. 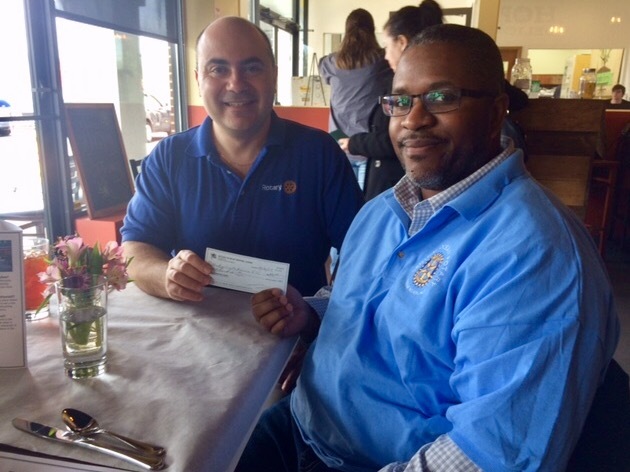 Rotarian and scouting District Executive Jerome Townsend accepted a $1,000 donation from club president Mike DellaRocca. 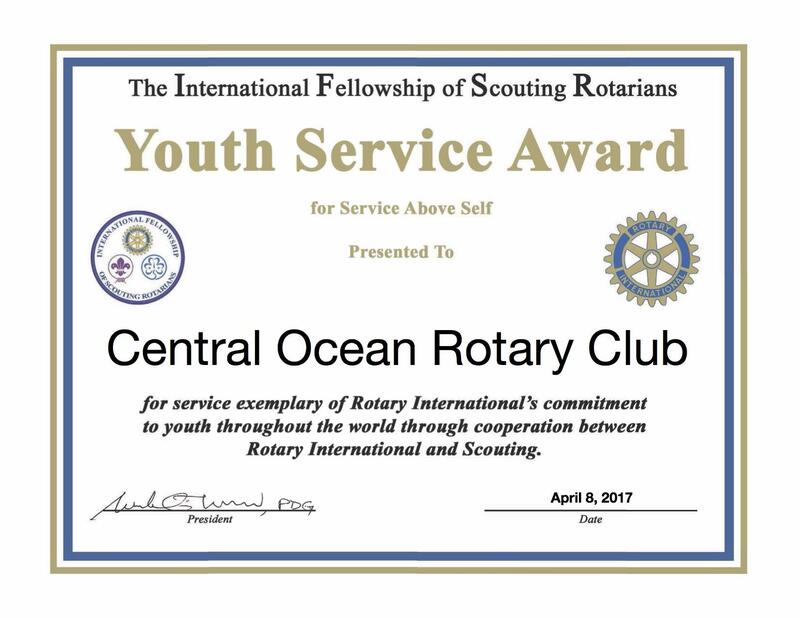 The Boy Scouts and Central Ocean Rotary have collaborated on many projects over the last year and we look forward to what we can accomplish together! 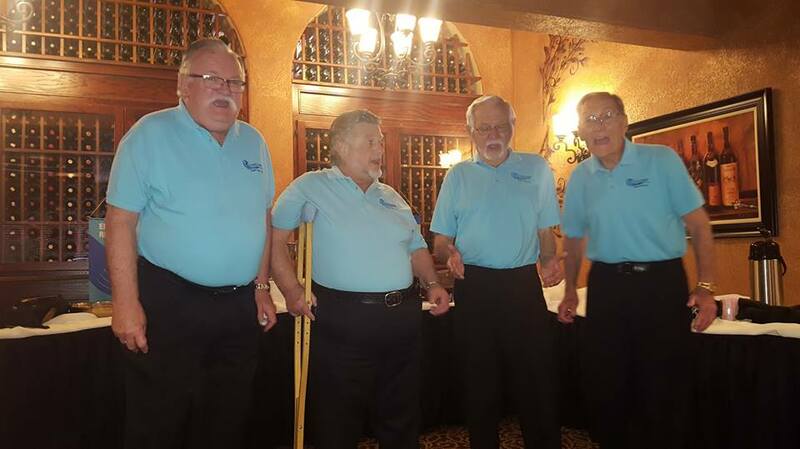 8th Annual Gift Auction a Success! 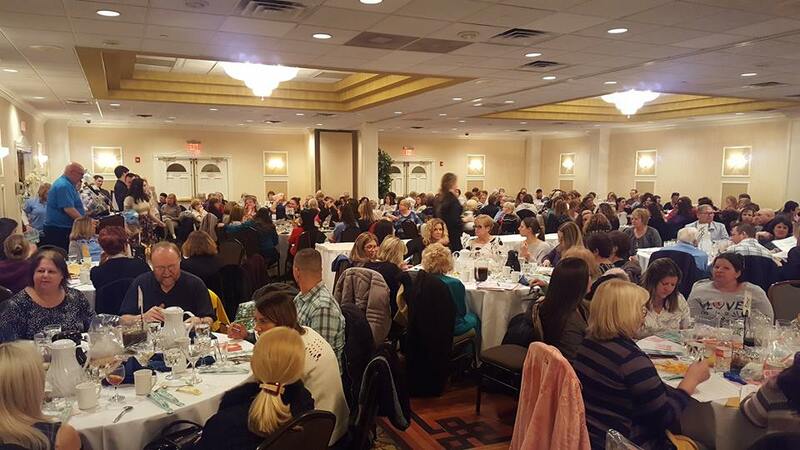 Thank you to all of the wonderful attendees of our 8th Annual Gift Auction. 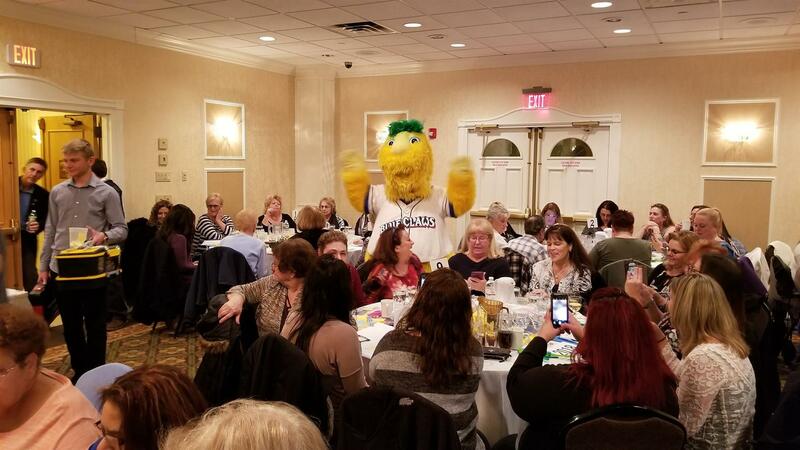 Buster from the Lakewood BlueClaws came by to get the party started! Attendees got to take a chance at hundreds of gifts and prizes! We sincerely thank everyone for their support of our club and community. Click here for a short slideshow of the event. Meet Kaitlyn Molnar. 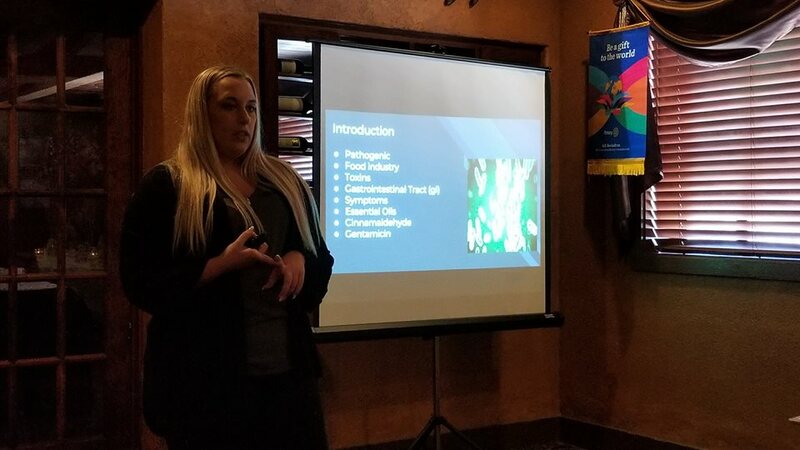 A high school student who wrote a master's paper on E-coli and how essential oils can help fight it. After listening to her presentation and her experiment with essential oils it made us think back to the times when a building a volcano was enough to pass... These kids have a great future ahead of them! Rory Hogan stopped by and talked to us about how pollution affects our ecosystem. DID YOU KNOW that fertilizers that we apply to our lawns are washed from runoff into rivers, streams and even the ocean? This excess nitrogen causes pollution in our area. 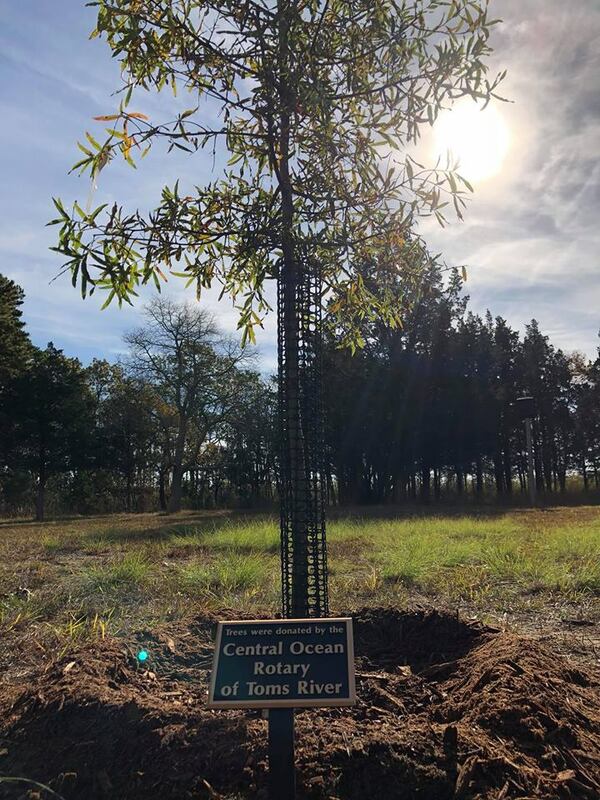 In high school, Rory worked on a project where he planted indigenous plants right here in Ocean County and discovered that there were certain plants that lowered the nitrogen levels from the earth. These plants are the Joe Pye Weed, Bee Balm and Switchgrass. They required minimal care and we can all do our part by planting these around our community to help the environment. 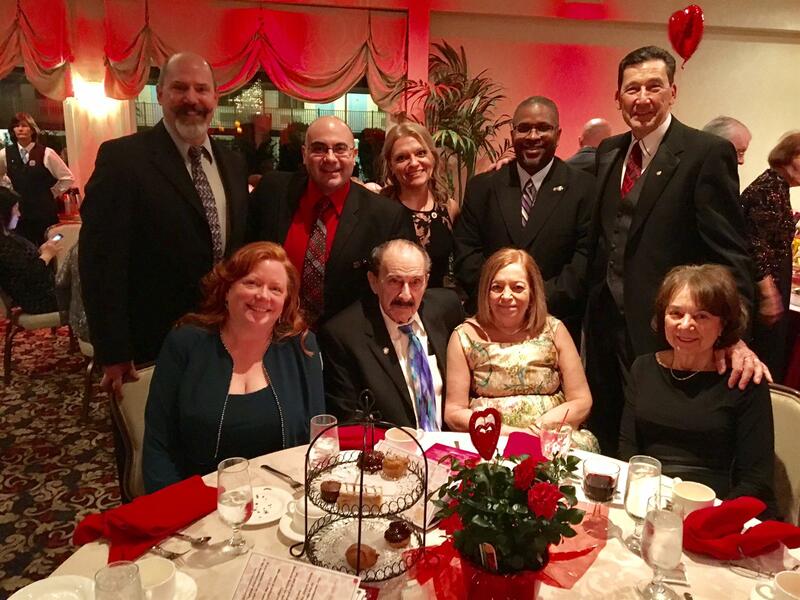 Our club proudly attended the Rotary District 7500 Gift of Life Gala supporting life saving heart surgeries for children around the world. A very special thank you to club member and Gift of Life board member Melanie Bucca for her hard work at the event. 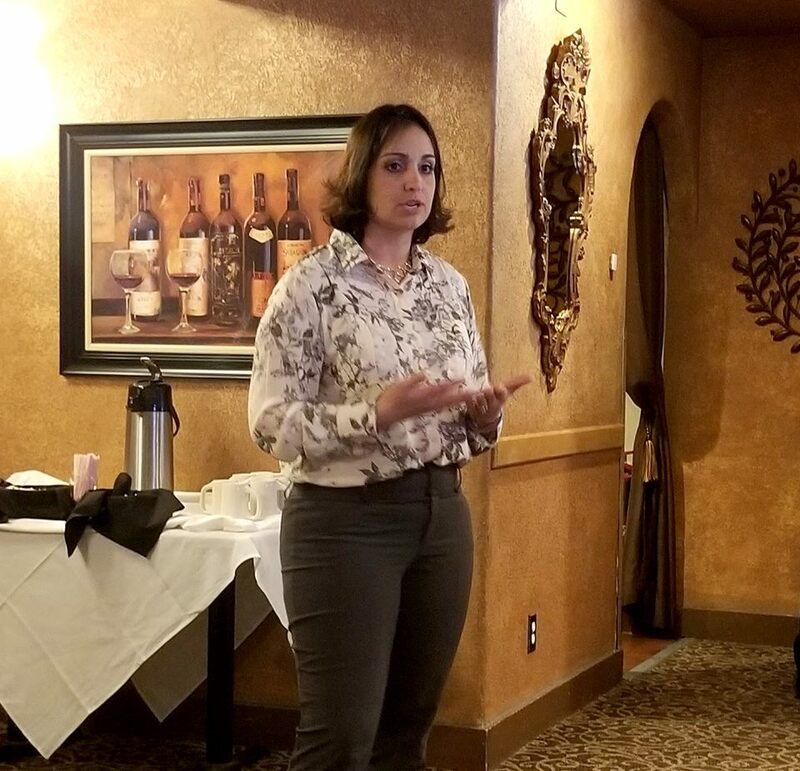 Central Ocean Rotary member Melanie Bucca, who is also on the board of Rotary District 7500 Gift of Life, talked to us yesterday about the great work Gift of Life is doing helping children in developing countries. Rotary District 7500 Gift of Life supports programs that enable medical teams of doctors, nurses and technicians provide advanced training in pediatric cardiopulmonary surgery to establish a permanent presence in countries throughout the world to provide life-saving services to an ever-increasing number of children with cardiac problems. Many thanks to Amanda Oglesby from the The Asbury Park Press for being a great speaker to our group. 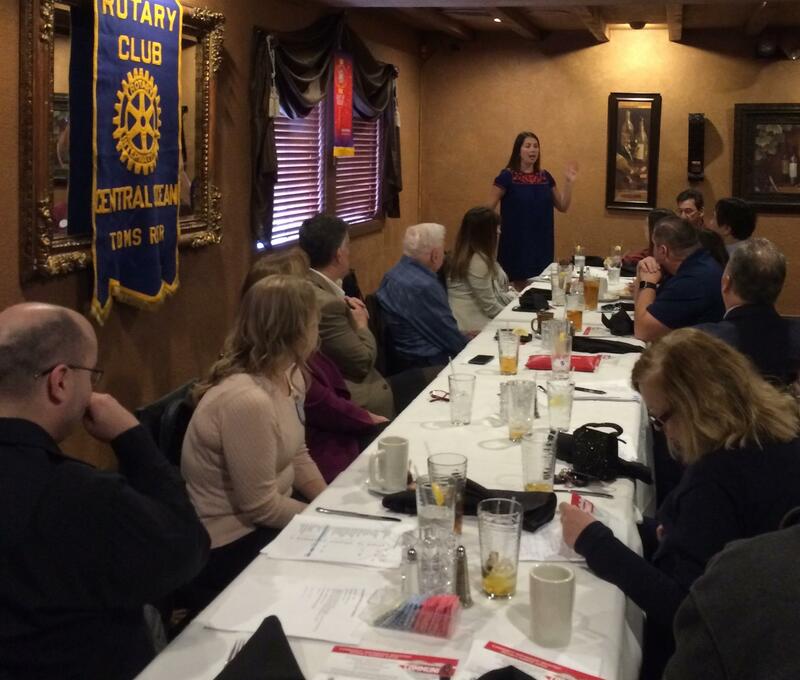 Amanda taught our Rotary members about the process of writing quality journalism! 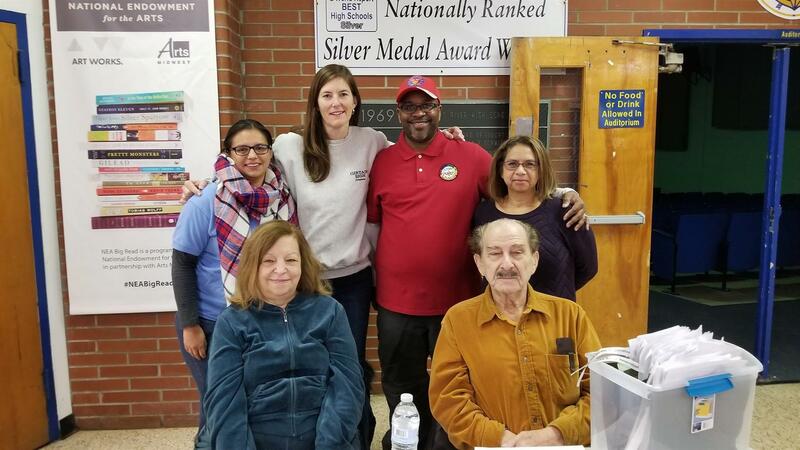 Club members volunteered for the Jersey Shore Council Boy Scouts of America's STEM Merit Badge Academy at Toms River North. 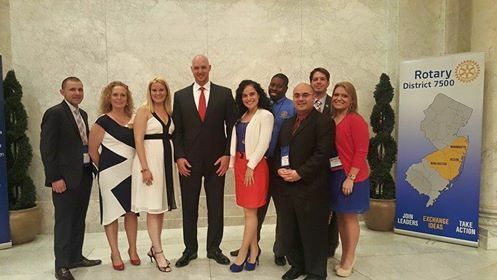 It was great to see all the bright young leaders! Thanks to the Rotarians who were able to volunteer. 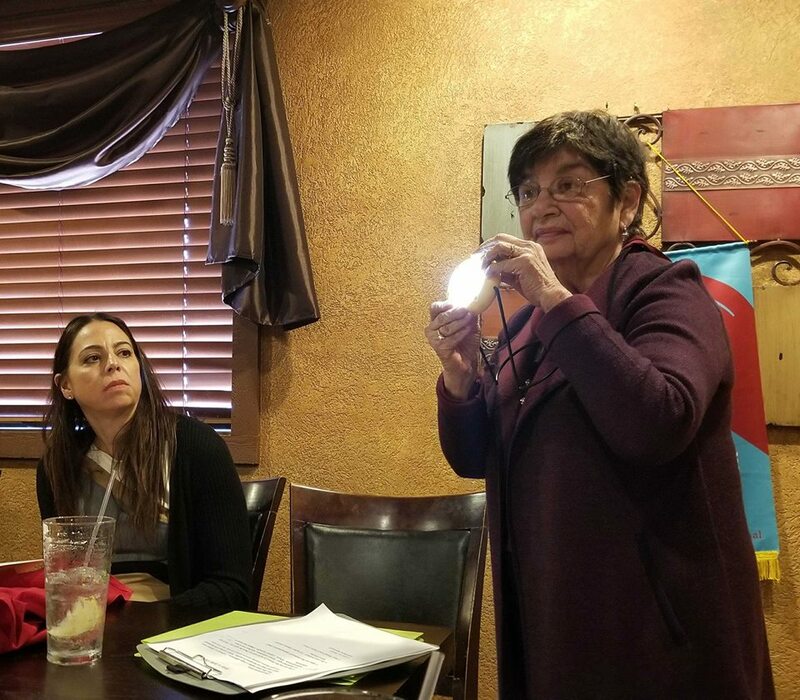 Fellow Rotarians Dara Heidt and Micki Ginsberg from The Rotary Club of Moorestown visited us yesterday to talk to us about their Solar lights for Uganda project. One solar light at a time, they will replace kerosene lamps with solar lights in Uganda. This project will provide at least 400 school children, living in villages without electricity, with solar lamps making it easier for them to work and study. Kerosene lamps have caused burns, eye irritation, breathing difficulties and sometimes fires. We have a twin! 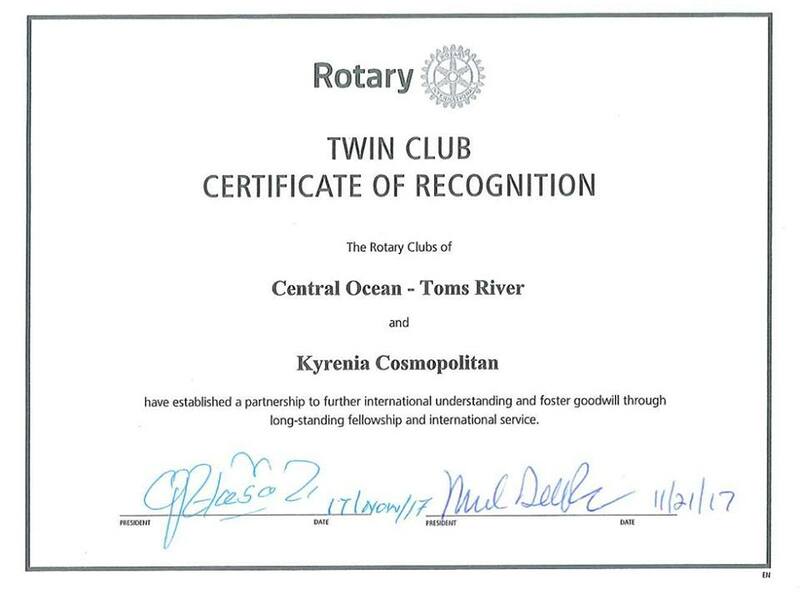 The Central Ocean Rotary Club of Toms River and the Rotary Club of Kyrenia Cosmopolitan located in Kyrenia, Cyprus have become Twin Clubs! Our two Rotary clubs will exchange ideas and learn more about each other to further international understanding and goodwill. Our club and our members look forward to our collaboration! 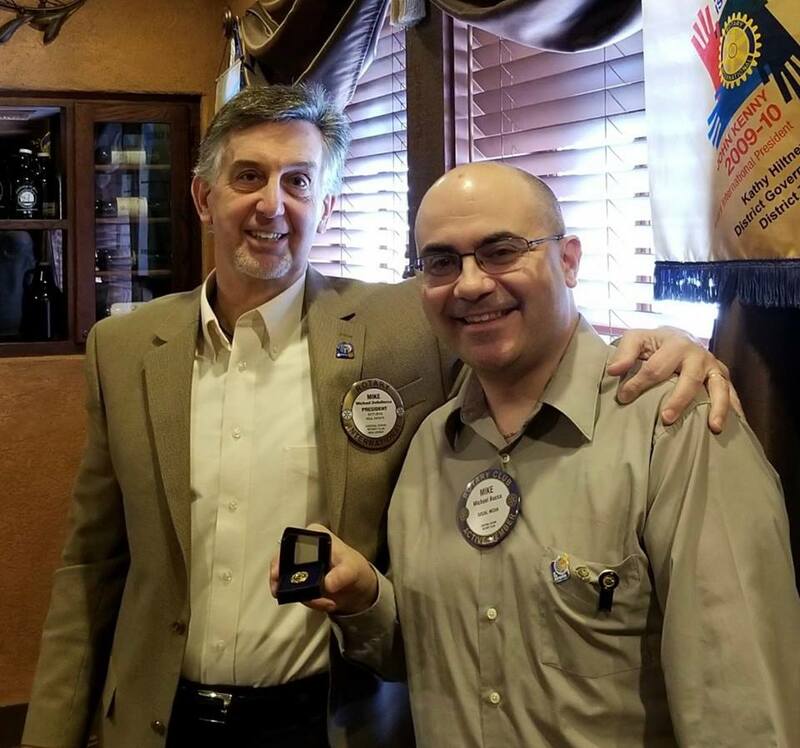 We had the pleasure of inducting our newest member of our club Ben Giovine. Ben currently serves as the president of the Toms River Regional Schools Board of Education and works for New York Life. 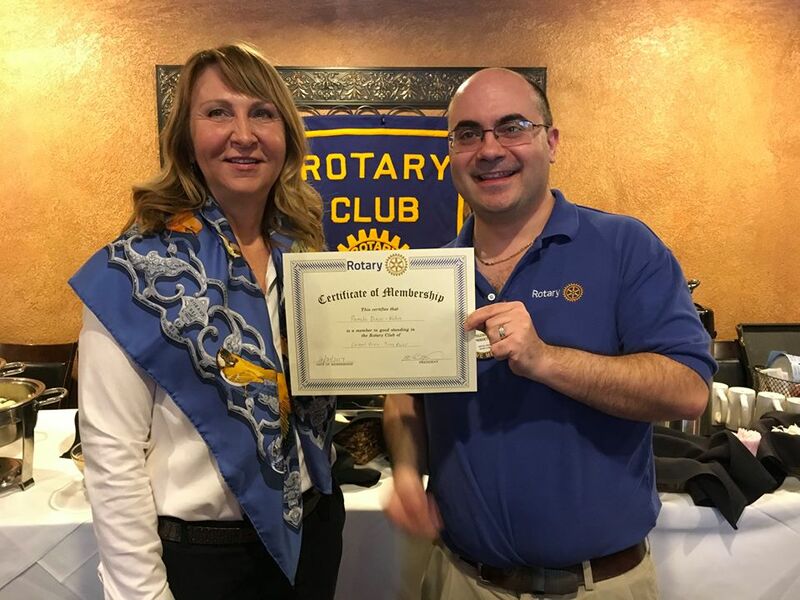 We are so happy to welcome him as a Rotarian. Pictured with Ben is sponsor Christine Girtain and club membership chair Michael Bucca. Members of our club attended the Rotary District 7500 Thanks for Giving Dinner. 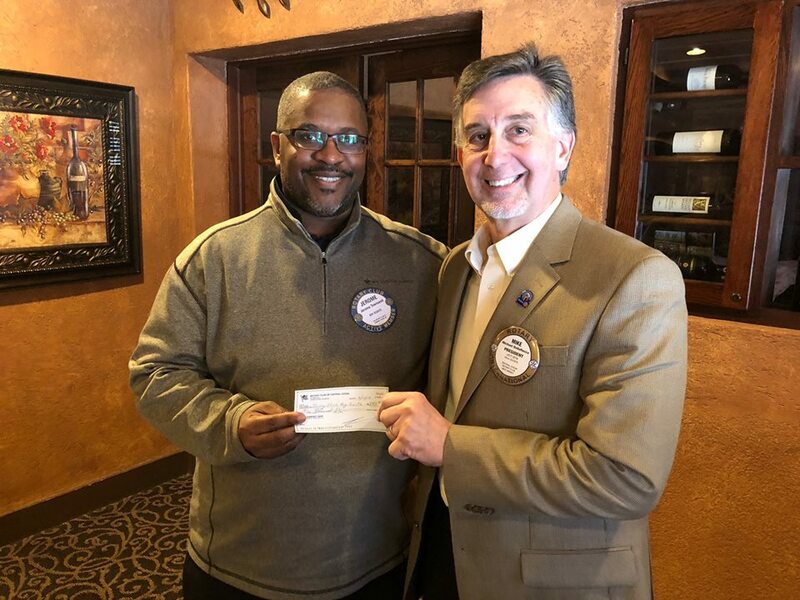 Club president Michael DellaRocca received our Rotary Foundation District Grant, which will be used to purchase laptops for deserving students on their way to college. 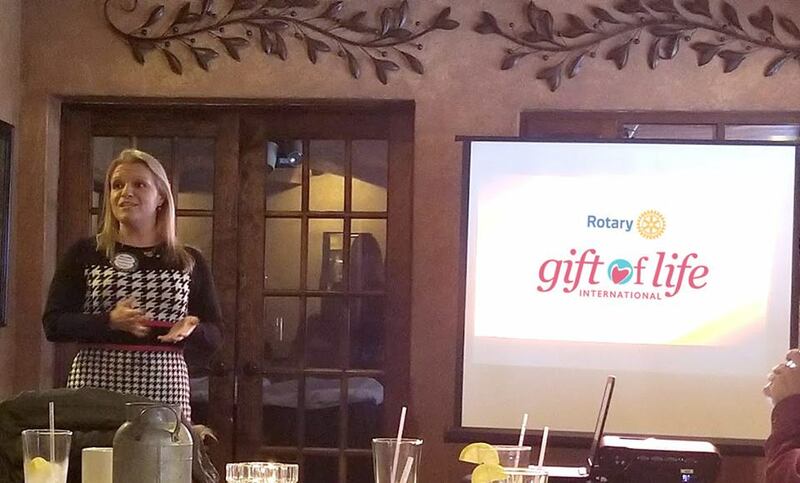 Also, past Rotary International Director Karen Wentz spoke to everyone about the Rotary Foundation. 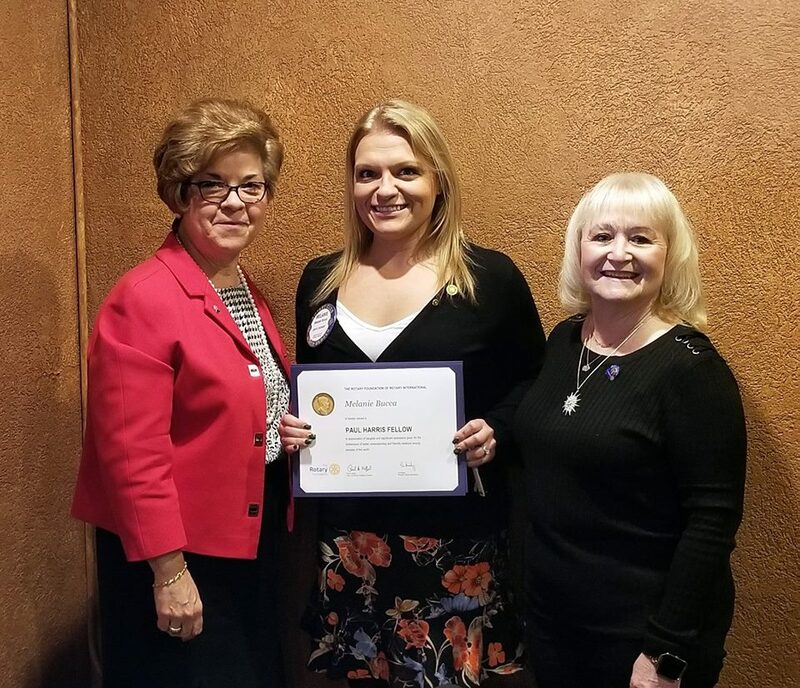 Join us welcoming our newest member Linda Alpay from Home Title Insurance Agency! We look forward to working together making our community a better place! 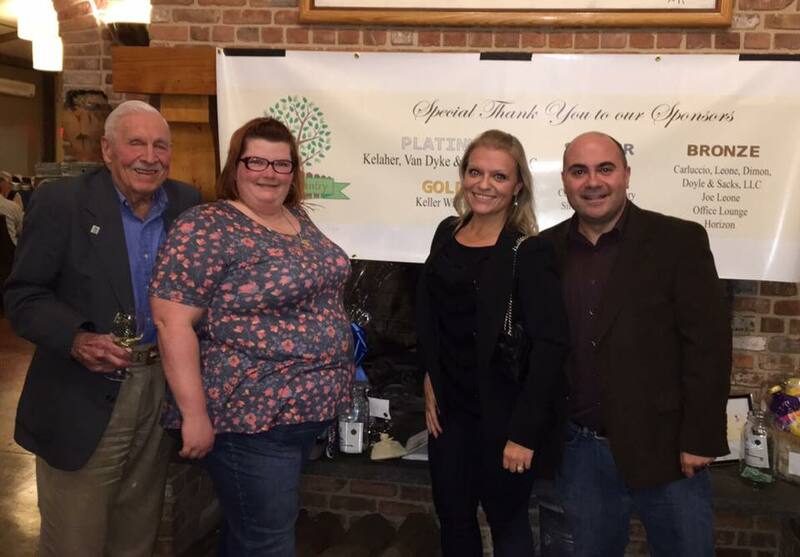 Club members attended the Denim and Diamonds event for The People's Pantry Relief Center at Laurita Winery. 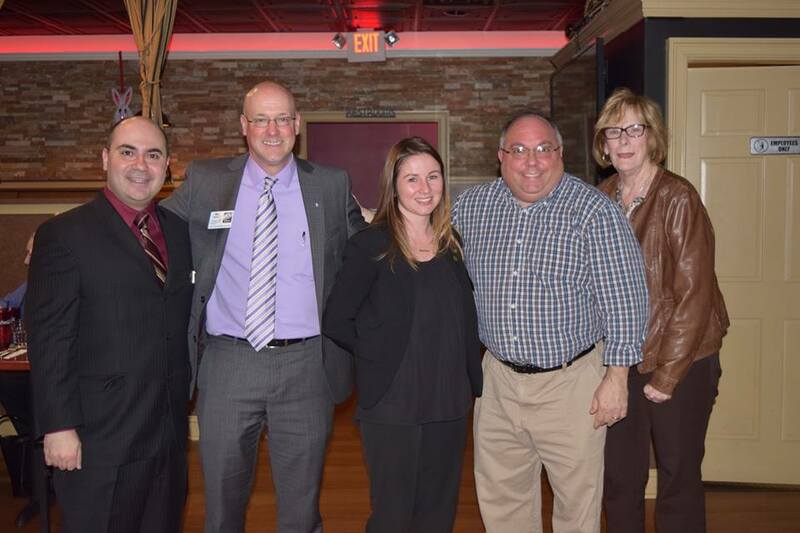 Our club was proud to sponsor the event and support hunger relief in Toms River and Ocean County. Venus Majeski from the New Jersey Institute for Disabilities (NJID)stopped by on Tuesday to tell us about her organization. 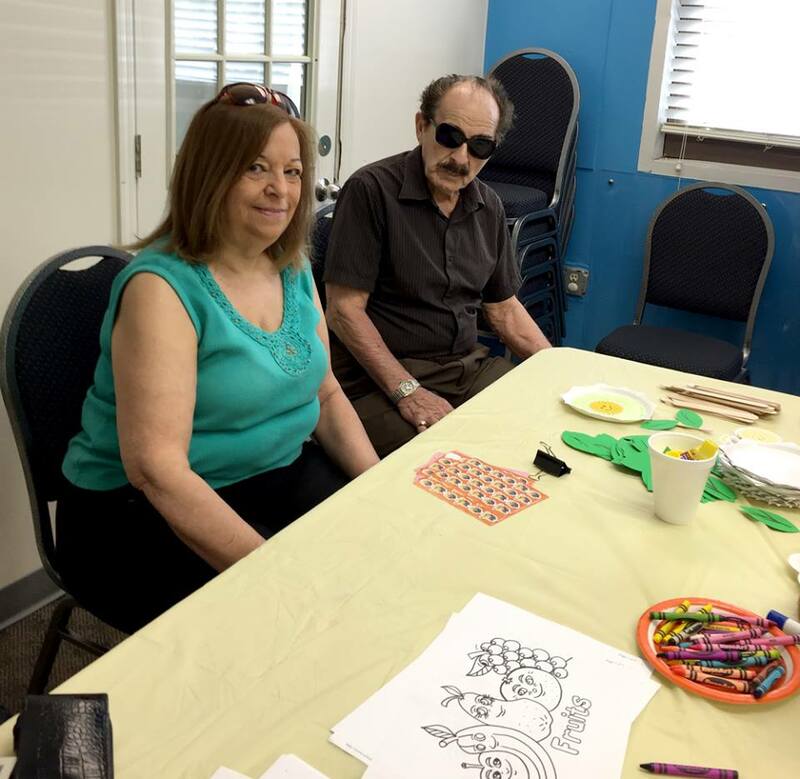 NJID offers specialized programs and support for infants, children and adults with disabilities throughout the state. With a dedicated staff of more than 500 employees and 41 program sites throughout the state, NJID is one of the largest not-for-profit agencies of its kind in the nation. Each year, more than 1500 infants, children, and adults with disabilities and their families are helped by NJID's unique continuum of services. 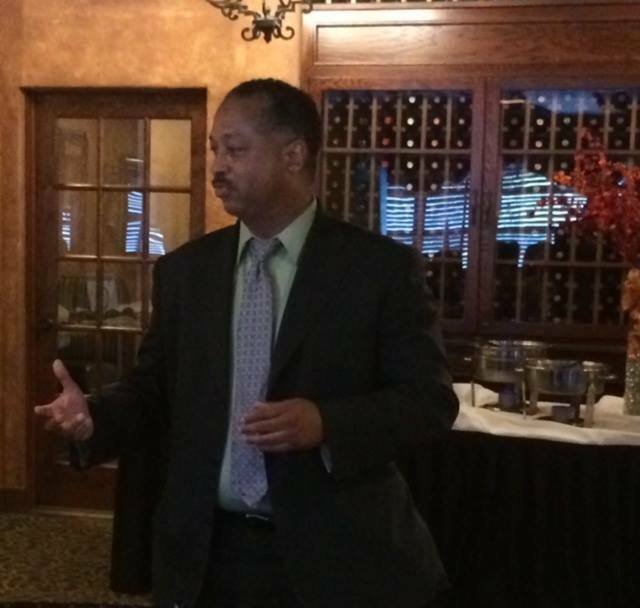 Channel Wilkins, President CEO of O.C.E.A.N., Inc. stopped by to talk to us about the great things they do for our community. Regretfully, the Rotary/People's Pantry medium event on Friday, October 6th has been cancelled. If the event is rescheduled we will let you know. We thank you for your continued support. 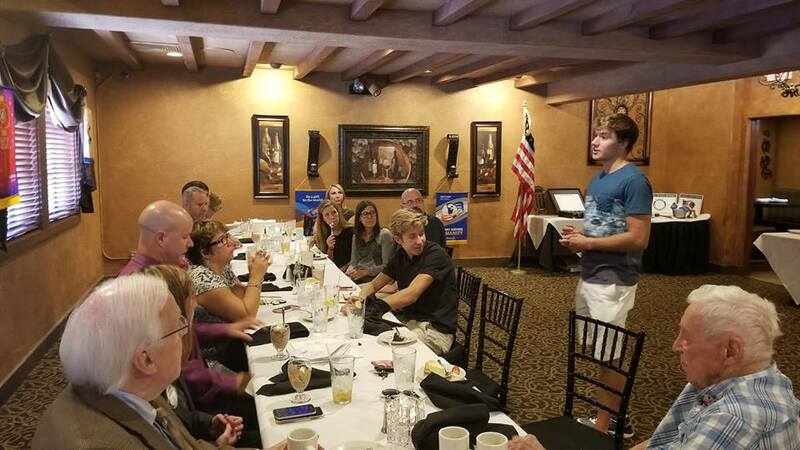 Thank you Dr. Anthony Pellegrino of Absolute Chiropractic for your discussion with our club about approaches to wellness from a proactive versus a reactive way. Thank you also for your efforts to assist with Hurricane Harvey relief efforts in Texas. 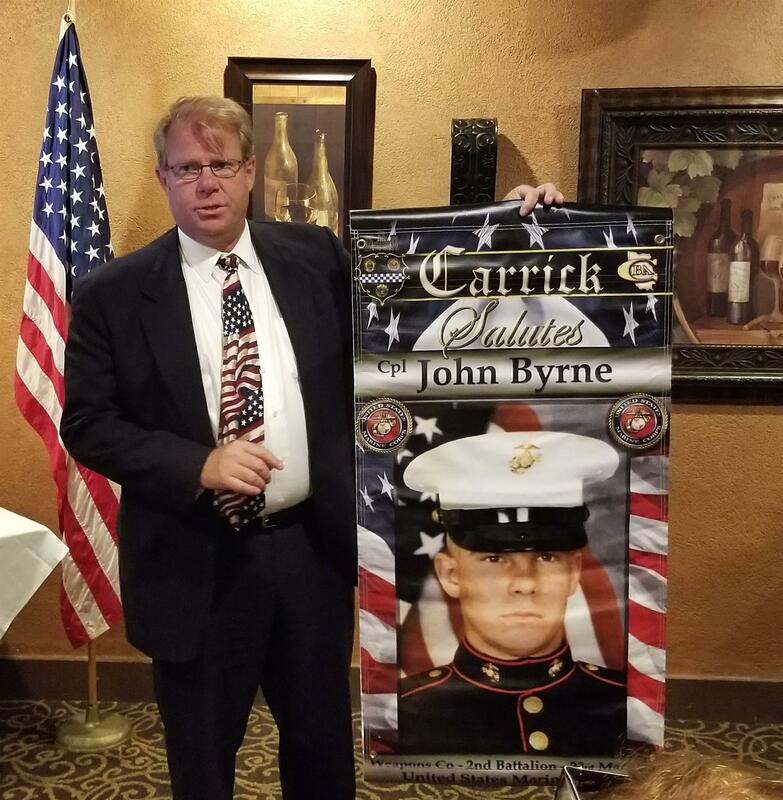 Thank you, fellow Rotarian John Byrne from Rotary Club of Toms River, for coming on Tuesday to talk to us about the Military Troop Banners Program in downtown Toms River.The Military Banner Tribute Program salutes our brave men and women honorably discharged who serve, or have served in the military by displaying military banners in the community between Memorial Day and Veterans Day. Our meeting was very educational. 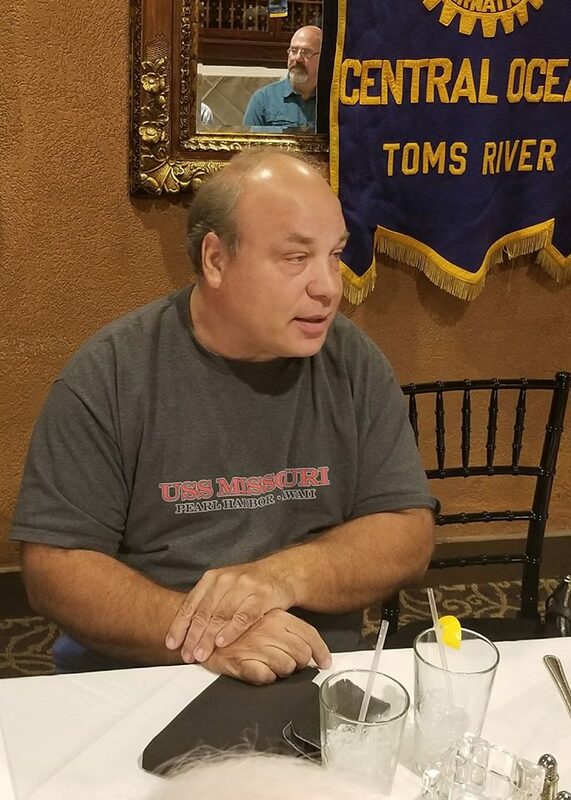 Our guest, Steve Baeli, talked to us about the history of Toms River. Did you know that there were Ocean County residents on the Titanic? 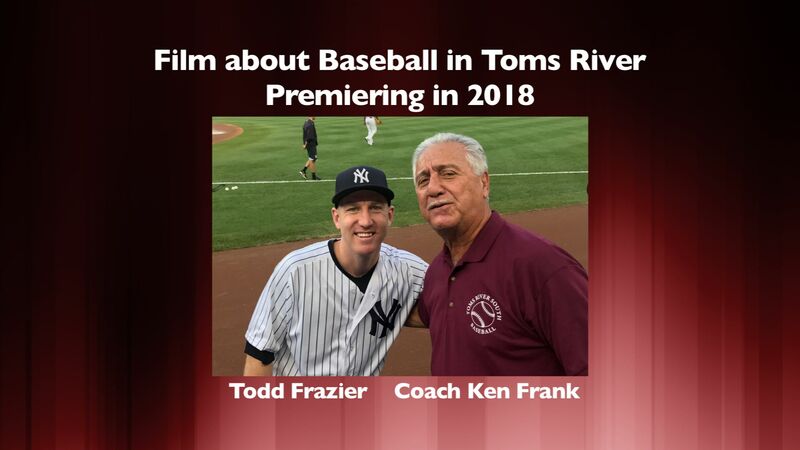 Did you know that Toms River used to be part of Shrewsbury back in the day? We learned a ton about our area yesterday, thank you Steve! 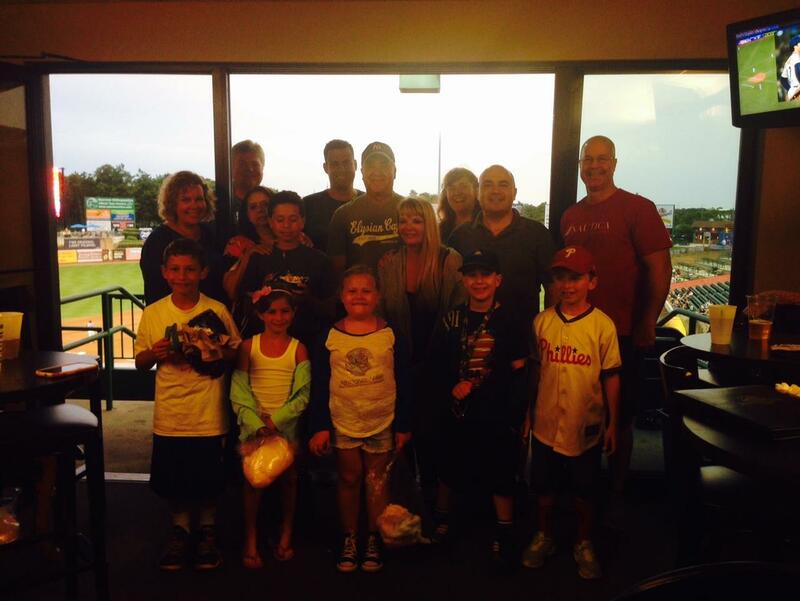 Club members enjoyed a night with friends and family at our annual excursion to the BlueClaws. Buster stopped by of course! Let's go BlueClaws! We had the pleasure to have Harbor House as our guest. For those who don't know, Ocean’s Harbor House is dedicated to assisting homeless, runaway, abused, neglected and abandoned youth, ages 10-21 not only from Ocean County but all New Jersey. They provide a safe haven and caring environment for vulnerable youth to enable them to unlock their potential and learn skills that will empower them to build healthier lives, relationships, and futures. 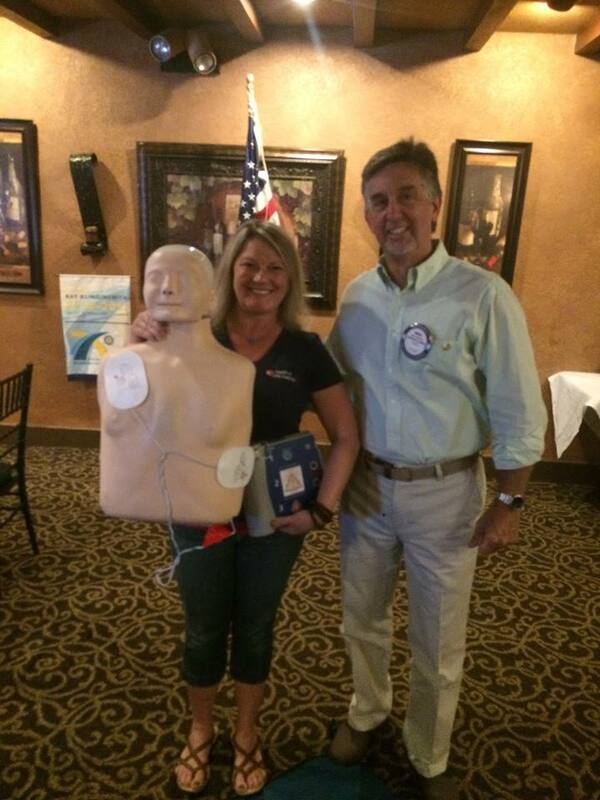 Cherie from Hands on CPR Training was our guest. What a cool meeting we had! She demonstrated CPR and choking techniques and showed us how to use the AED machine during an emergency. Thank you Pete, Jim, Mark and George for representing us! 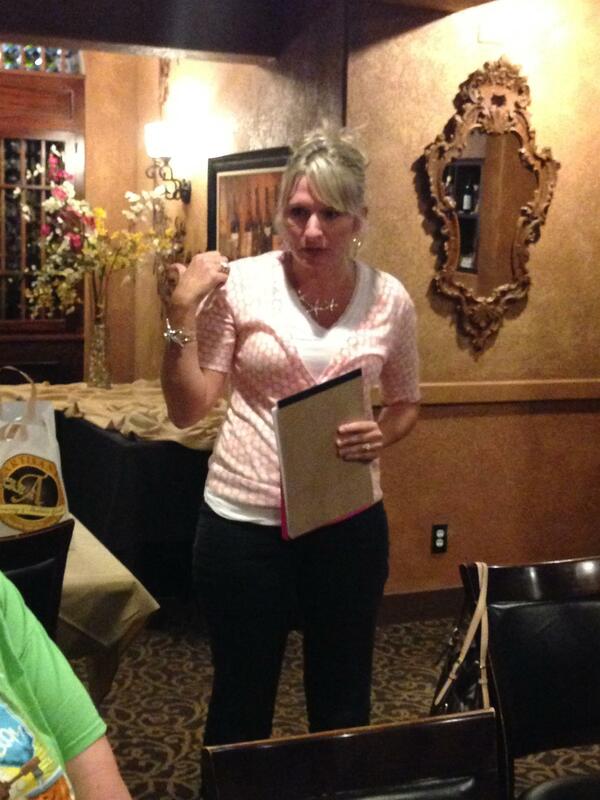 Join us welcoming our newest member Noelle Carino from Greater Toms River Chamber of Commerce!!! She is a great addition to our club and we look forward to working together making our community a better place! Our guest Mark Frey from FocalPoint Business Coaching & Training Mark Frey taught us that to be successful in the workplace we need knowledge, skill and most important attitude! 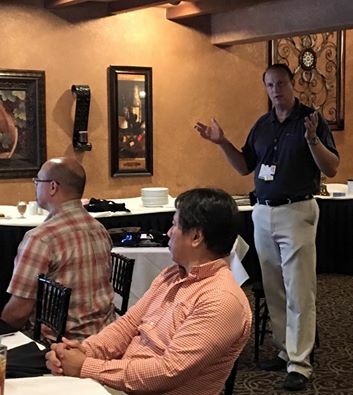 Mark helps business owners become more profitable, develop more engaged, better-trained employee teams so they can maximize the value of their company. 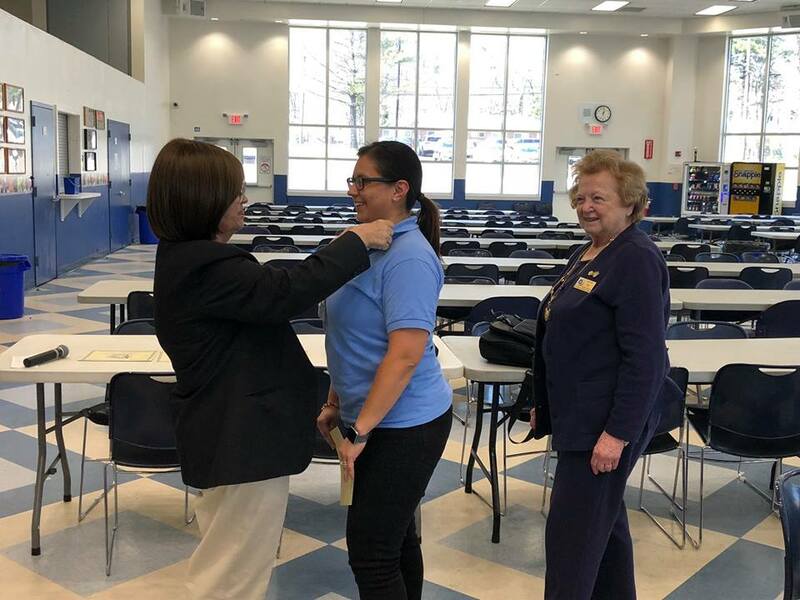 Our guest speakers came from Caregiver Volunteers of Central Jersey - CVCJ - Multicultural Outreach Coordinator Carol Gibbons and Volunteer Ambassador Linda Phander. We were pleased to welcome Suzan Fichtner from Northern Ocean Habitat for Humanity as our guest speaker. She talked to us about the great job her organization does in our area to help build decent, affordable housing and to create healthy, vibrant and self-sufficient communities. 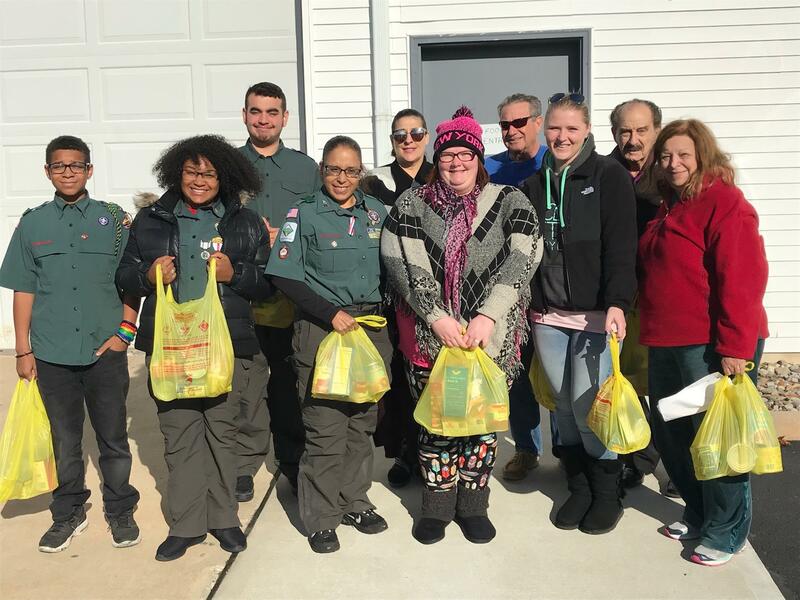 Central Ocean Rotary club members pitched in at Beaver Day for the Jersey Shore Council Boy Scouts of America at the Citta Scout Reservation in Barnegat. Our members volunteered their time to assist with various tasks at the event. Our club is proud to support scouting with both service and funding. 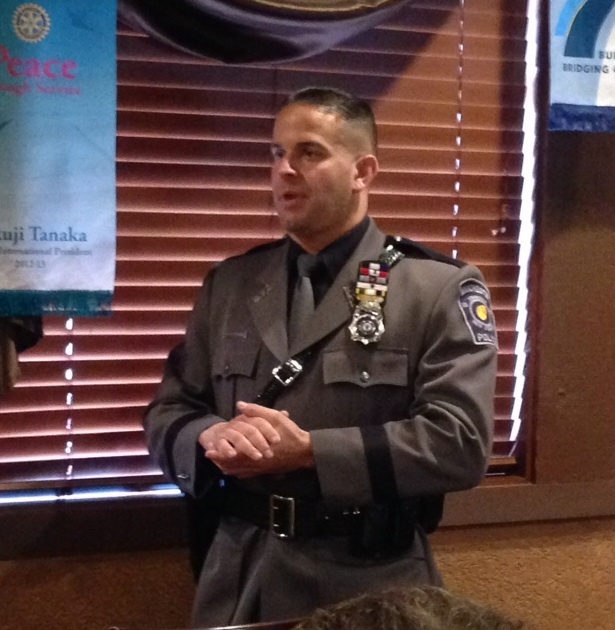 Yesterday, guest speaker Art Cronk joined us from the Manchester Police Department and talk to us about the Police Unity Tour. The tour's primary purpose is to raise awareness of Law Enforcement Officers who have died in the line of duty. Their secondary purpose is to raise funds for the National Law Enforcement Officer’s Memorial and Museum. We also presented him with a check to support him on the tour! 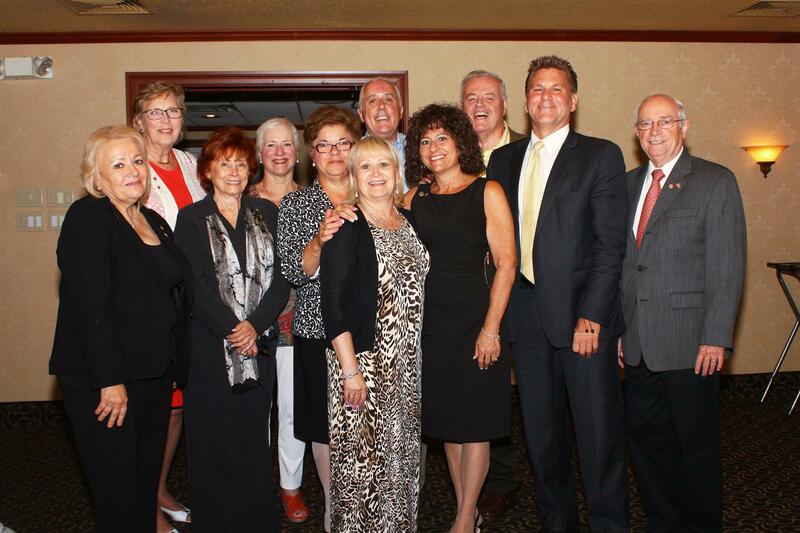 Central Ocean Rotary hosted it's 7th Annual Gift Auction at the Clarion in Toms River. Hundreds of gifts were raffled off to benefit local charity and the club's scholarship program. More photos of the event can be found on our Facebook page. 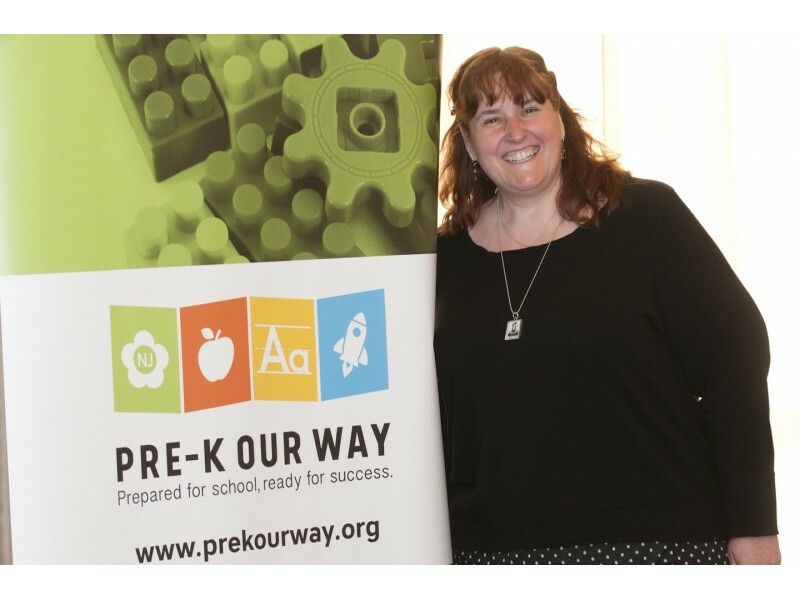 We are happy to welcome Pamela Dixon-Kuhn as a new member! Pam has been involved with our club in the past when she taught at High School North by bringing students to present their Authentic Science Research presentations. She is going to be a great addition to our club! We continued hearing presentations from the Authentic Science Research students from the Toms River Schools. Today's presentation was by High School North student Nicolette Carbonetto. Her project centered around the effect of music on student's performance. Rotarians asked her questions that hopefully will help her further prepare for future presentations. 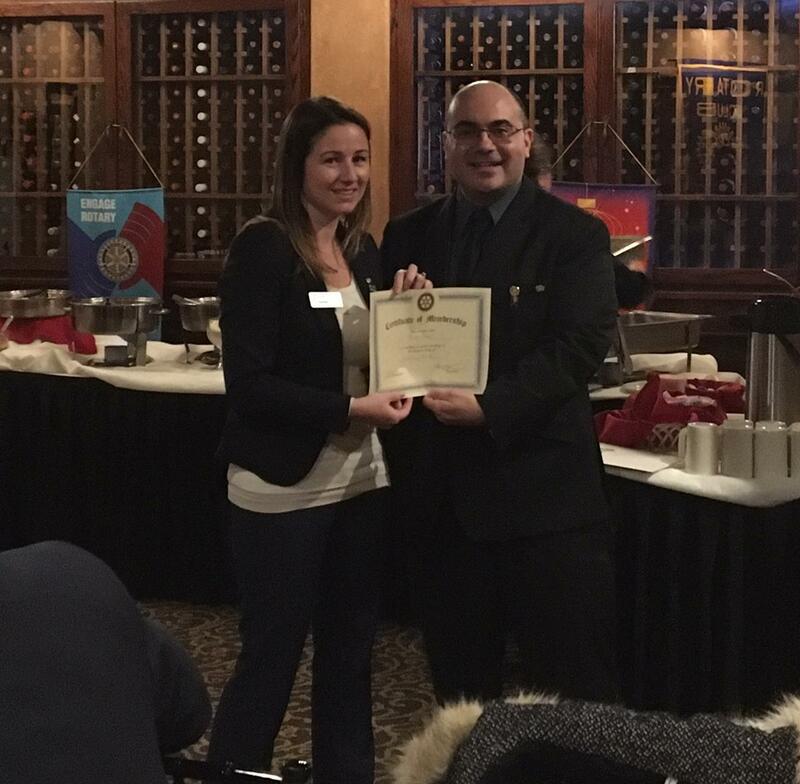 We're happy to induct Jennifer Dreher from TD Bank into our club. 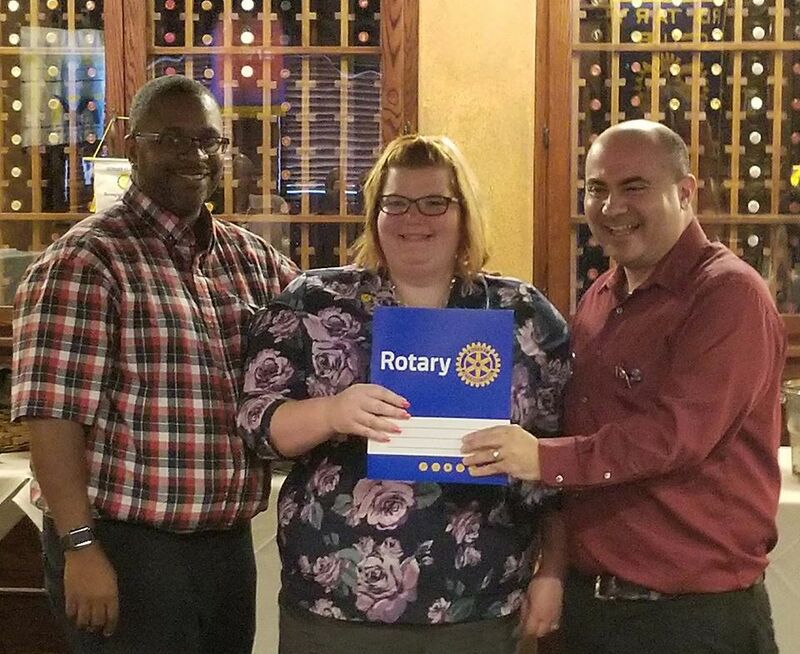 Along with other Rotarians, Jennifer hosted the Rotary Means Business event with us last November, and she is actively helping to start a Rotary club in the Bayville area. Welcome aboard! 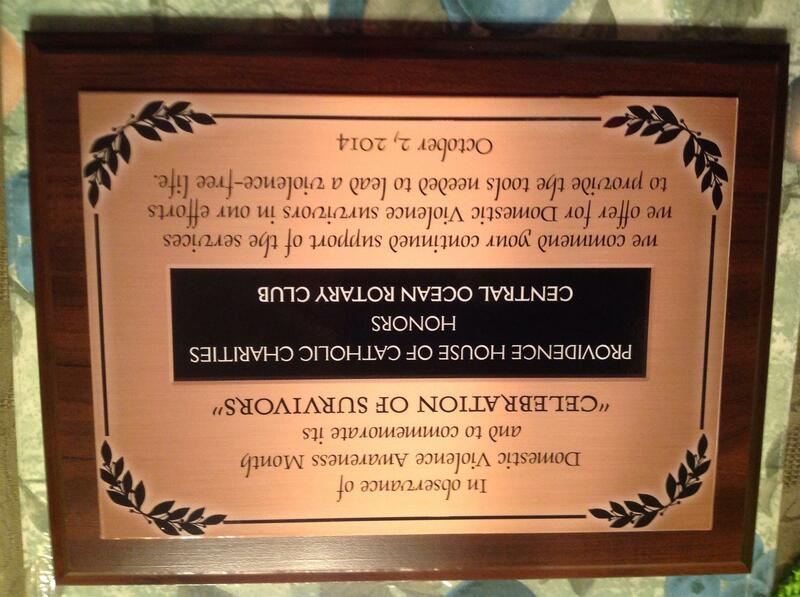 Congrats to past president Chris Koerner on receiving a vocational service award from our District 7500. 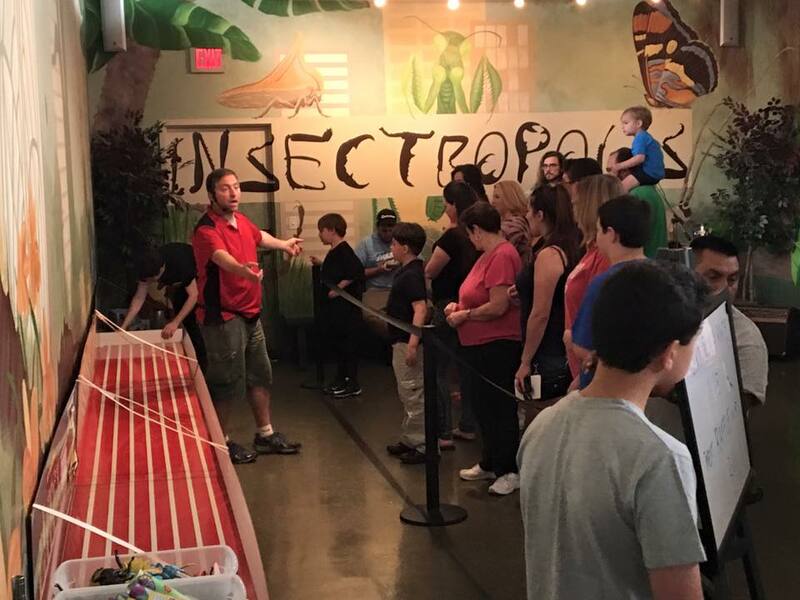 Chris owns Ozane Pest Control and Insectropolis Bugseum in Toms River and has successfully run our Bugfest fundraiser for many years. 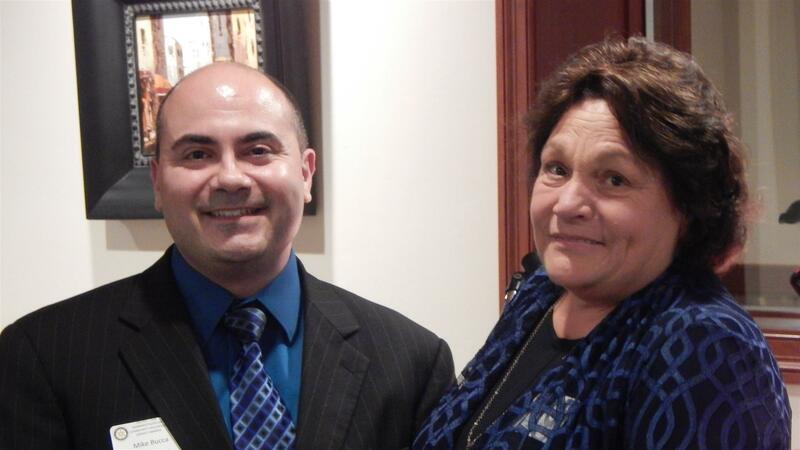 Pictured with Chris is District Governor Elect Diane Rotondelli. More than a dozen club members and their family came out to help decorate the Ocean's Harbor House in Toms River. Rotarians put up the lights on the house itself, trees in the yard, and the office building to get the staff and residents in the holiday spirit. 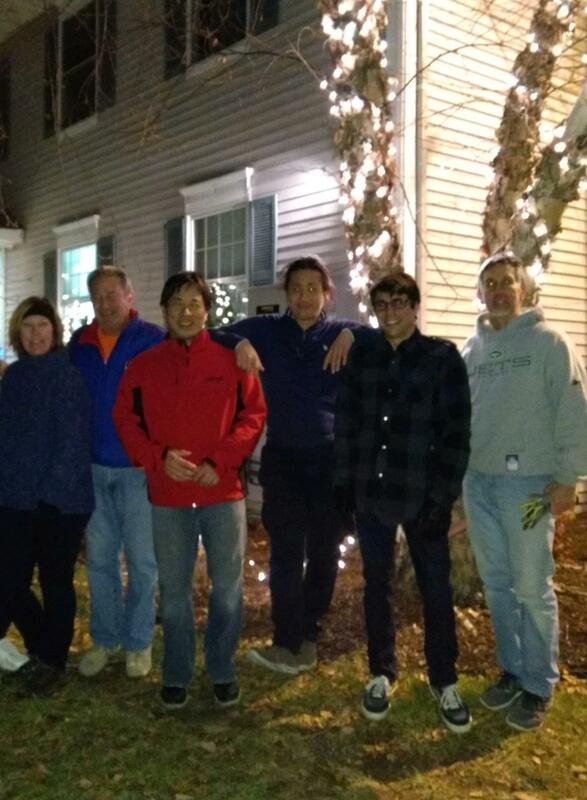 The effort was led by our Christmas light expert Henry Hengchua. 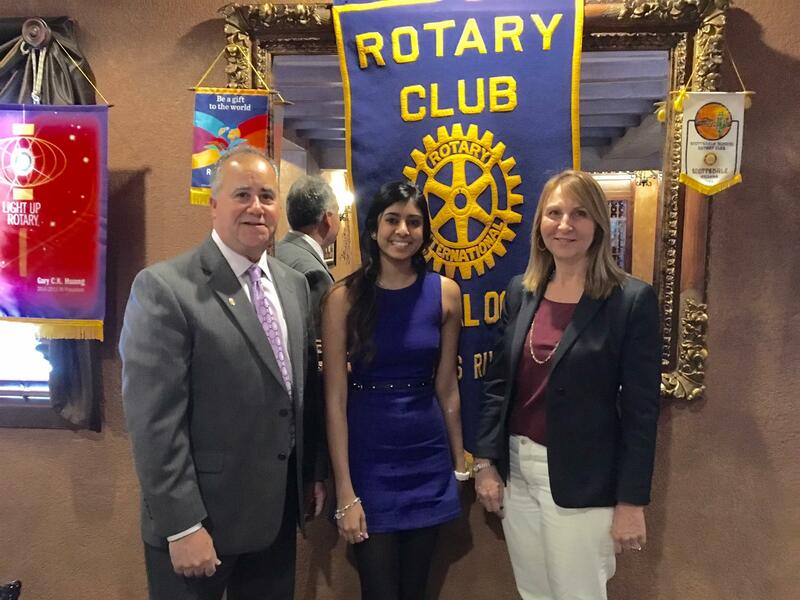 We were joined by two students who attended this year's Rotary Youth Leadership Awards (RYLA) program. These students learned skills that will propel them to be tomorrow's leaders. They both shared great stories of their experiences. 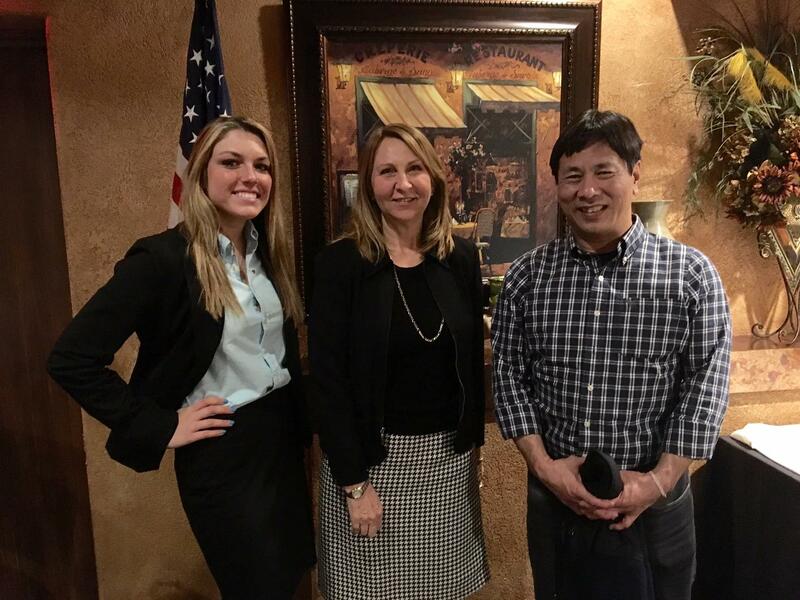 Pictured with them is our club's RYLA coordinator Henry Hengchua, Toms River High School South teacher and club member Christine Girtain, and club treasurer Mark Rushwald. 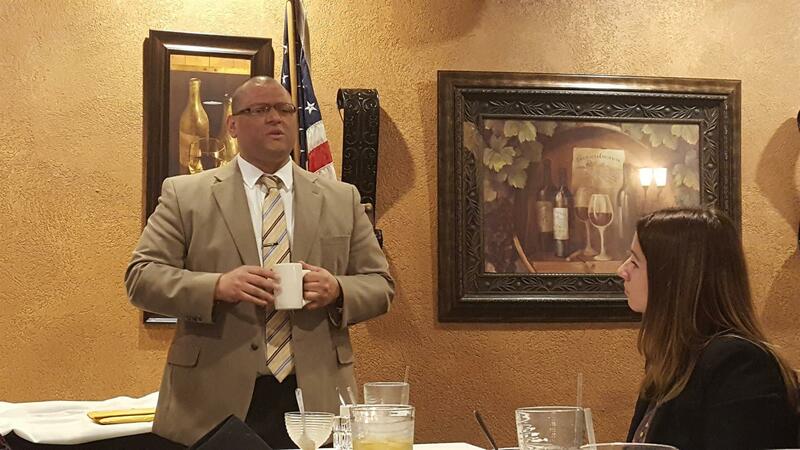 We were joined at our weekly lunch meeting by Rick Pallamary and Christine Filippone from Community Medical Center. They informed our club of what was going on at the hospital plus gave us an educational lesson on infectious diseases and ways to manage them. 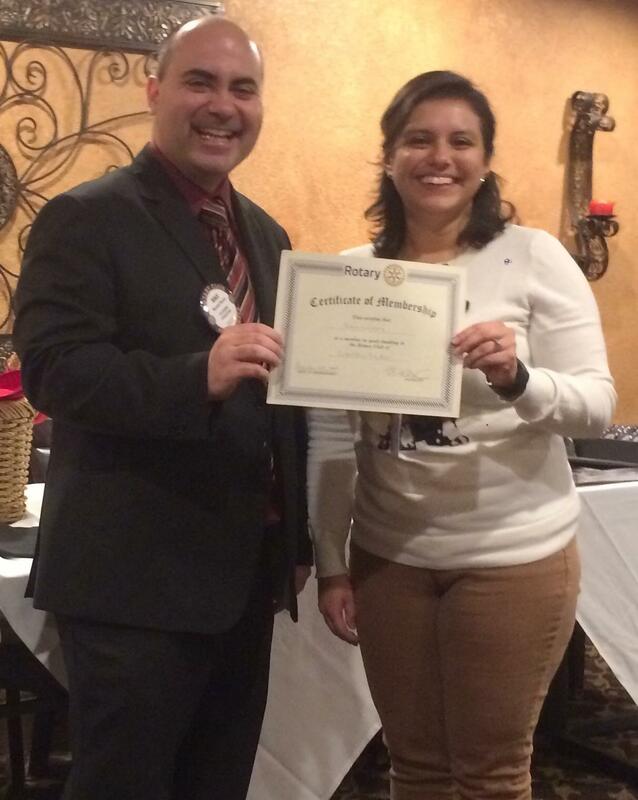 We inducted the newest member of our club at our weekly meeting: Dominick Leone from Diane Turton Realtors. Dominick is pictured with club president Michael Bucca after the induction ceremony. Our club particpated in Stop Hunger Now's meal packing project. 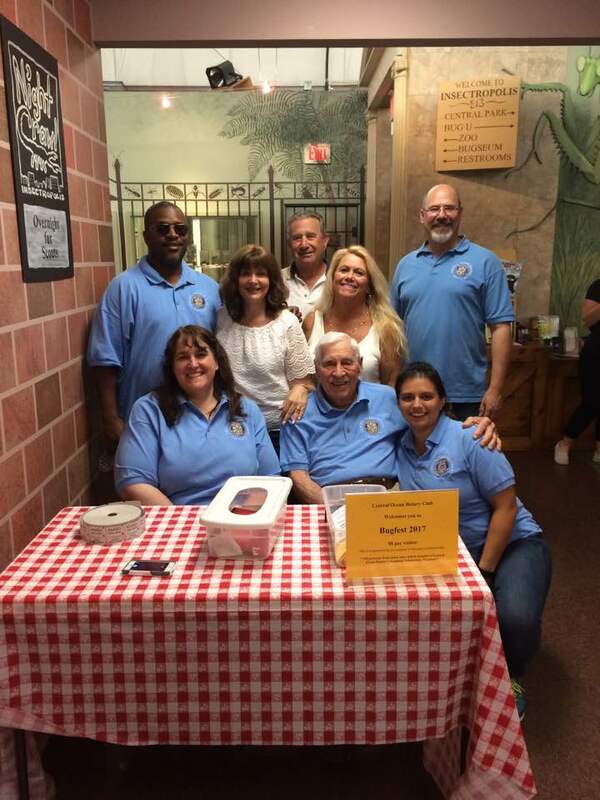 Members of Rotary clubs around Ocean County plus other volunteers worked to bring an end to hunger this weekend in Manahawkin. 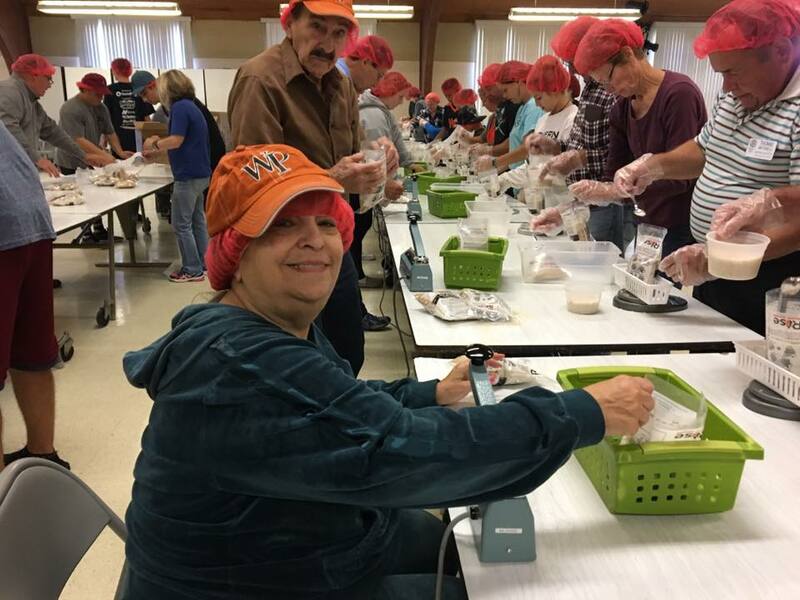 The volunteers packed meals in an assembly line formation within specialized crates to be shipped nationally and internationally to areas around the world with a shortage of food. 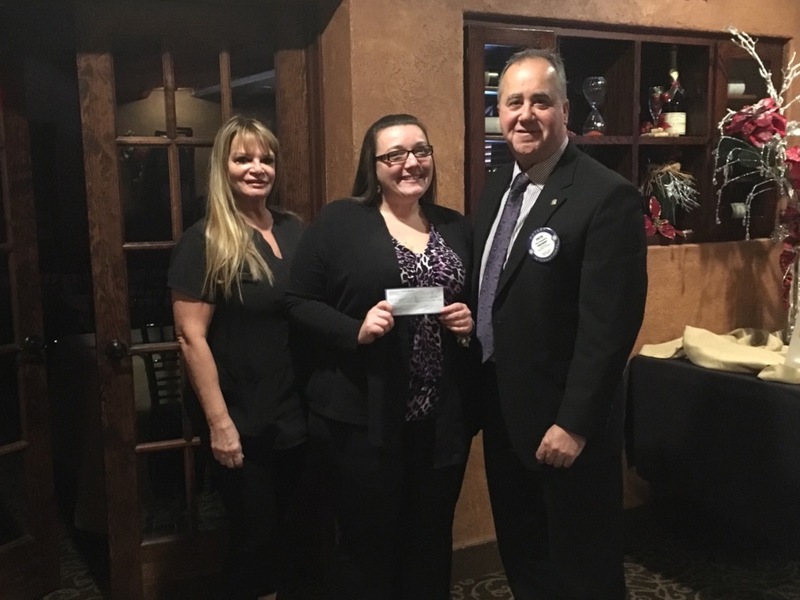 Over $5,000 was raised at the event from contributions from Rotary clubs, businesses, and individuals to fund the costs of the meals to help end hunger. 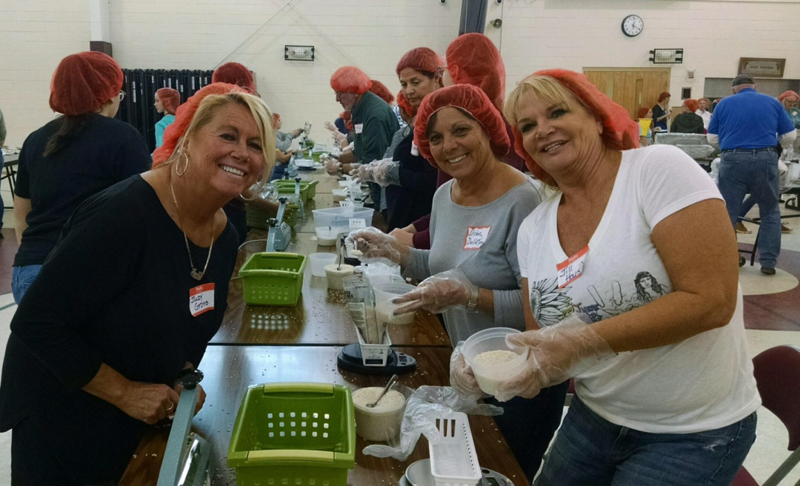 Two other meal-packing events took place in Monmouth and Burlington Counties. 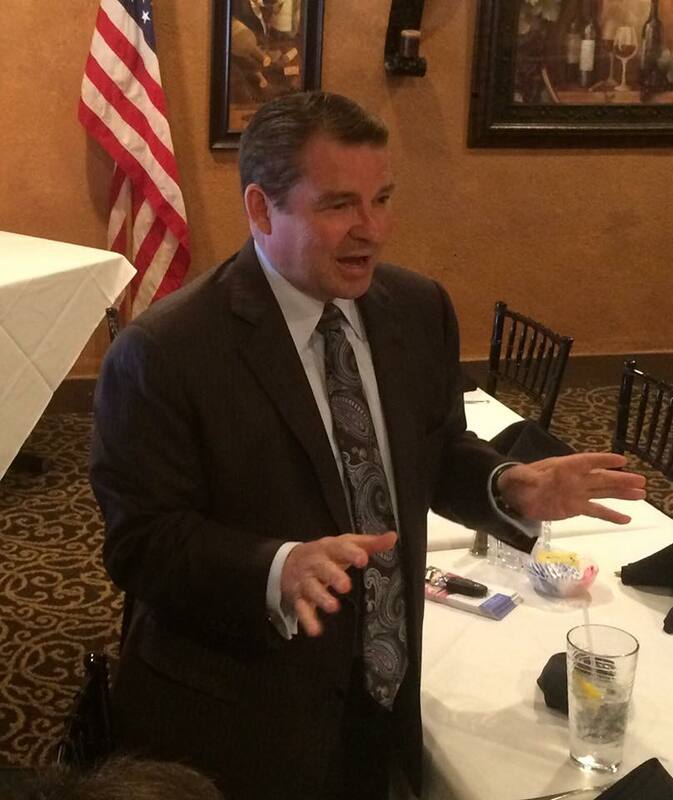 We were honored to be joined by Toms River Mayor Thomas Kelaher at our regular lunch meeting. The mayor brought us up to date on issues in Toms River and thanked members of the community for their volunteer service. Central Ocean members participated in The Toms River Regional Schools' Jersey Shore MakerFest, held at the Pine Belt Arena. Kids and families got to see various ways of creating using art and technology from several dozen vendors and companies. More photos in the photo albums. 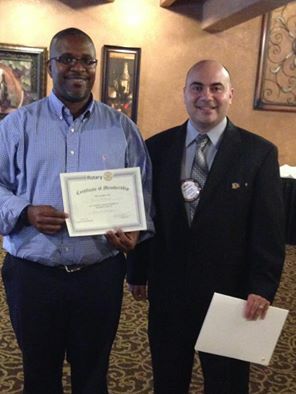 Today we inducted a transferring Rotarian to our club. 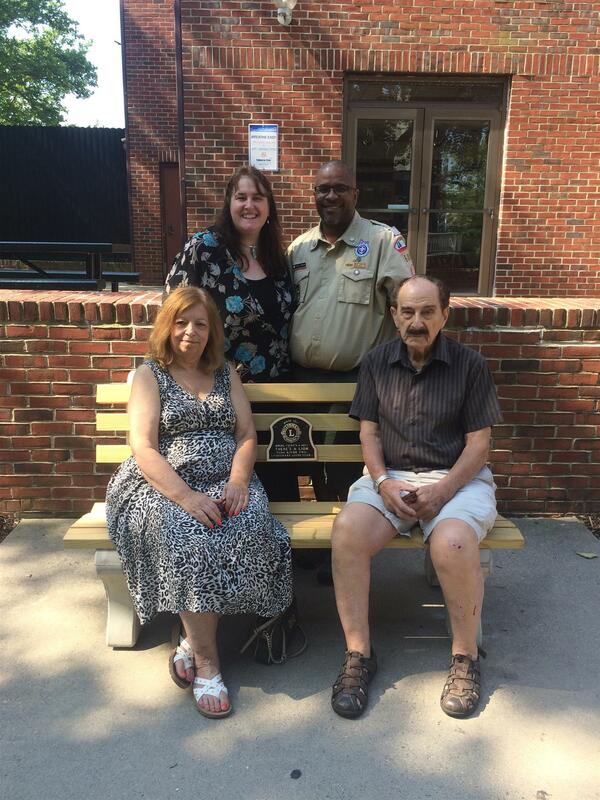 Jerome Townsend comes to us from the Brick Morning Rotary Club and is with the Boy Scouts Jersey Shore Council. Jerome is a great guy and we are so happy he has come to our club. 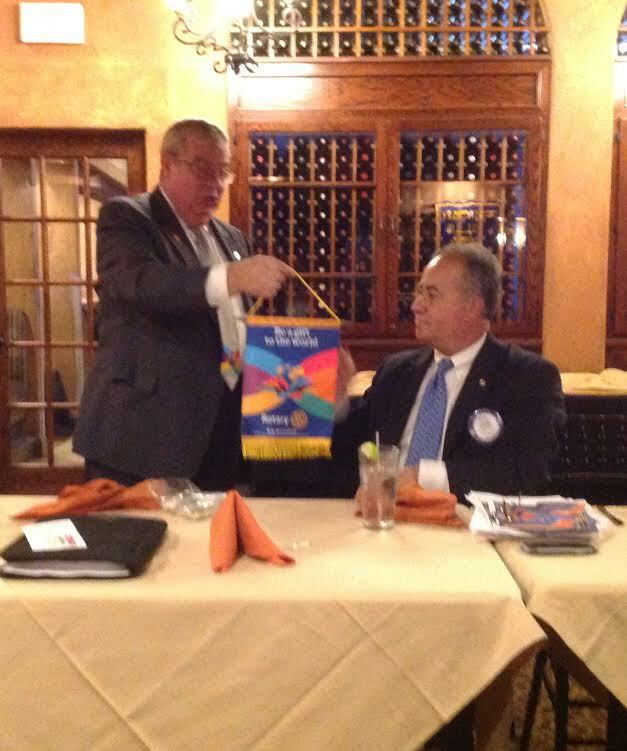 We were visited by our District Governor David C. Forward and Area Governor Elizabeth Ackerman at our meeting today. David and Elizabeth brought us up to speed on the new initiatives being undertaken by the district this year. 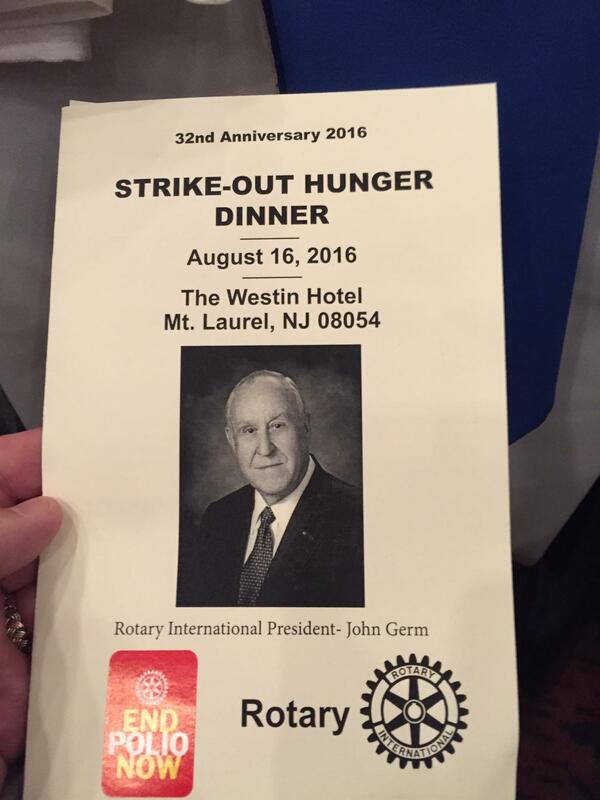 Our Central Ocean Rotary president Michael Bucca attended the annual Strike Out Hunger dinner, co-sponsored by Rotary International and the Philadelphia Phillies. Rotary International President John Germ spoke to the crowd celebrating the 30-plus year relationship between Rotary and the Phillies to end hunger. Dave Greiner from the Oyster Creek Nuclear Power Plant came to educate our members on nuclear power. 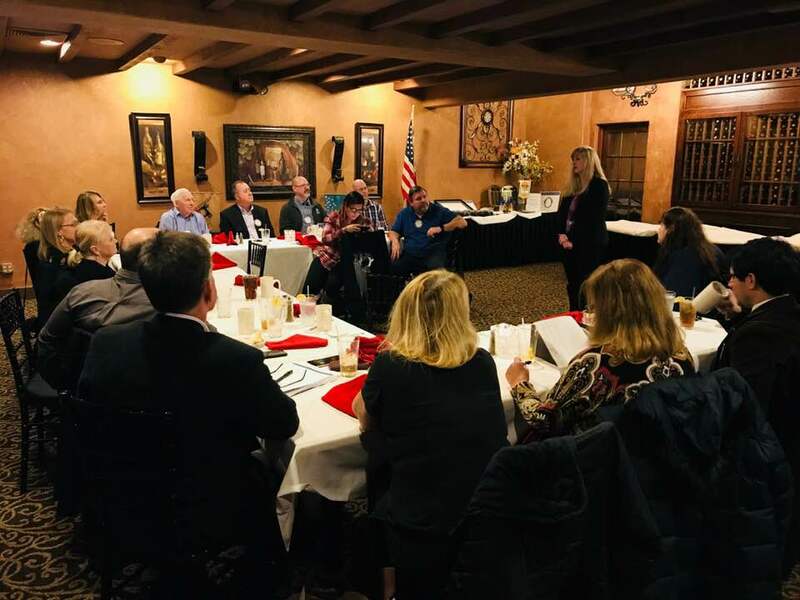 Our club members also learned of the impact to our community when the plant closes in 2019. 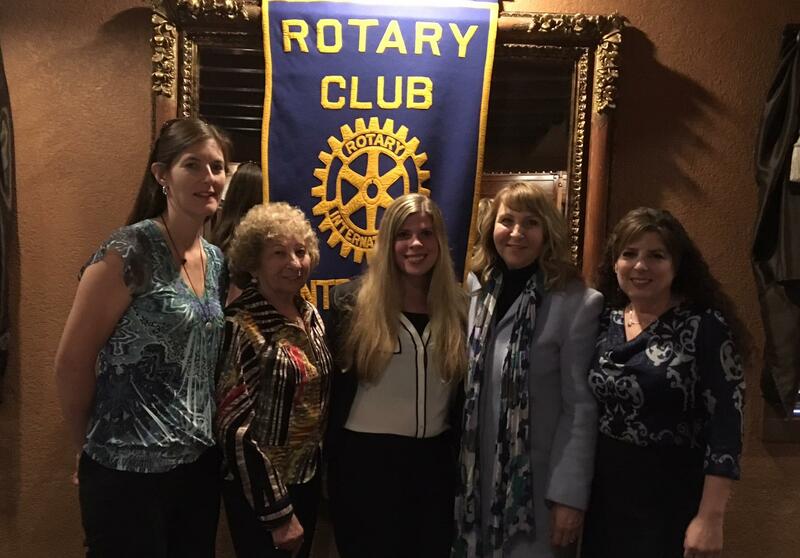 Central Ocean Rotary members attended the annual Gift of Life dinner held at the La Bove Grande in Lakehurst. Gift of Life provides life-saving heart surgeries for children across the world who do not have access to the medical care needed. Pictured are the current District 7500 Gift of Life board of trustees with representatives of Gift of Life International. 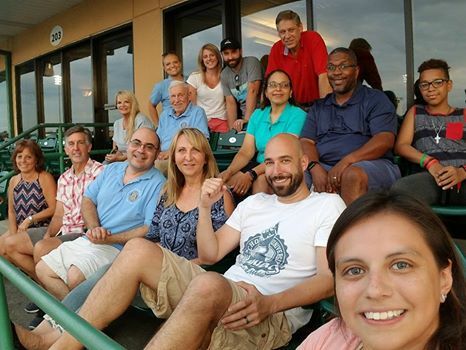 Members of the Central Ocean Rotary Club attended the BlueClaws game and enjoyed fellowship with family and friends. Rip Tide came in for a visit with our members! 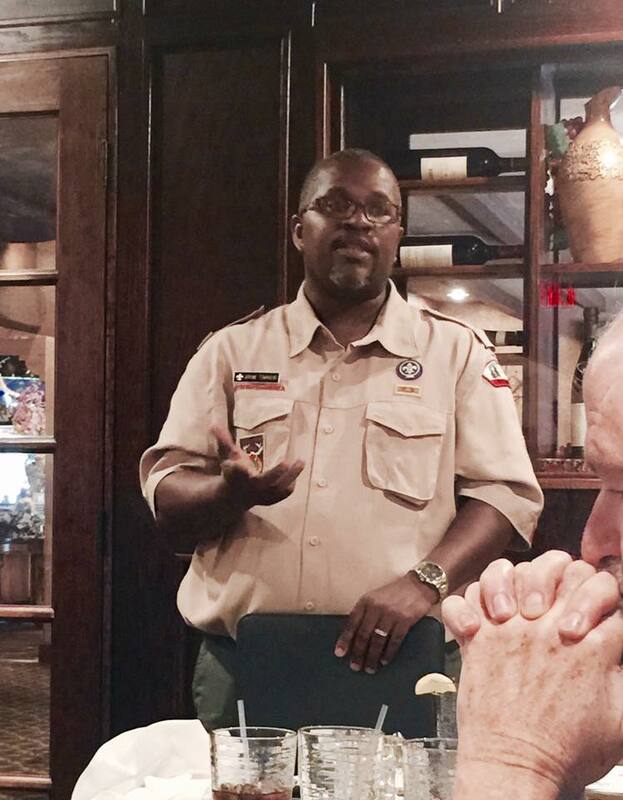 Jerome Townsend of the Boy Scouts of America Jersey Shore Council joined us at our meeting and updated what the scouts are up to in Ocean County. Our club was proud to participate in the Carmelena Cares golf outing, supporting a great cause helping to purchase electric bikes for disabled children. 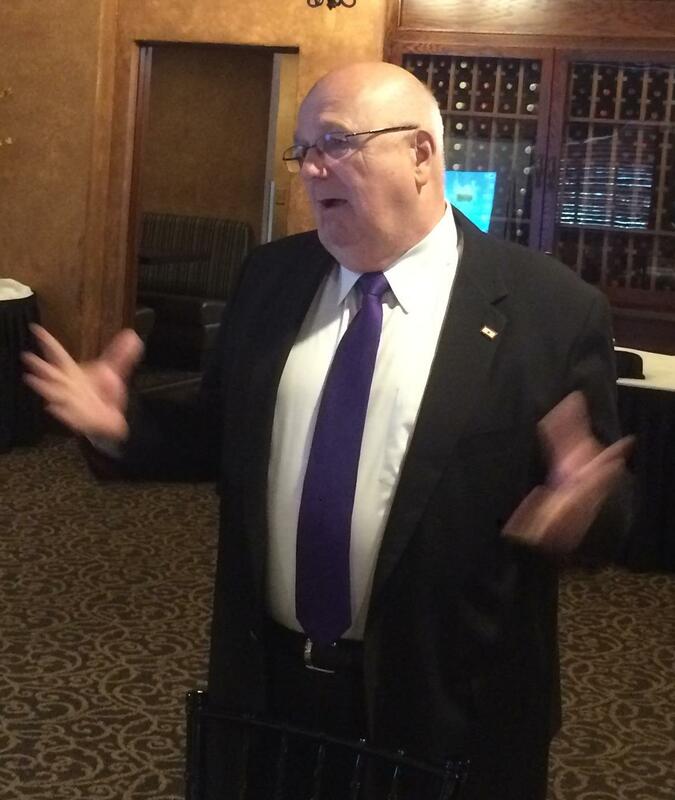 We installed the new President of our club, Michael Bucca. 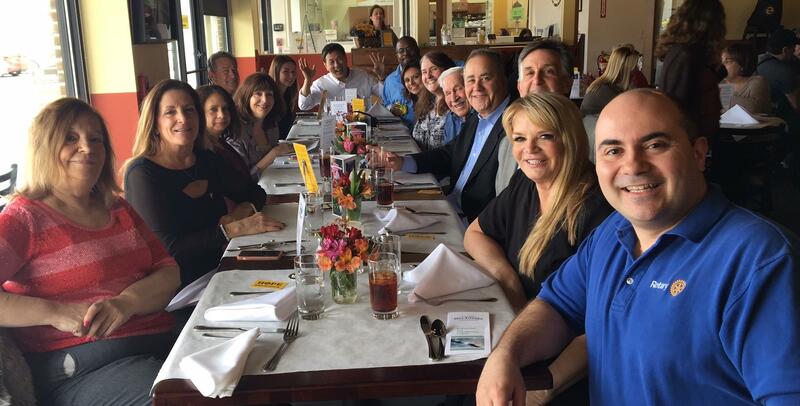 Members, family, and friends came out to the La Bove Grande for fellowship and support. Michael and his wife Melanie look forward to a great year of service to the club. A special thank you to Sheila Vinton and Diana Rotondelli for being a part of the ceremony. We also honored Michael DellaRocca with a Paul Harris Fellow and Chris Koerner with our Service Above Self Award. Photos of the event are located in the photo albums. Hundreds of people turned out for BugFest 2016 at Insectropolis in Toms River. Pictured are one of the runnings of the cockroach races! 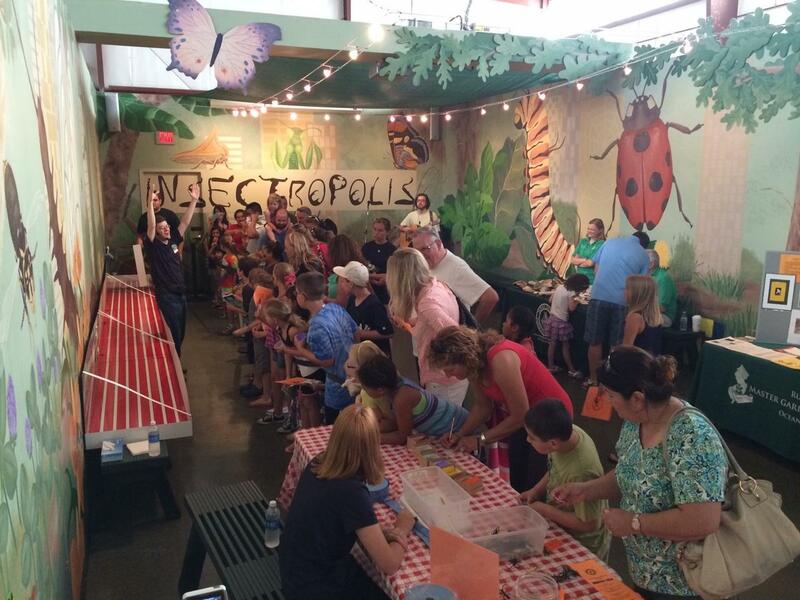 Insectropolis and Ozane run the event every year and donate the proceeds to our club. 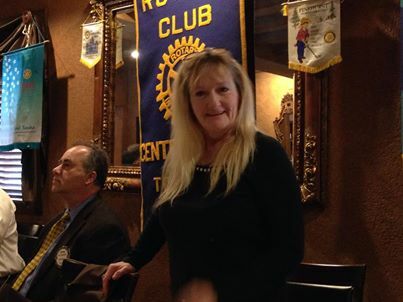 Vicki Weiss of CASA of Ocean County visited the club to update us on programs and services from the organization. She shared inspiring stories of children being helped in our area. For more information, please log onto www.casaofoceancounty.org. Authentic Science Research students are continuing their presentations to the club. At the last meeting, we heard from Toms River High School North student Alexa Ramlall on a project relating to diabetes. Also pictured is High School North teacher Pam Dixon-Kuhn. We're beginning to hear science presentations from the Toms River Regional Schools Authentic Science Research program. We heard a great project today from Heather Lavin, a senior at Toms River High School North. Pictured with her is teacher Pam Dixon-Kuhn. 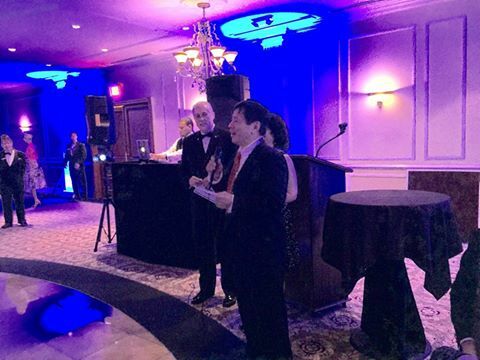 Central Ocean Rotary member Henry Hengchua presents at the District 7500 Gift of Life Spring Fling Gala in Cinnaminson, NJ. We continue to help support the life saving heart surgeries for children across the world provided by Gift of Life. Sue Sedivec from Big Brothers, Big Sisters visited the club today to present to our membership about the initiatives and programs the organization is undertaking. 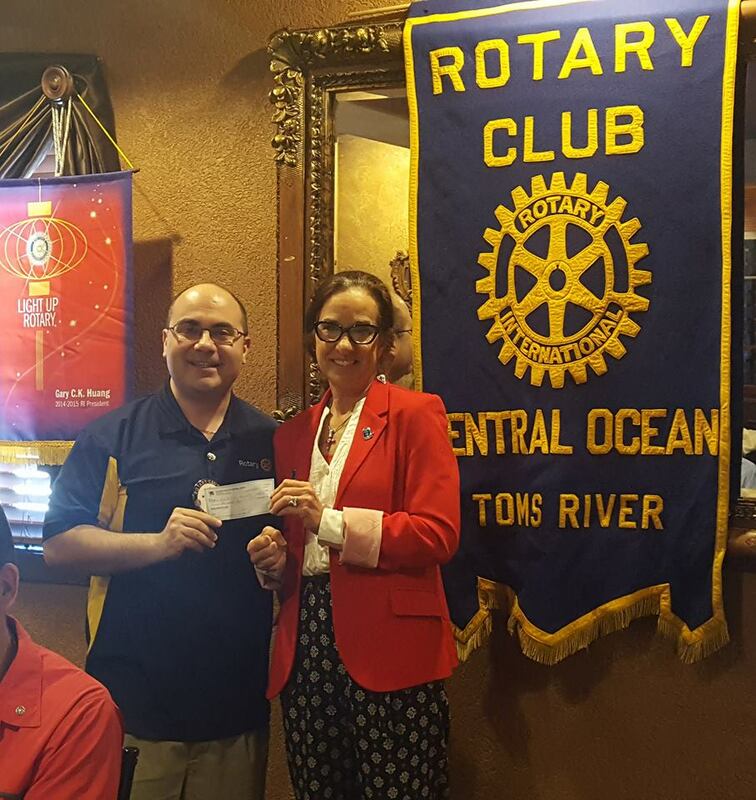 Central Ocean Rotary has been a long time supporter. 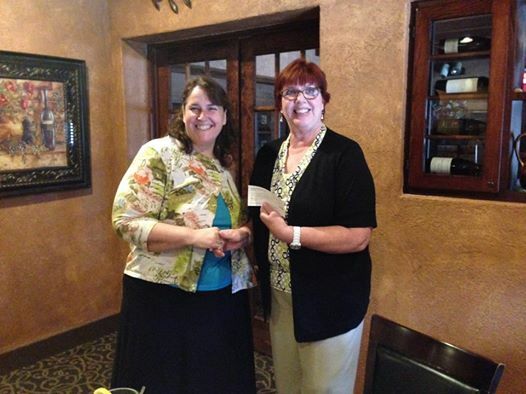 Pictured is our secretary Marion Callazzo presenting a check to Sue. 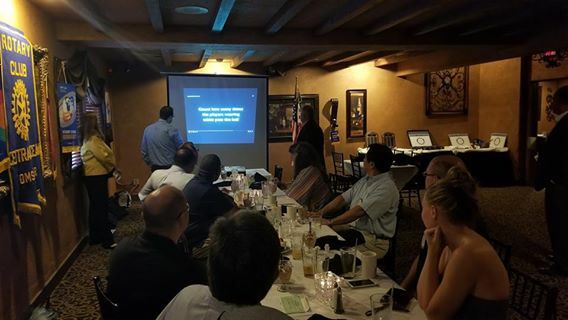 We recently held the Central Ocean Rotary Club's annual gift auction! Hundreds of gifts were raffled off for over 300 attendees. Photos of the event are located in the photo albums in the right column. 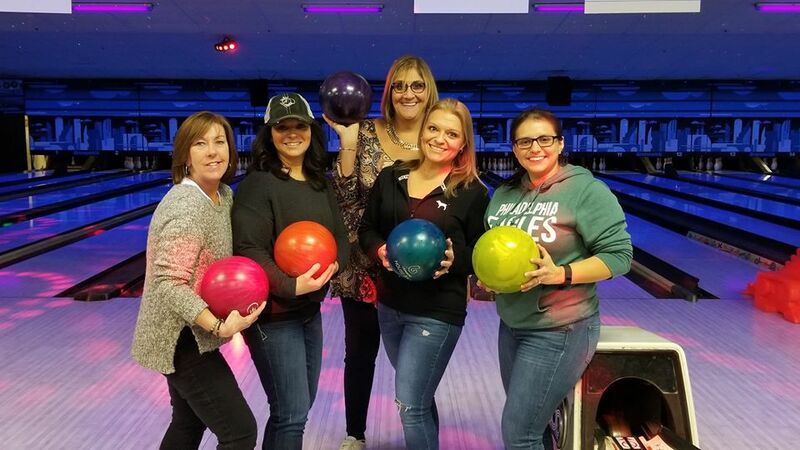 Members of our club attended the Arc of Ocean County's Bowl-a-Thon. Central Ocean Rotary was a proud sponsor of the event. Proceeds benefited the Arc which helps find employment for residents with developmental disabilities. For more information, please visit www.arcocean.org. 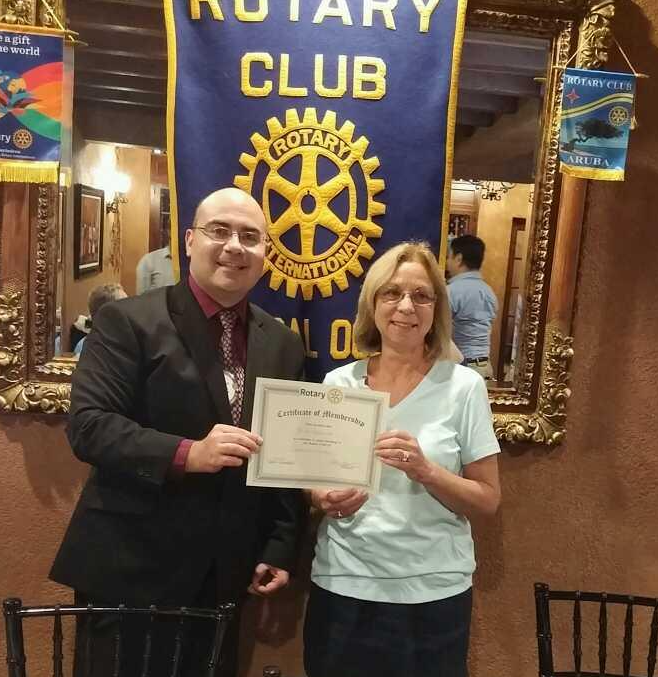 Lisa Gazzara from Providence House visited the club and updated our membership on the organization. Providence House is a part of Catholic Charities Diocese of Trenton and provides domestic violence services to help end the cycle of abuse. Central Ocean Rotary has supported them for many years and continues to do so. For more information, please log on to www.catholiccharitiestrenton.org. 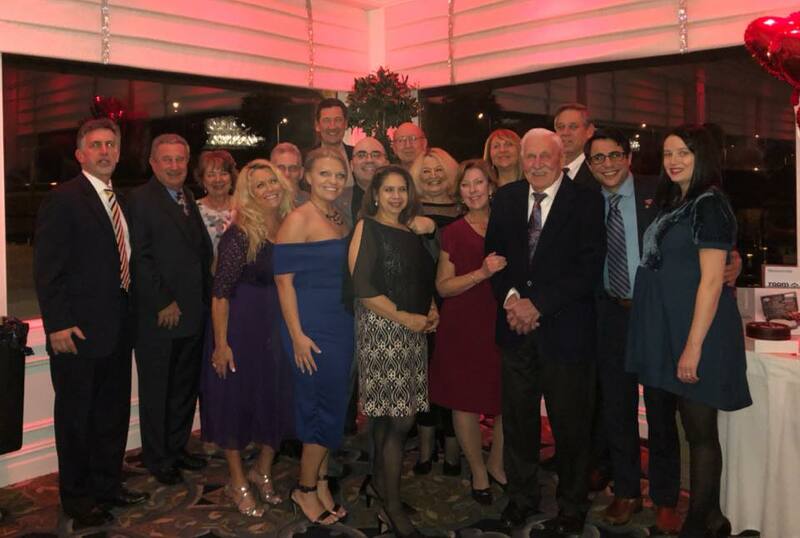 We held our annual holiday party last night at La Fontana. A great time was had by members and their families. More photos of the event can be found in the photo albums. Breanne Gesicki from the St. Francis Counseling Service came today to speak to us about their program. 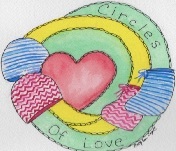 They provide therapy plus services for sexual abuse and assault victims. For more information, please visit www.stfranciscenterlbi.org. Special thanks to Elizabeth for bringing her to our meeting. 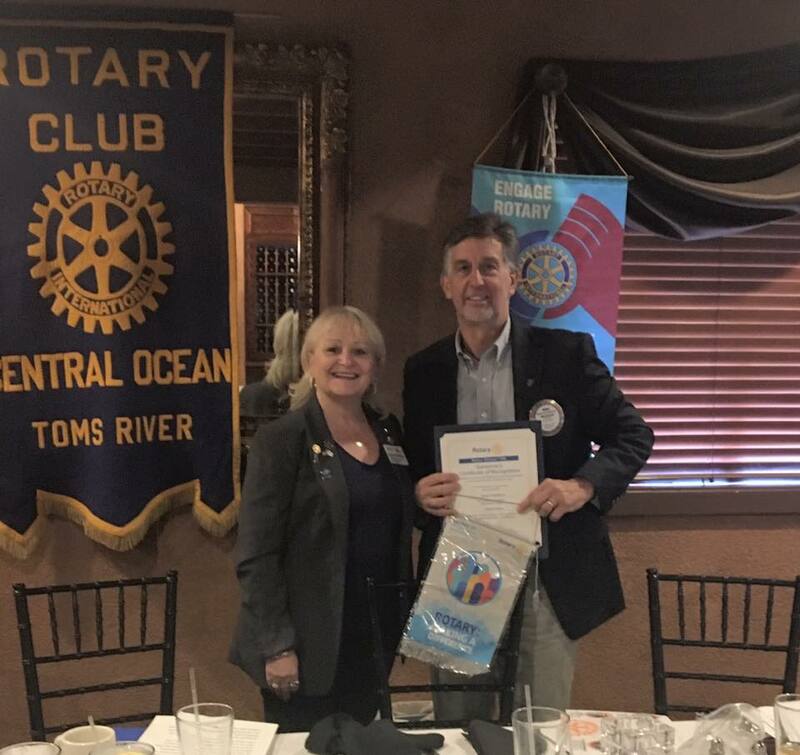 Lee Xenakis and Guy Forcone from the Ocean and Atlantic County divisions of the Department of Children and Families came to speak to the club today about foster parenting. 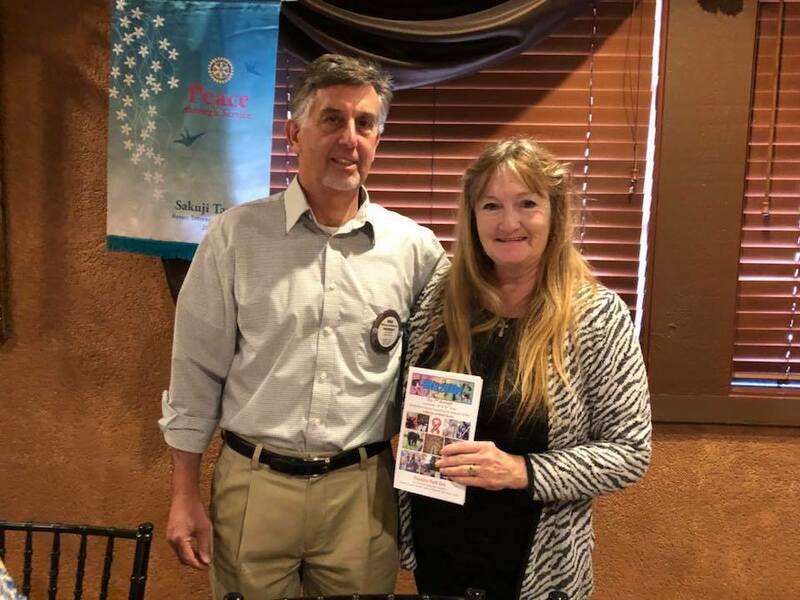 They spoke to us to gain community awareness of the process a foster child goes through and how to contact them if families are interested in a foster child. For more information, please log onto www.njfoster.org. We had a informative joint presentation from representatives of three organizations working together to help end hunger in Ocean County. Dorothea Bon Jovi from the Jon Bon Jovi Soul Foundation, Patricia Donahue from People's Pantry and Linda Keenan from the FoodBank of Monmouth and Ocean Counties are working together to create the B.E.A.T. Center, which will be a large facility located in Toms River where poor and working families can access food, education and other resources. 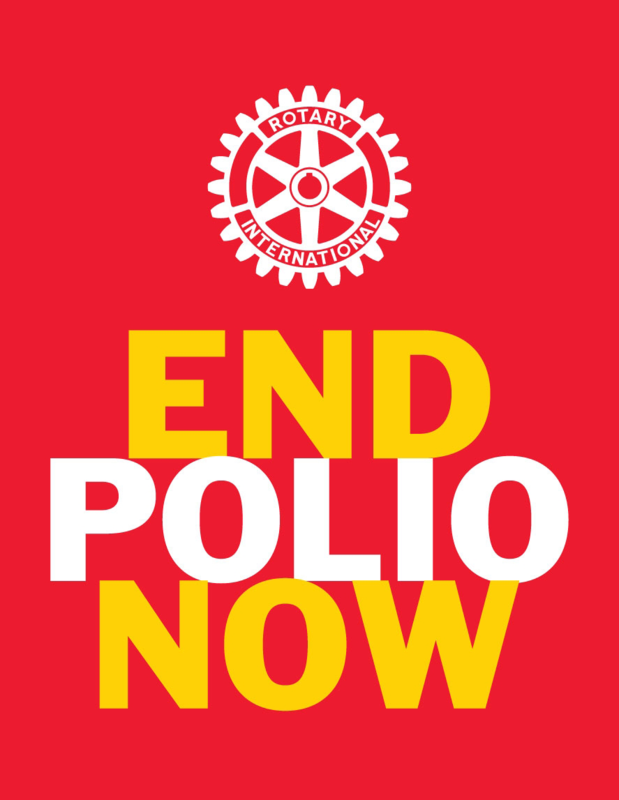 The Central Ocean Rotary Club is proud to pledge its support for such a great initiative. We pulled the winners for our 30th Annual Fall Full of Cash 50/50 Raffle. Thank you for all that participated in this year's raffle. Our club could not be more thankful for your continued support and generosity. 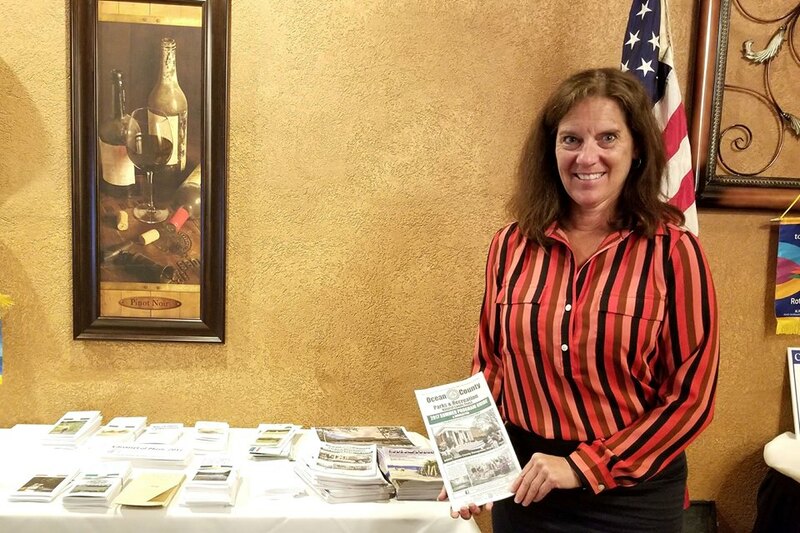 Patricia Nolan from the Arc of Ocean County visited our club to introduce us to their organization. She presented to our group on the many ways the Arc is helping people with developmental disabilities find employment. For more information, log on to http://www.arcocean.org. In lieu of our regularly scheduled meeting this week, we were invited to tour Ocean's Harbor House, which is a safe haven for homeless children in Ocean County. For more information, please visit their website http://www.oceansharborhouse.org. 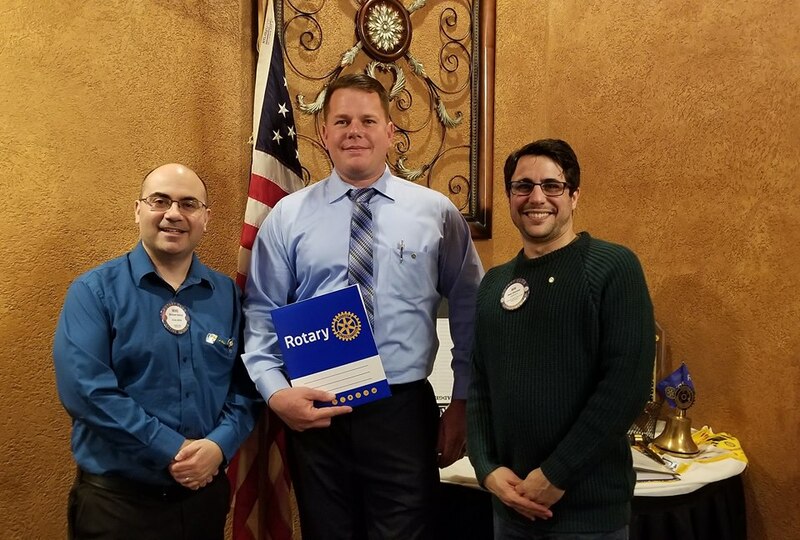 James Sigurdson from Meals on Wheels of Ocean County made a presentation to our club and educated us about hunger among seniors in Ocean County. 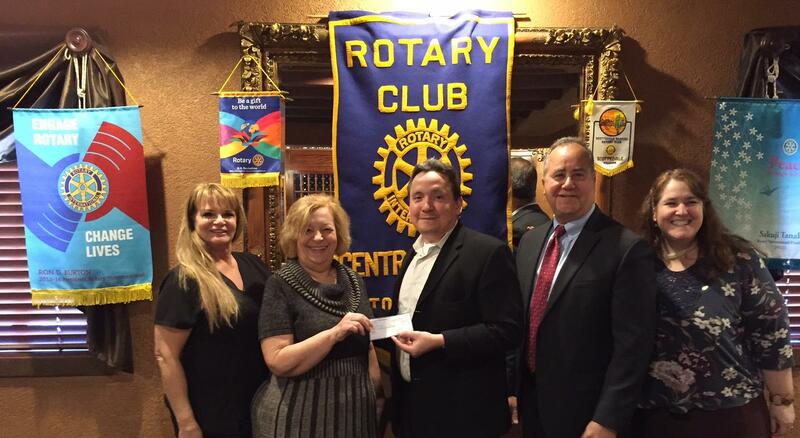 The Central Ocean Rotary Club has made a donation to support their cause. Please visit http://www.csimow.org/ for more information on this great organization. 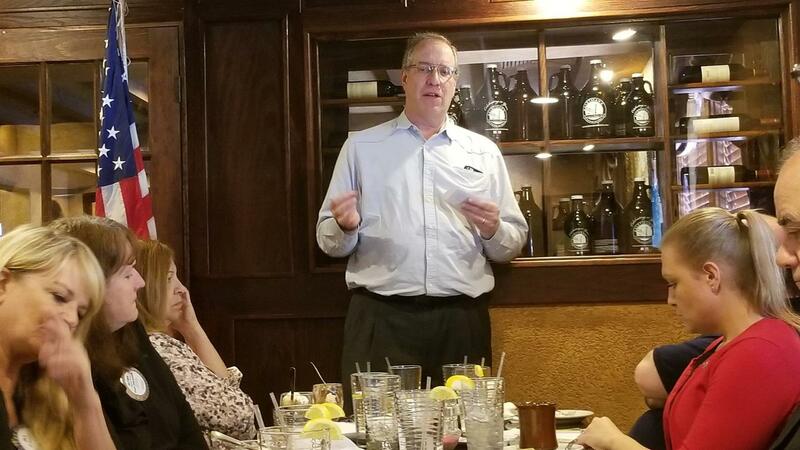 Dave Greiner from the Oyster Creek nuclear power plant was our guest speaker. 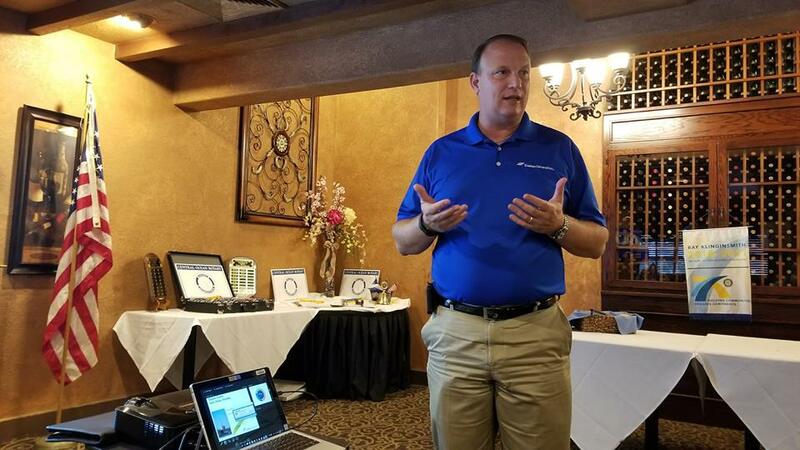 Dave held an informative session on how nuclear power works, the future of the plant and a discussion of the effects on our area once the plant closes in 2019. 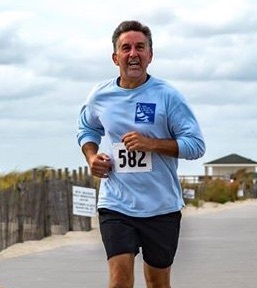 The Central Ocean Rotary Club of Toms River participated in the Ocean Mental Health Race4Respect. Several members ran in the race to benefit Ocean Mental Health, an organization we proudly sponsor. 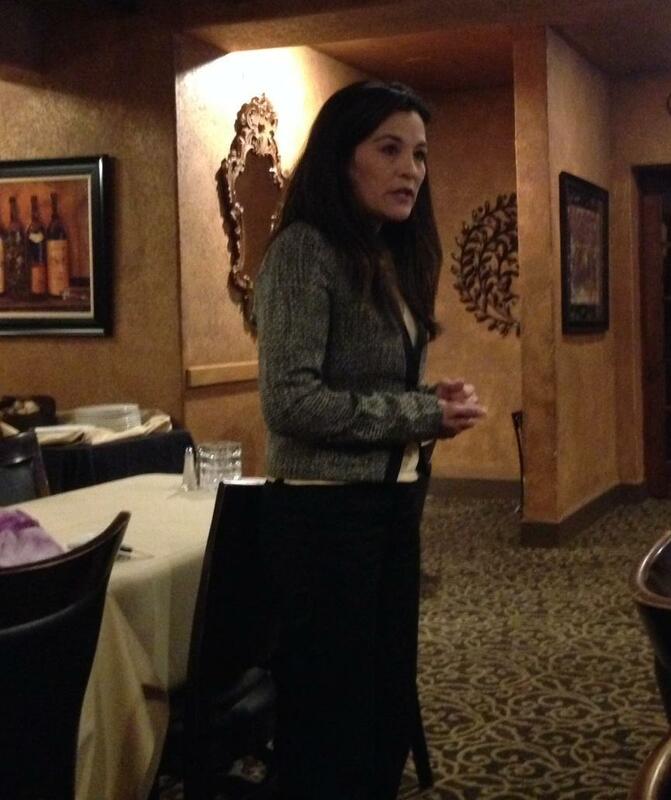 At this week's meeting, we were visited by Noelle Lotano – Executive Director of the Toms River Chamber of Commerce. She spoke to our group about happenings in the community. 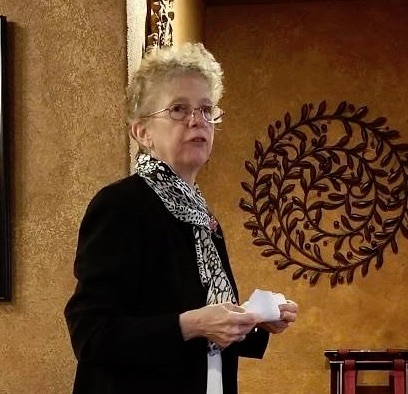 Several members of the Central Ocean Rotary Club attended the Ocean County's Women's Commission breakfast honoring Kathy Durante of the OceanFirst foundation. 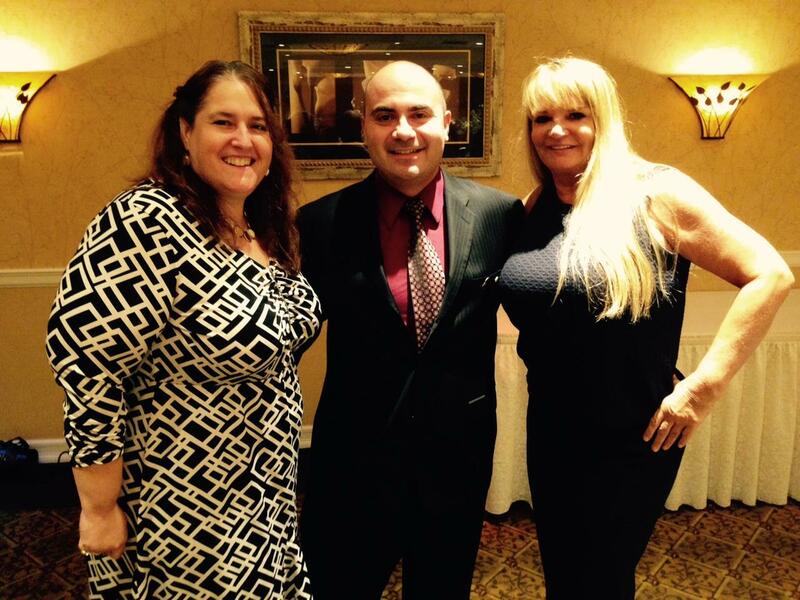 Pictured is Glynis Wray, Michael Bucca and Jill Houston. 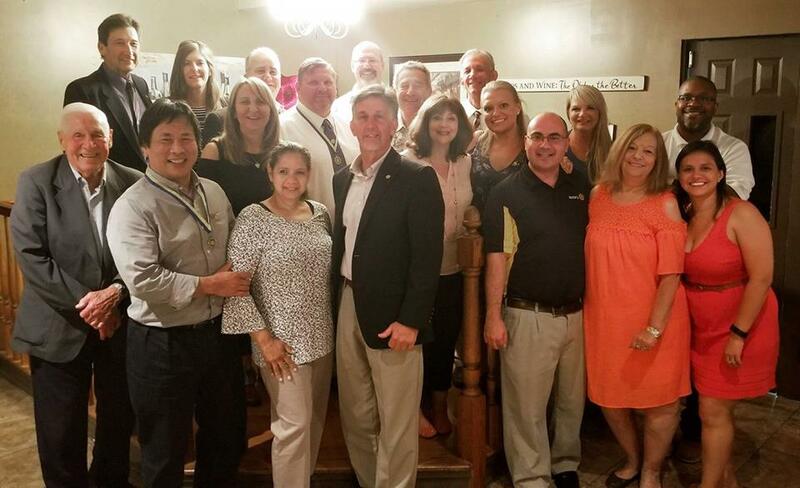 We were visited by Toms River Regional Schools Assistant Superintendent of Operations Marc Natanagara and Supervisor of Educational Technology Tiffany Lucey. 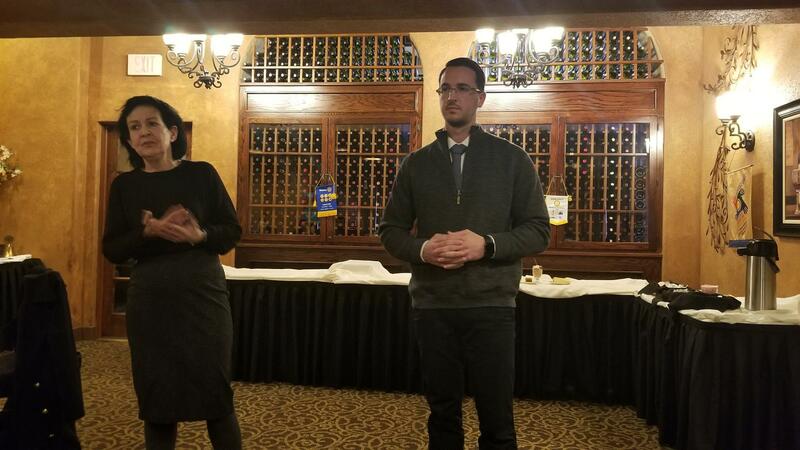 Marc and Tiffany updated our club on some of the new initiatives the district is undertaking, including Jersey Shore MakerFest, a large expo for kids and members of the community to meet people who create and innovate. The event will be held at the Pine Belt Arena on October 7th. Several Rotarians will be helping demonstrate their skills as "Makers" at the event. Club member Henry Hengchua and son Brandon Hengchua educated our members on the art form of Judo. They both performed incredible demonstrations at our last meeting. Thanks to them both for such a neat presentation. District 7500 Governor David C. Forward visited the club to update us on the new initiatives the district is undertaking this Rotary year. 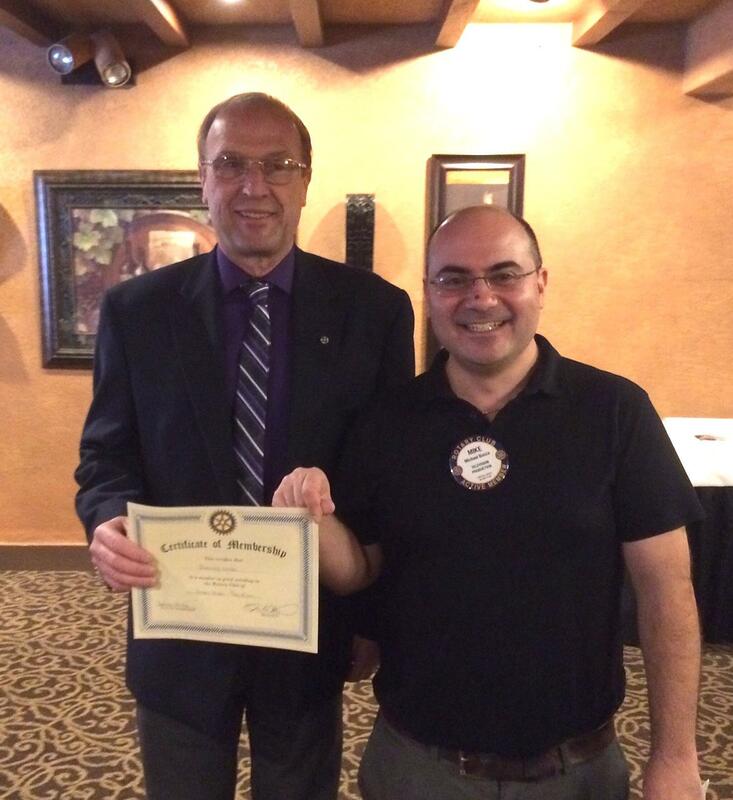 David presented the 2015-2016 Rotary banner to club president Peter Singagliese. 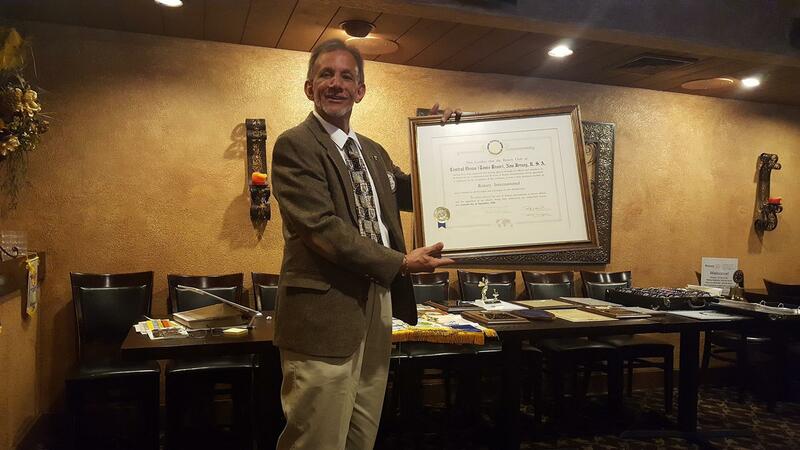 Michael Bucca was awarded a Paul Harris Award for exemplary service to the Central Ocean Rotary Club of Toms River. Michael currently serves the club as our Membership and Public Relations chairs. Pictured is President Peter Singagliese, spouse Melanie Bucca, sponsor Henry Hengchua and mother Joanne Reffie. Emily Koerner, daughter of club member Chris Koerner, spoke to the club today about her recent mission trip. Emily visited Mexico City for two weeks and provided help to an orphanage located there. She shared stories and photos from the trip with the club. 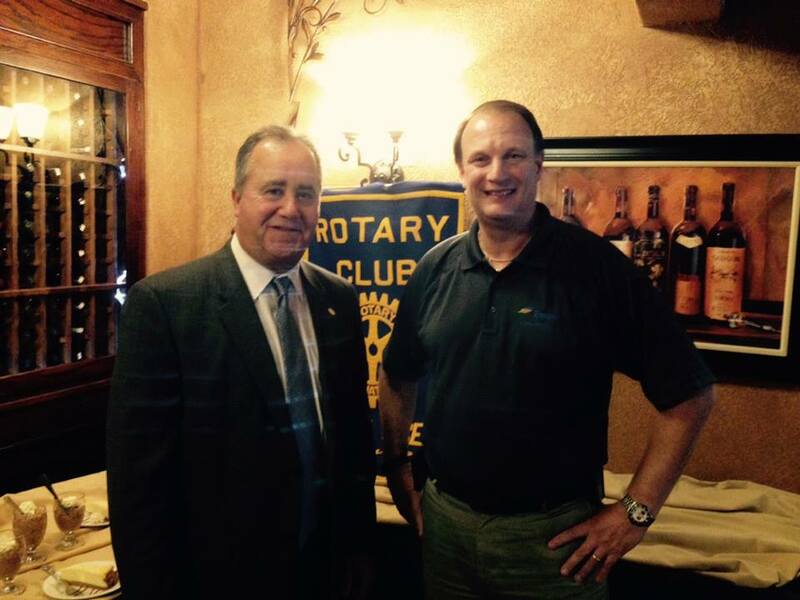 We are proud to install our new president, Peter Singagliese, for the 2015-2016 Rotary year. 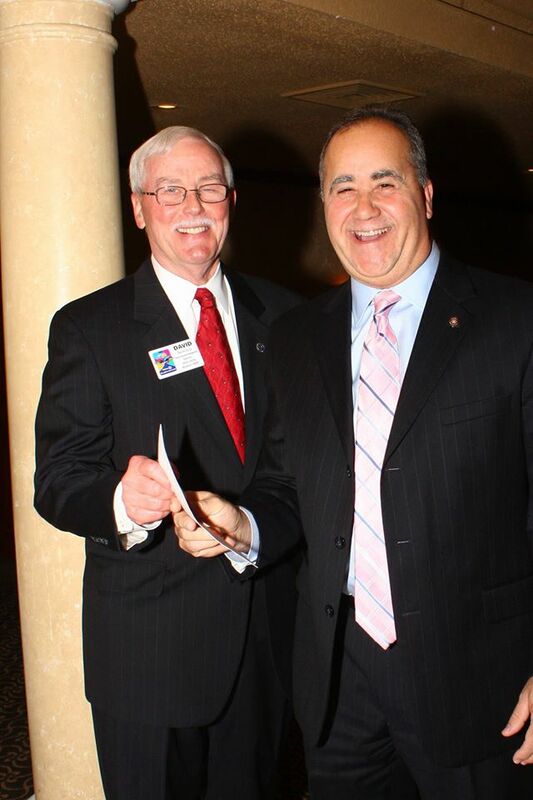 Peter is pictured being installed by charter member Jerry Boisseau at the annual installation dinner. Photos of the event are in the photo albums to the right. 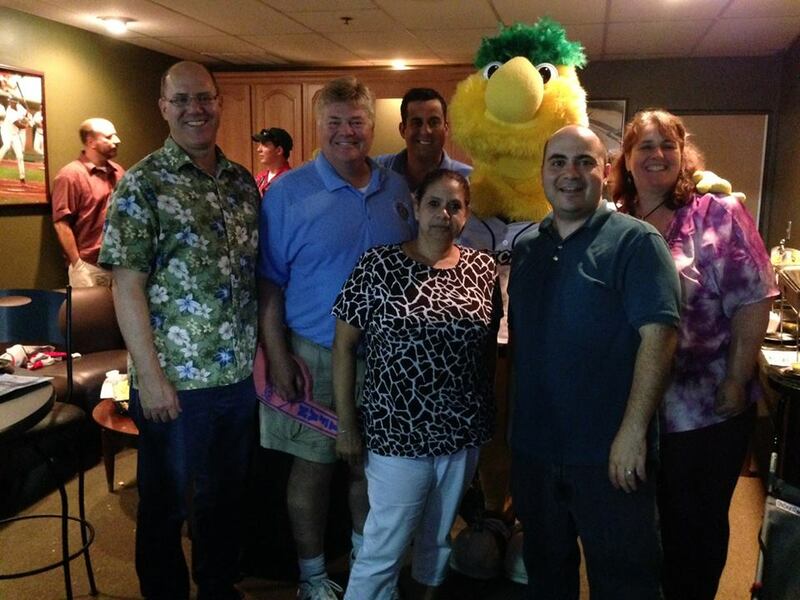 The Central Ocean Rotary Club was spotted at the Lakewood BlueClaws game on Wednesday, 6/17. Members and their families were treated to a fun night of baseball! 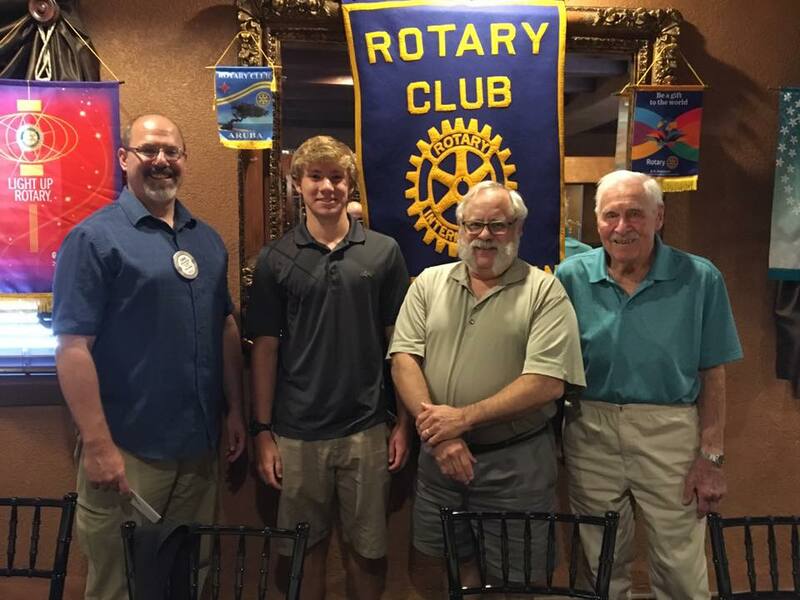 The Central Ocean Rotary Club was proud to award 5 scholarships to deserving high school seniors from Toms River. Photos of the event are available in our photo albums. 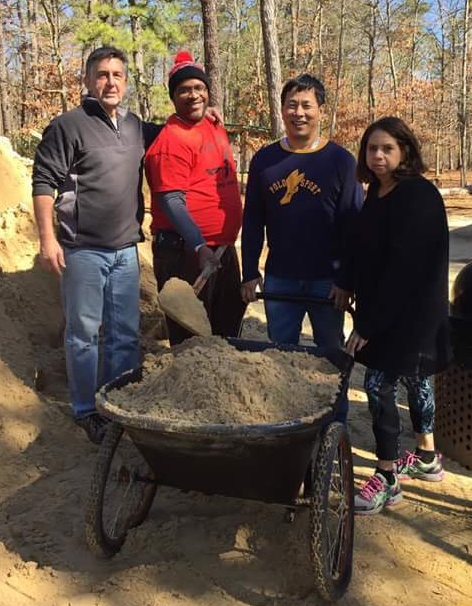 Several members of the Central Ocean Rotary Club pitched in to distribute mulch for Providence House in Whiting, NJ. Photos of the service project are available in the photo albumns. 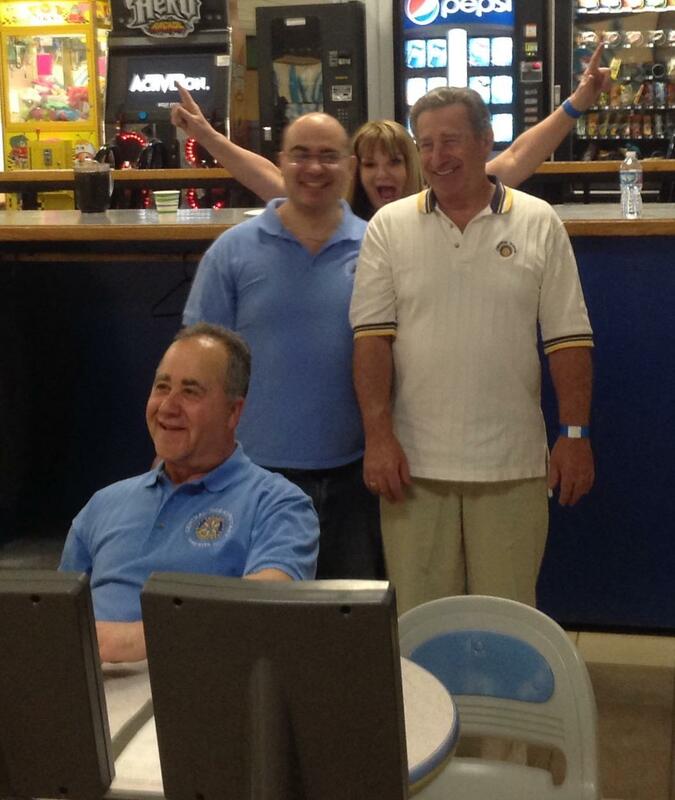 The Central Ocean Rotary Club held it's first annual Bowling Night! Members of the club, their families and friends all bowled for local charities. Photos of the event are in the photo album to the right. Bonsai! 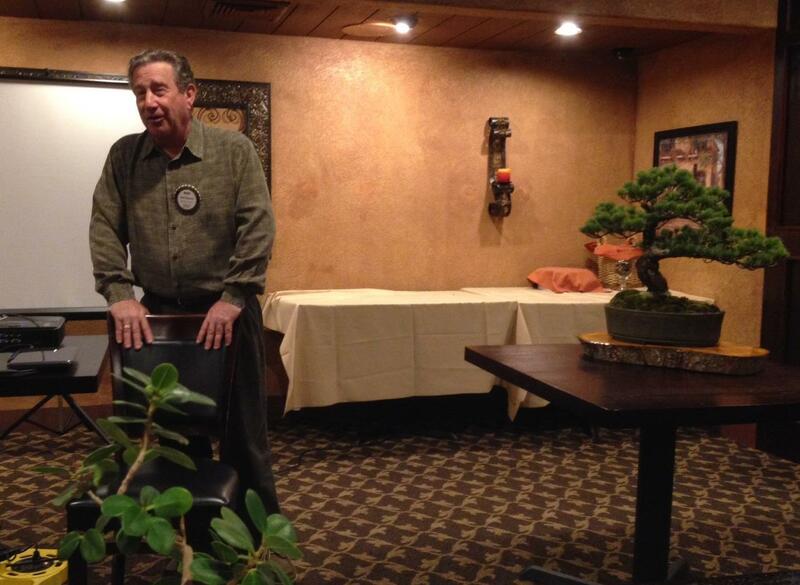 Central Ocean Rotary Club treasurer Mark Rushwald gave us a great presentation on Bonsai trees. These small trees from Japan and Asia require special care. Mark has been growing them for over 25 years. 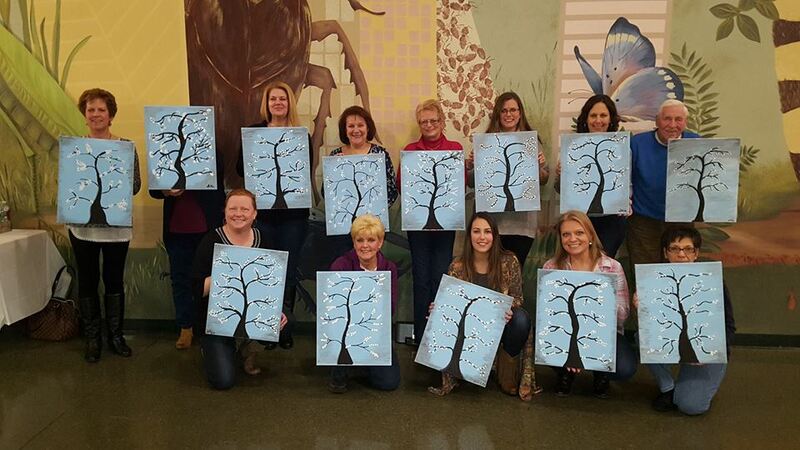 ​Several members of our club attended the Gift of Life Celebration of Life event held in Cinnaminson. The Central Ocean Rotary Club has been a proud sponsor of the life saving work done by Gift of Life for children across the world. 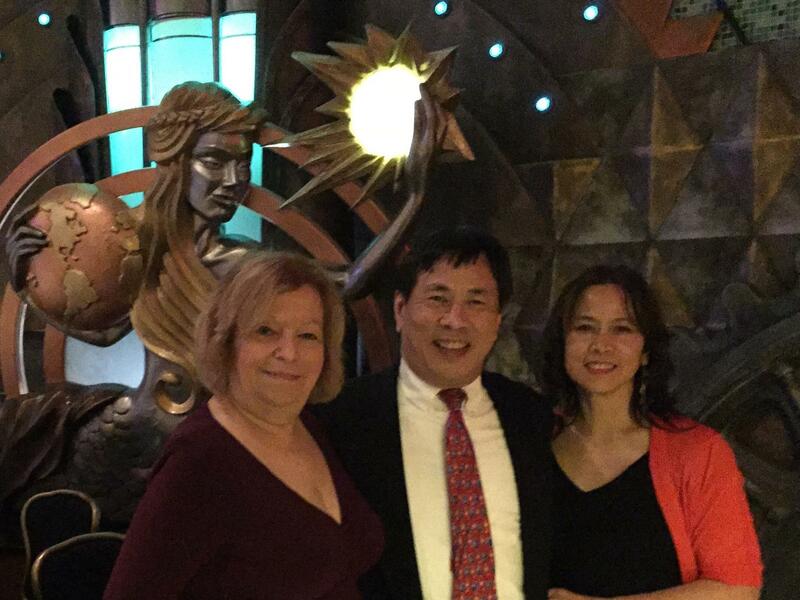 Pictured is Marion Callazzo, Henry Hengchua and Debbie Ooi. Several members of our club attended the Gift of Life Celebration of Life event held in Cinnaminson. The Central Ocean Rotary Club has been a proud sponsor of the life saving work done by Gift of Life for children across the world. Pictured is Marion Callazzo, Henry Henchua and Debbie Ooi. 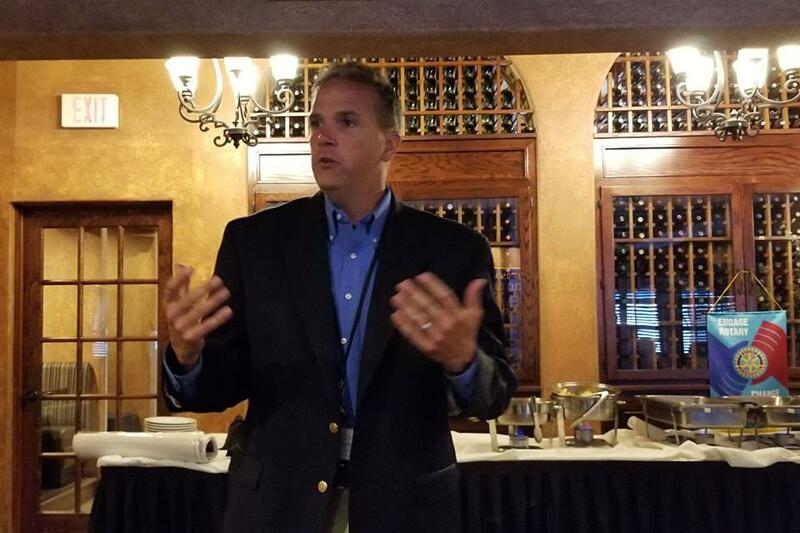 Rich Chrampanis from the Shore Sports Zone visited our club today to tell us about his endeavor to bring sports video to the web for Monmouth and Ocean Counties. The website is www.shoresportszone.com. 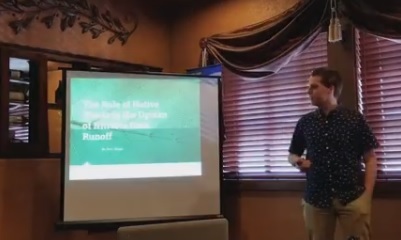 Toms River High School North student Ryan Larsen presented his Authentic Science Research project on baseball pitching arm rotation to the club today. Pictured with Ryan is Rich Larsen, Club President-elect Peter Singagliese and HS North teacher Pam Dixon. The Central Ocean Rotary Club is proud to support the Police Unity Tour. Each year many thousands of police officers ride into Washington, DC to remember and salute those officers who have died in the line of duty. We were fortunate to have officers from the Toms River and Manchester Police Departments with us today to tell us about the upcoming event. Pictured from left to right is Ofc. 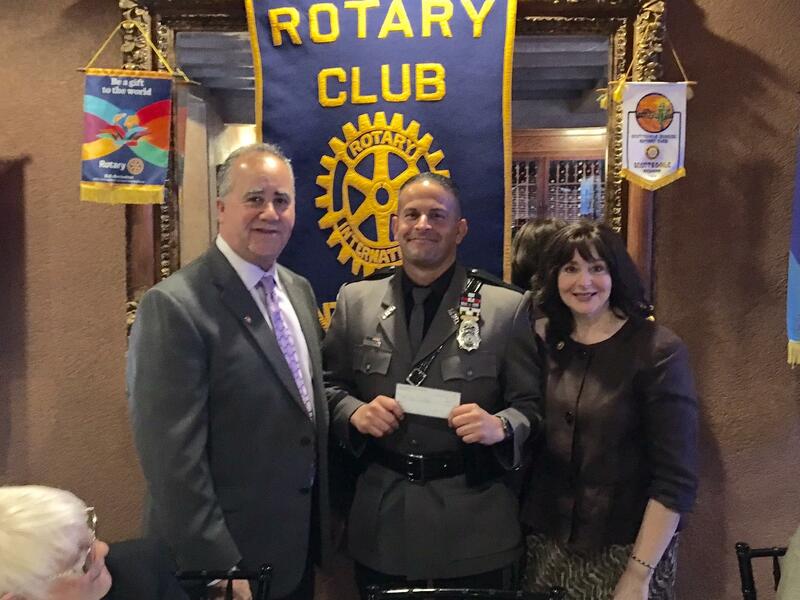 Paul Bachovchin, Rotary member Linda Cronk, Ofc. Artie Cronk, Ofc. 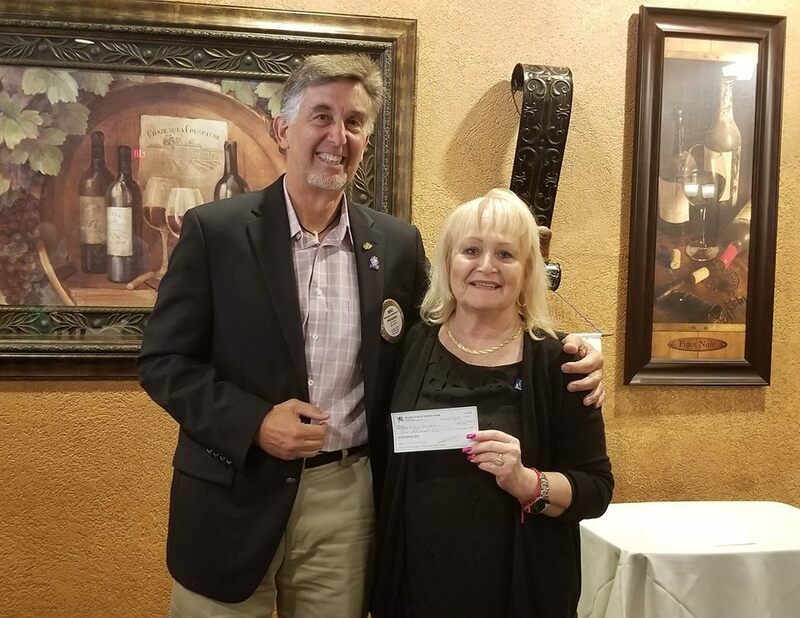 John Mehl and Rotary Club President Glynis Wray. 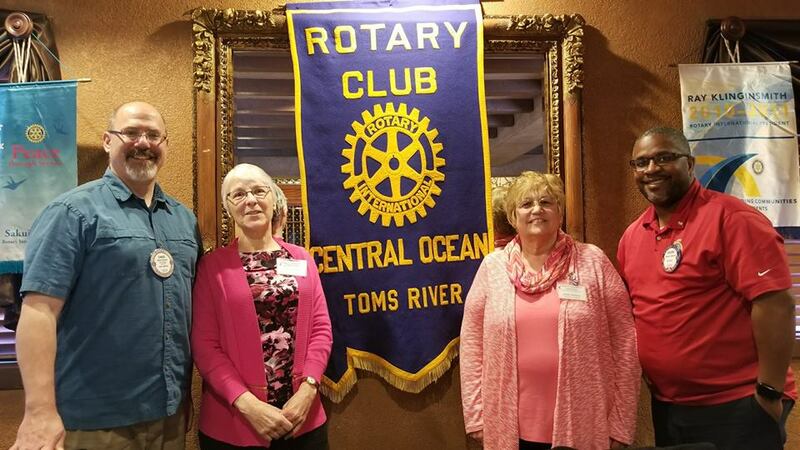 On Monday, March 2nd, the Central Ocean Rotary Club held its 4th Annual Gift Auction. Hundreds of people turned out for a chance to win lots of prizes and support so many charities in the process. Photos of the event are located on the right hand column under the album "4th Annual Gift Auction". 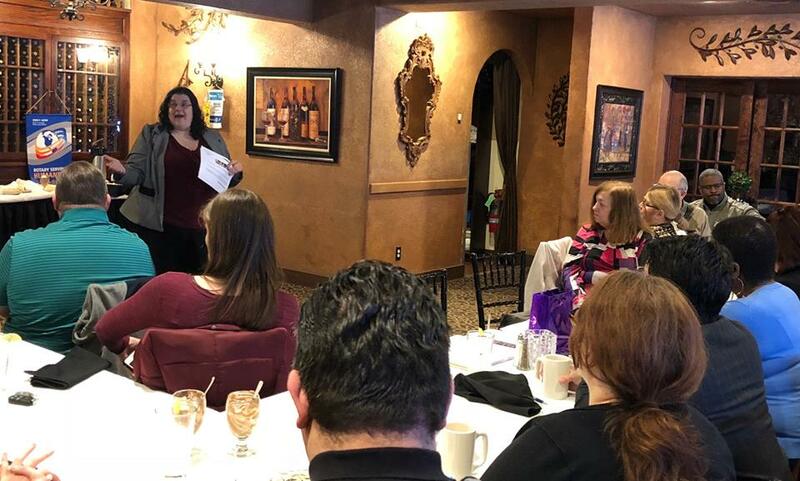 Toms River High School South student Stephanie Fallon presented her Authentic Science Research project on autism to the club today. Pictured with her are club president Glynis Wray and president-elect Peter Singagliese. 2015 Gift Auction Tickets On Sale! Tickets are on sale for 2015 Gift Auction! The event will be held on Monday, March 2nd at the Clarion Hotel, 815 Route 37 West, Toms River. Tickets are $25.00 each. For more information or to purchase a ticket, please email us at centraloceanrotary@gmail.com. Students from the Toms River Regional Schools are continuing to present their amazing science projects to our club. 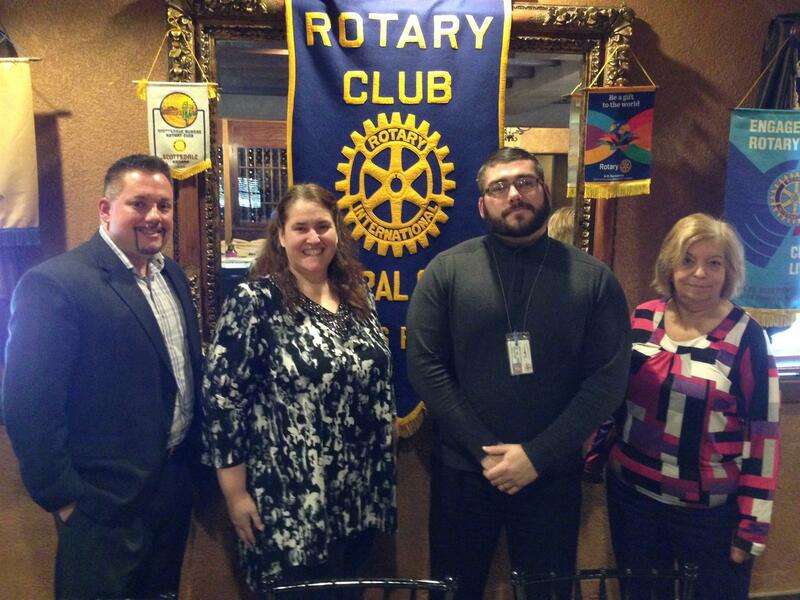 Pictured is Toms River High School South Vice Principal Brian Blake with student Brett Weiss and Club President Glynis Wray. Brett presented an amazing electronic invention that was the subject of his project. Christine Girtain from Toms River High School South brought one of her students to the club today to present to us the results of his experiment. Each year students present to our club as a trial run before their presentation at their high school and state science fairs. Note to all members: The regularly scheduled meeting on 1/27/15 is canceled due to the impending snow storm. 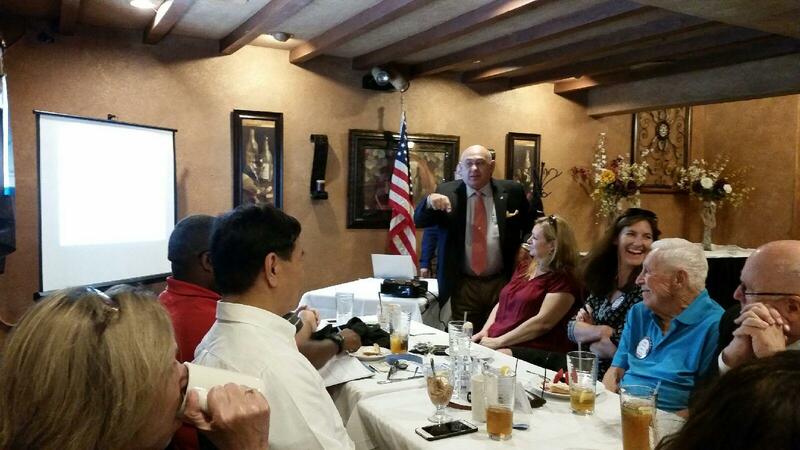 Our next meeting will be 2/3/15 at 12:15PM at Artisans. 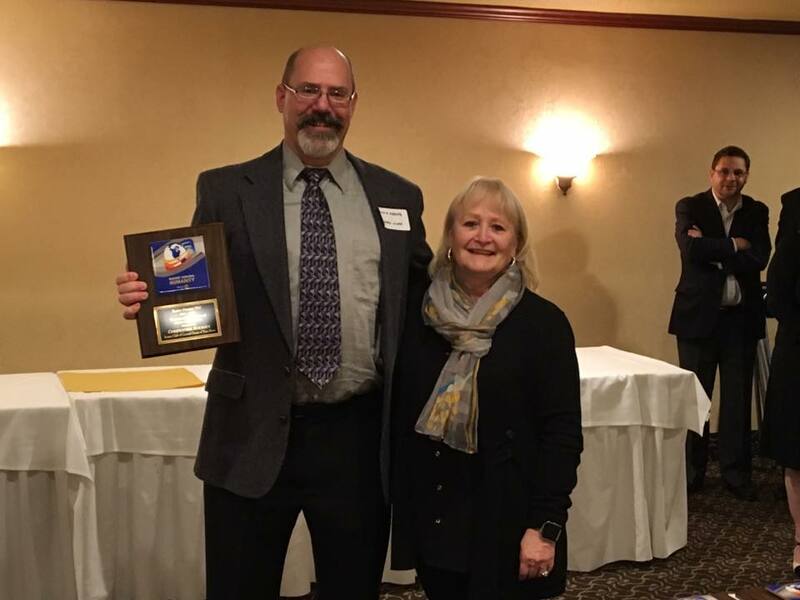 Congratulations to Peter Singagliese, who was honored with a Paul Harris Award at our annual president's installation dinner. Peter's years of service to the club has been exceptional. Pictured with Peter is President Glynis Wray, who will be serving the Central Ocean Rotary Club with a second term until July 2015. 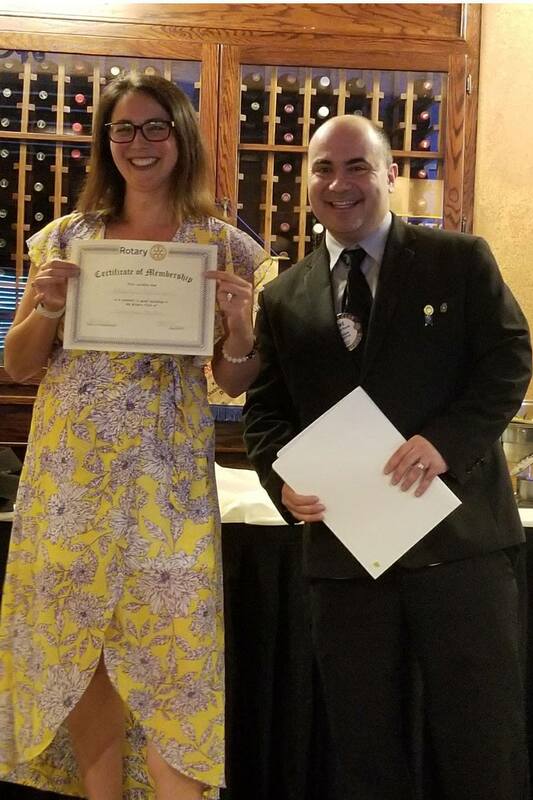 Last night, the Central Ocean Rotary Club was recognized by Providence House in observance of Domestic Violence Awareness Month. President Glynis Wray, Jill Houston, Chris Koerner and Elizabeth Rastelli accepted the award on behalf of the club. The CORC and Providence House have a long and established relationship that the club is proud to continue this year. 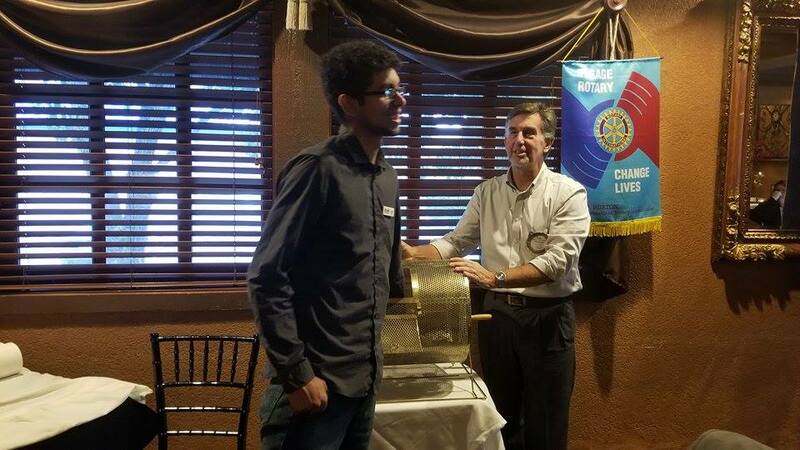 On Tuesday, the Central Ocean Rotary Club held its annual 50/50 Fall Full of Cash Raffle! 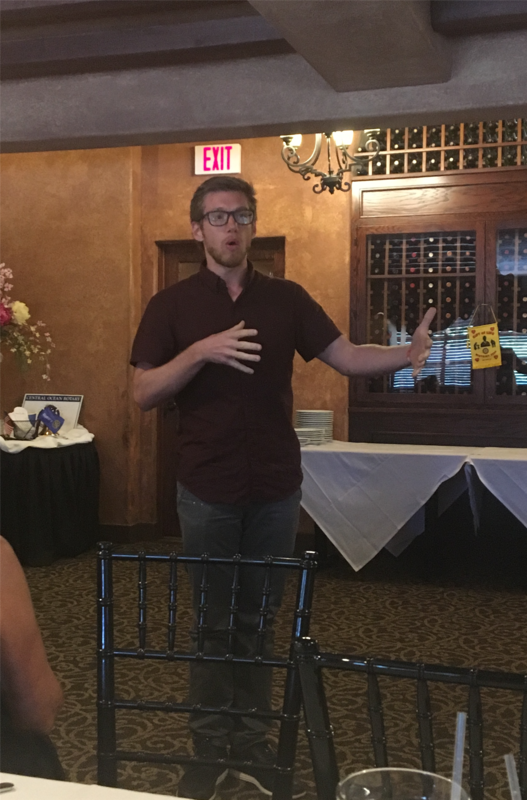 Erik Hall from Meals on Wheels spoke to the club last week about the great programs that exist and how the club can help. President Glynis Wray presented a check to show our support! 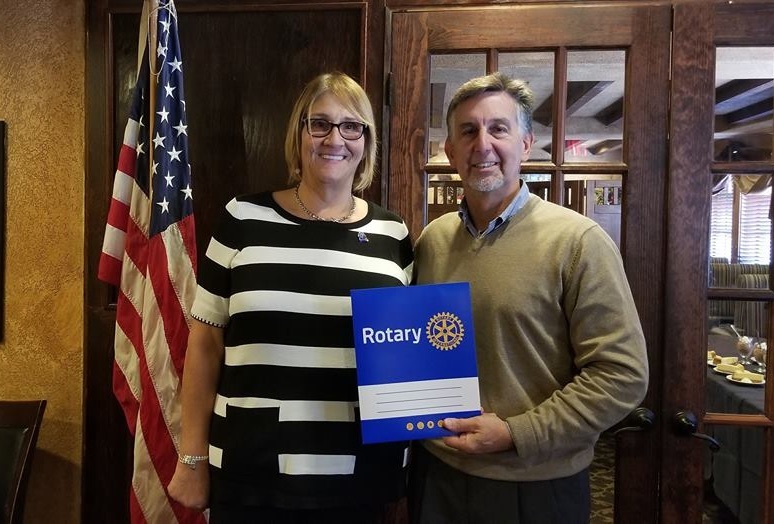 Linda Keenan from the Foodbank of Monmouth and Ocean Counties visited the club today to update us on projects and initiatives being taken on by this great organization. With the donation provided by the Club, we will be providing 3000 meals! We are proud to help fight hunger in the community. 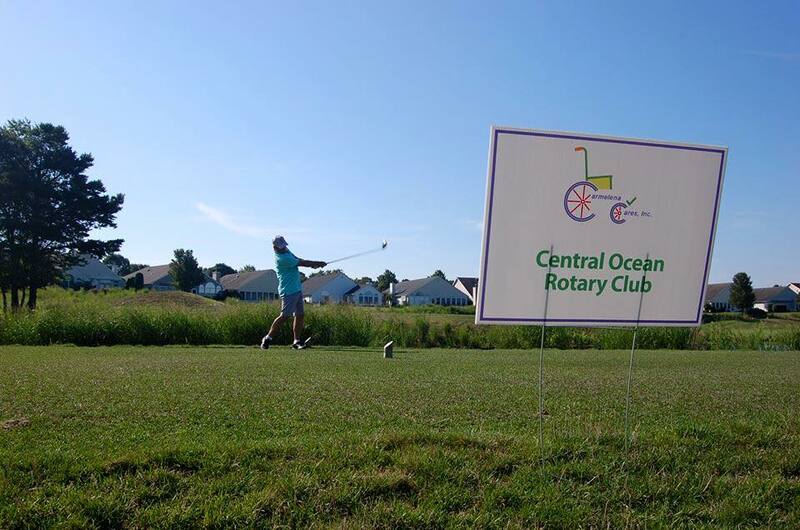 The Central Ocean Rotary Club was proud to support and attend the Carmelena Cares Golf Outing. Members of the club joined members of the community to golf for an amazing cause. Proceeds from the outing benefit the charity to help disabled children secure bikes and other assistive devices. Thank you to all who attended! 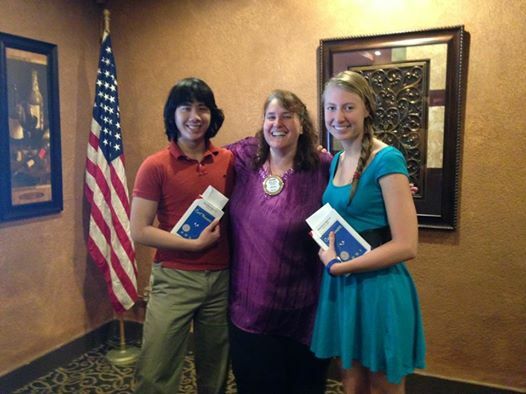 At the meeting today, the club honored two very dedicated students: Emily Koerner and Brandon Hengchua. These two fine young people have been volunteering their time to the club and it's many activities for many years. The club is grateful for their service and dedication. 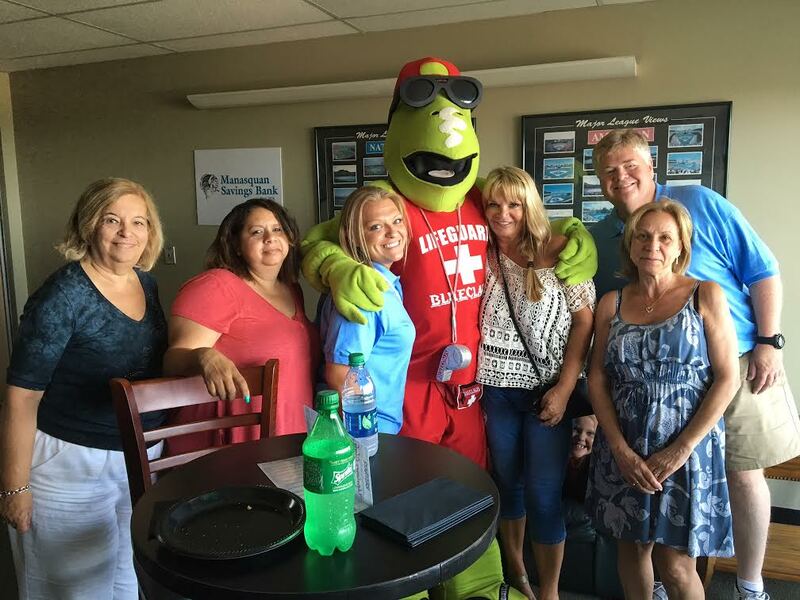 The Central Ocean Rotary Club was spotted at the Lakewood BlueClaws game last Thursday night. Members and their families were treated to a fun night of baseball and a special appearance by Buster! 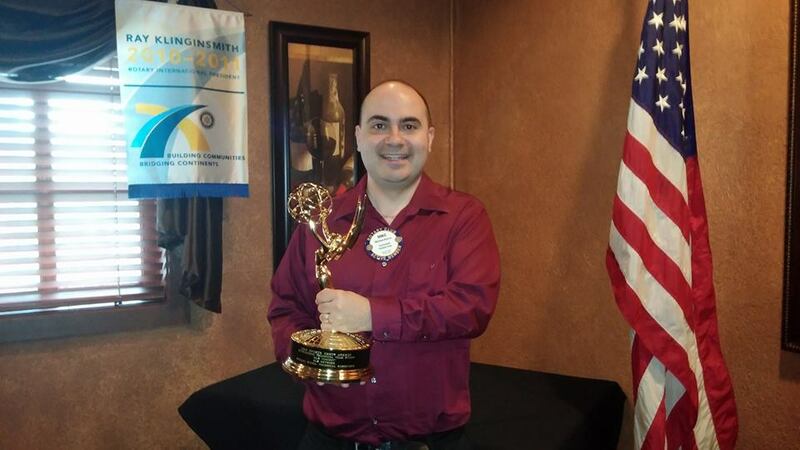 Congratulations to Central Ocean Rotary Club member Michael Bucca on winning a 2013 Sports Emmy Award. The award was for his work as a Technical Supervisor on "MLB Tonight" and was awarded in the category "Outstanding Technical Team - Studio". 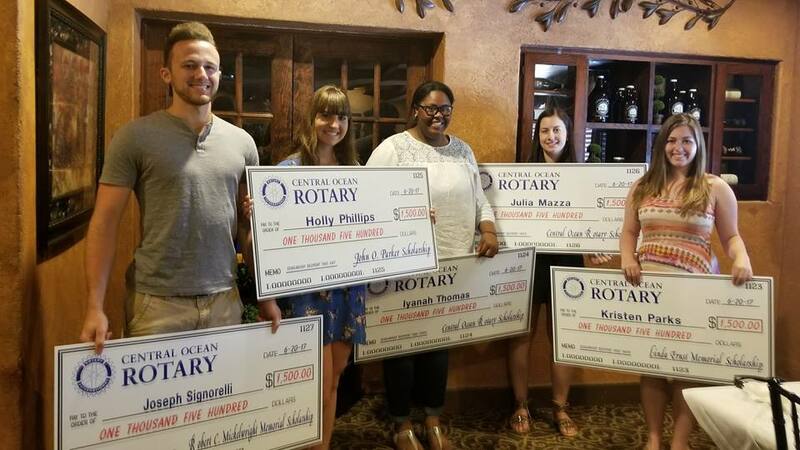 The Central Ocean Rotary Club was proud to award 5 scholarships to very deserving high school seniors that attend the Toms River Regional Schools and Monsignor Donovan High School. Pictured are 4 of the winners and the Rotary Scholarship Committee. Congratulations to these bright students and we wish them all the best on their future success! 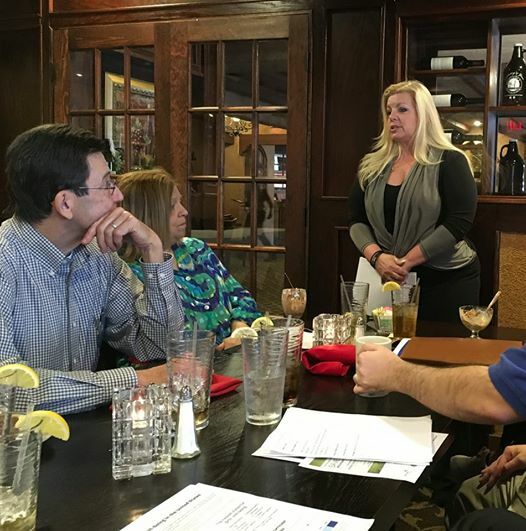 Carmelina Cares visited the club on Tuesday to update us on their golf outing and other news from the charity. 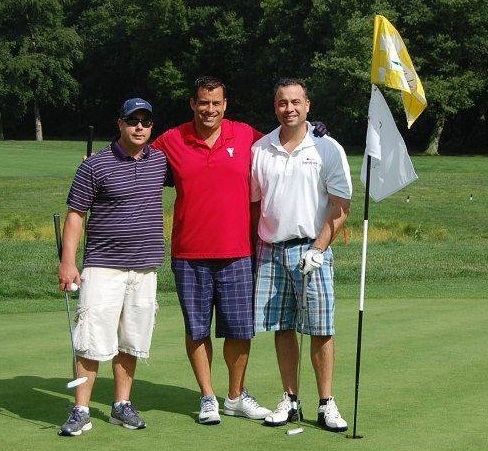 The golf outing is taking place on July 28th at the Woodlake Country Club. 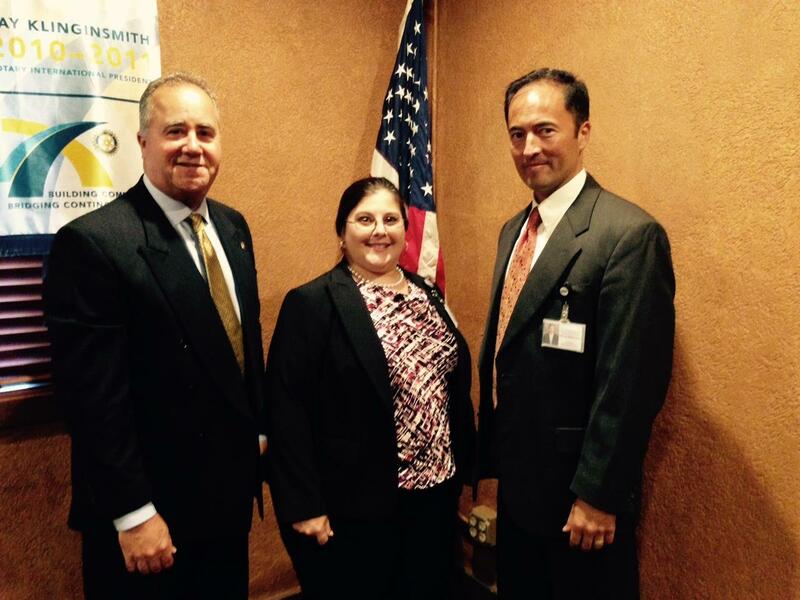 Pictured is Carmelina Cares director Vinnie Mancini with Rotary members John Vowteras and Liz Rastelli. The club is proud to support the cause! 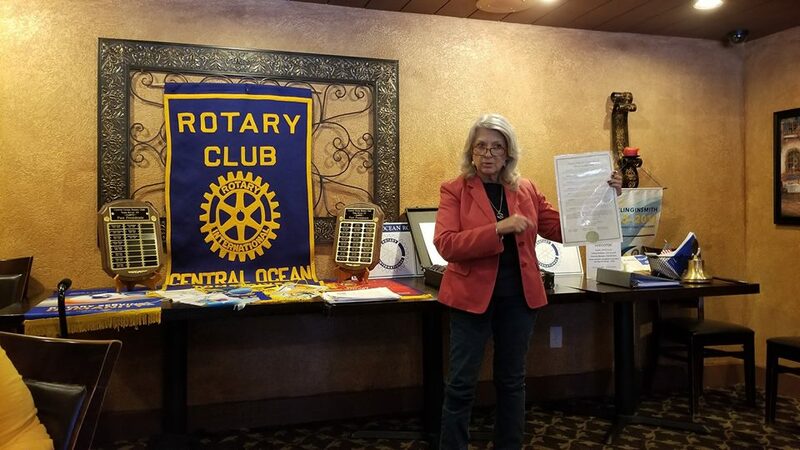 Susan Fichter of the Northern Ocean County Chapter of Habitat for Humanity visited the club on Tuesday to update on us on their initiatives in the region. 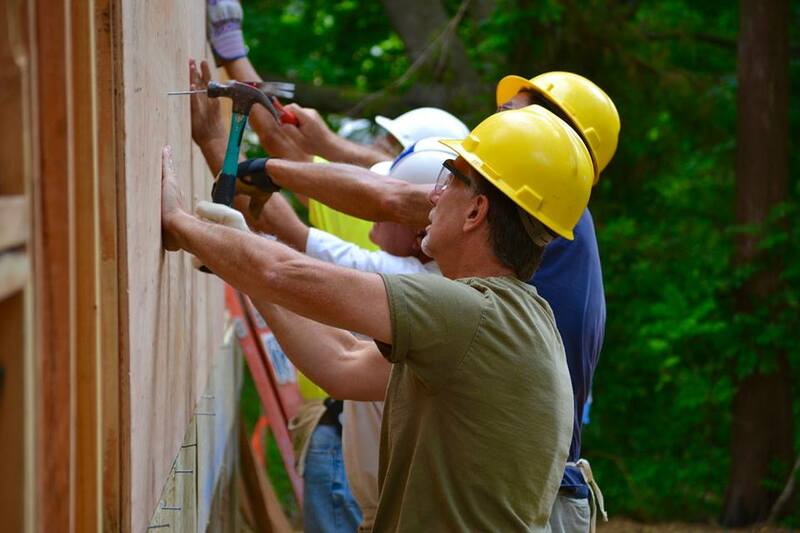 Central Ocean Rotary is proud to support Habitat for Humanity. 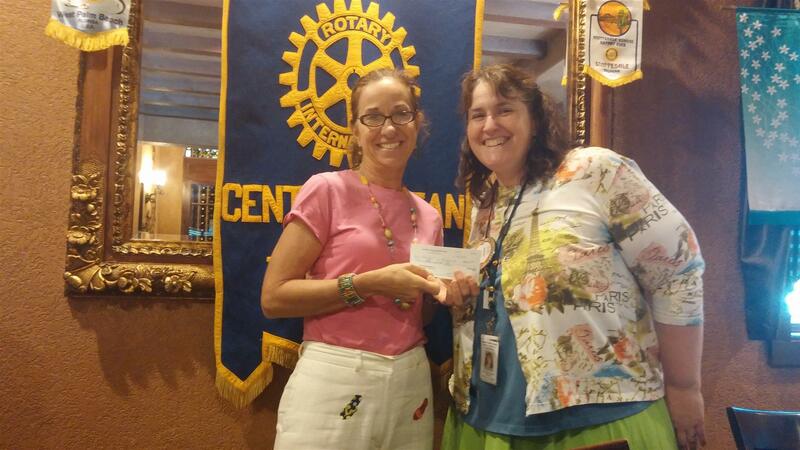 Pictured is President Glynis Wray presenting a check. 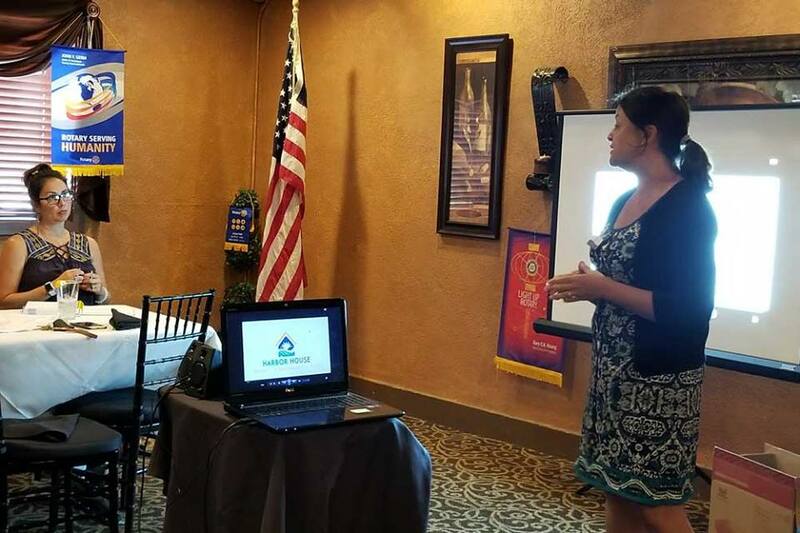 Nicole Arnone came to the club today to give a presentation about Dottie's House, a safe haven home and program for women who are victims of domestic violence. Club President Glynis Wray presents a check to Nicole in support of the cause. 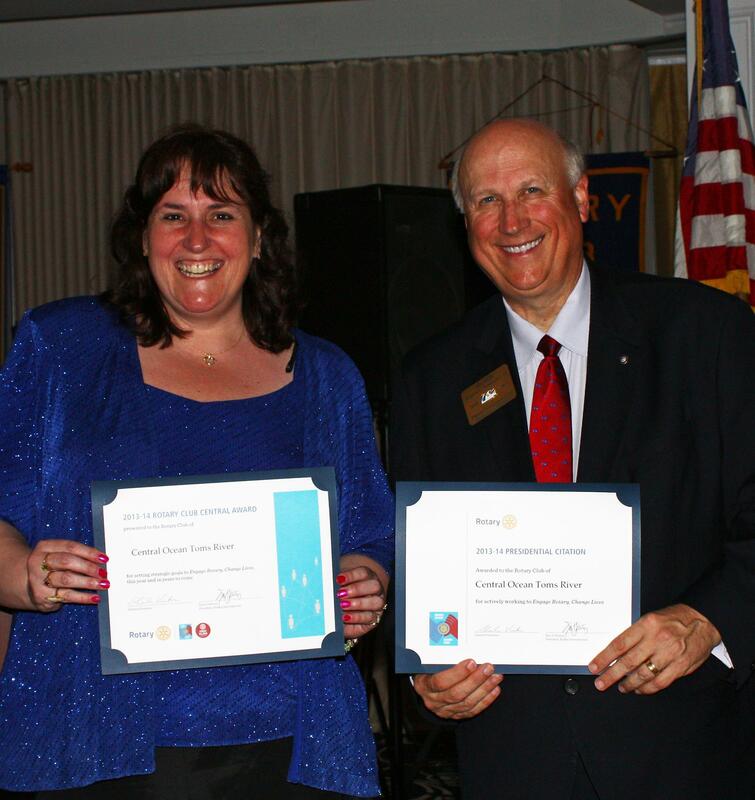 Club President Glynis Wray holds the two Rotary International Presidential Citation awards that the Central Ocean Rotary Club was awarded at the district conference. Congratulations to all of our members for a job well done. Marcia Fishkin from Providence House visited the club today to explain to us how her organization houses victims of domestic violence. She talked about the various services available to these children and families and how we can help. 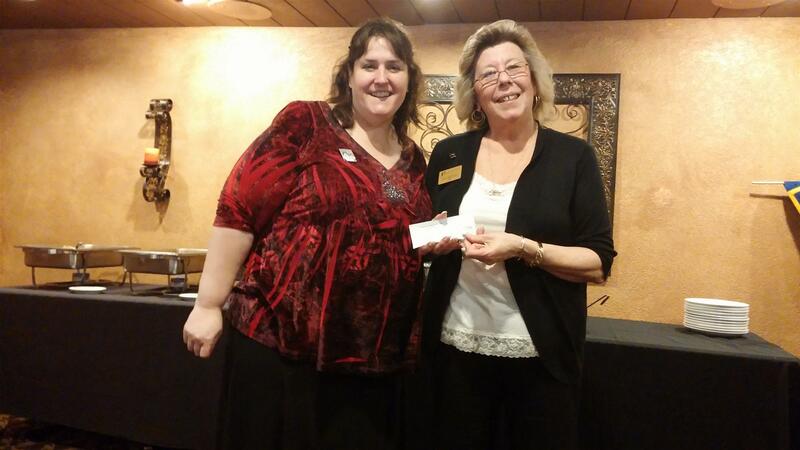 President Glynis Wray presents a check to Marcia. 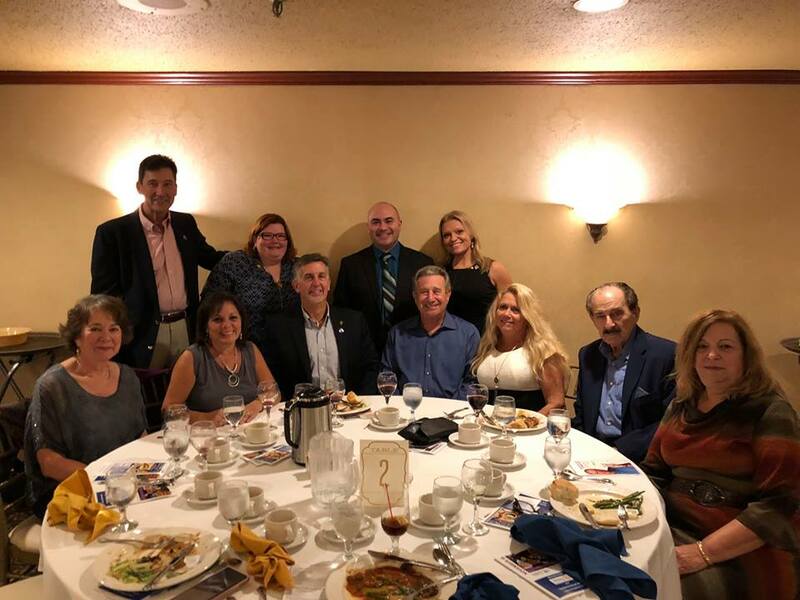 Members of the Central Ocean Rotary Club attended the District 7500 Conference held at the White Sands Hotel in Point Pleasant. Over three days, members participated in a variety of events to learn about what clubs in the area are doing to help "Strengthen Our Shore". Photos of the events are still to come! 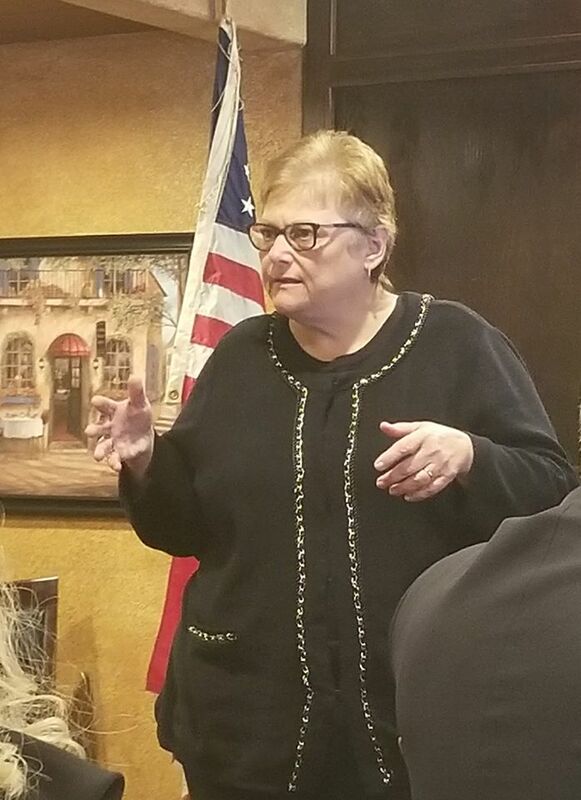 Vicki Weiss of Court Appointed Special Advocates (CASA) came to the club today to discuss how we can help foster children who are in need. Her organization supports these kids by providing volunteer advocates for them in their homes. 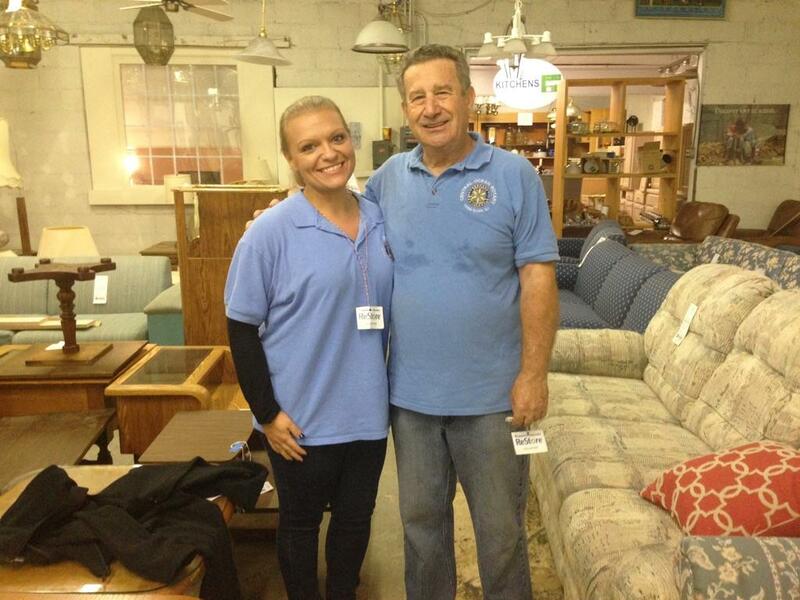 For more information on how you can volunteer, please visit www.casaofoceancounty.org. 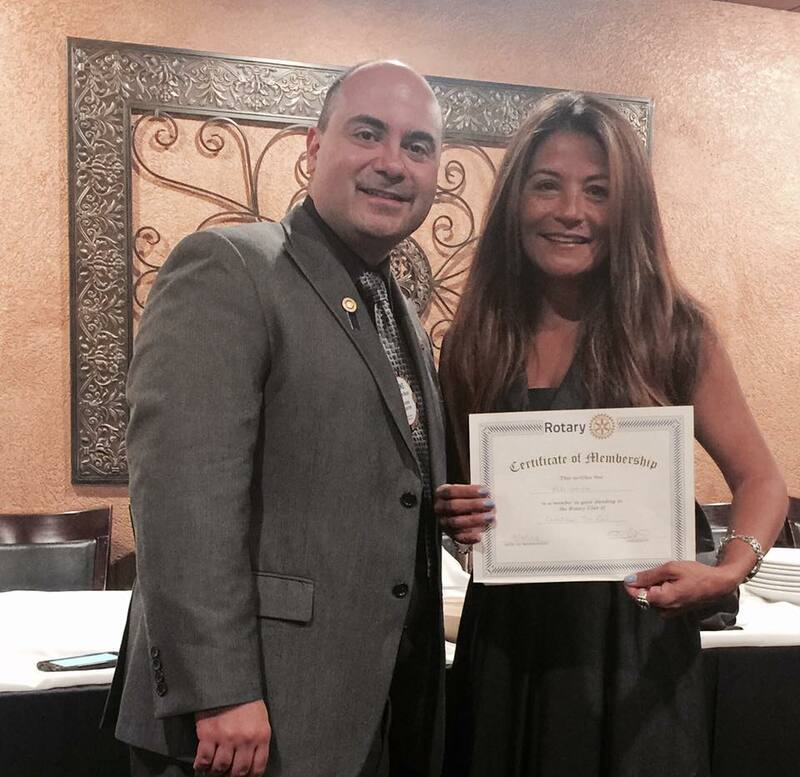 Welcome to a New Rotarian! 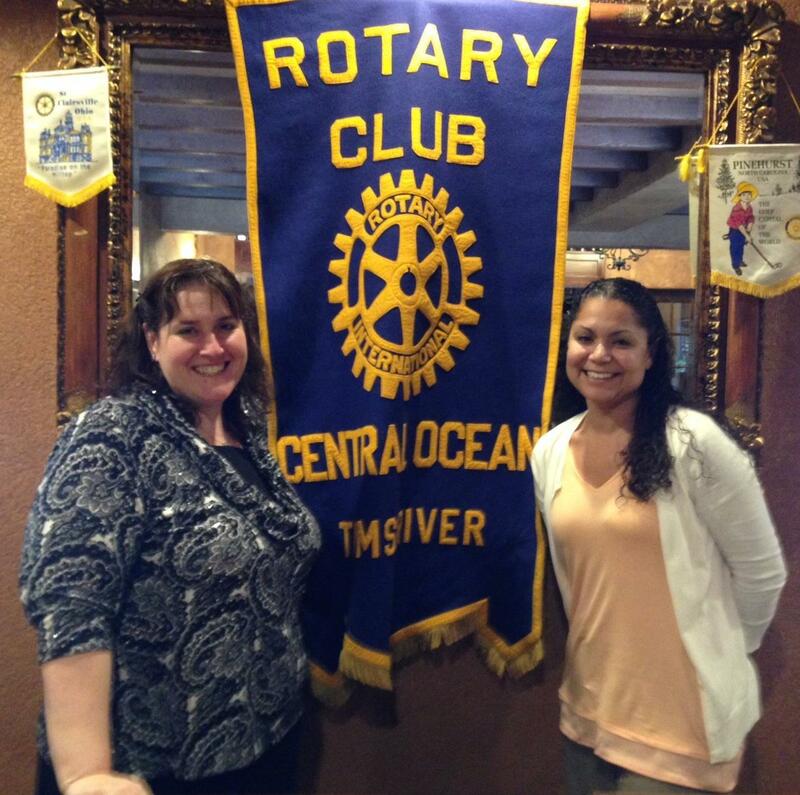 The Central Ocean Rotary Club has a new member! 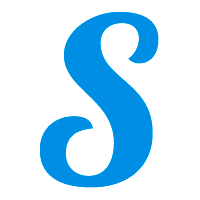 Tim McNichols from LevinCyphers has joined us. We are thrilled to have him. Welcome aboard, Tim! 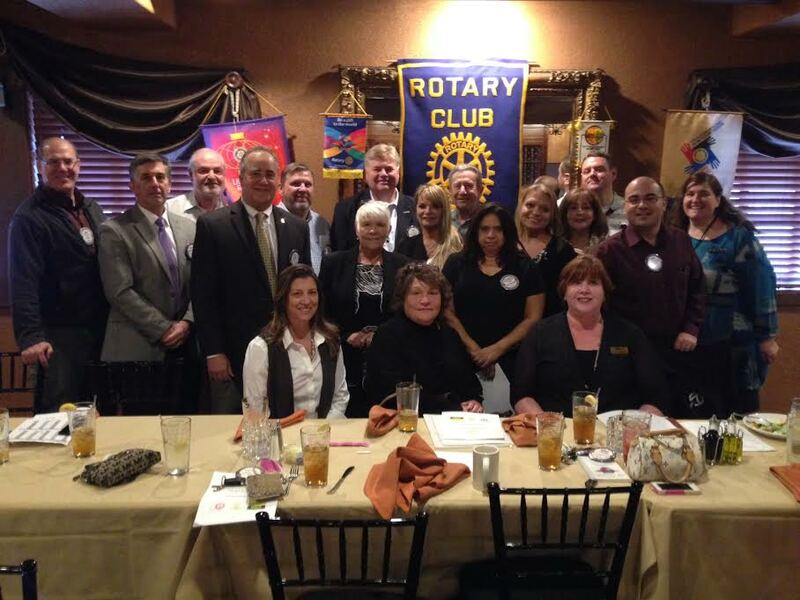 Our club continues to grow as more professionals want to help others in our community. 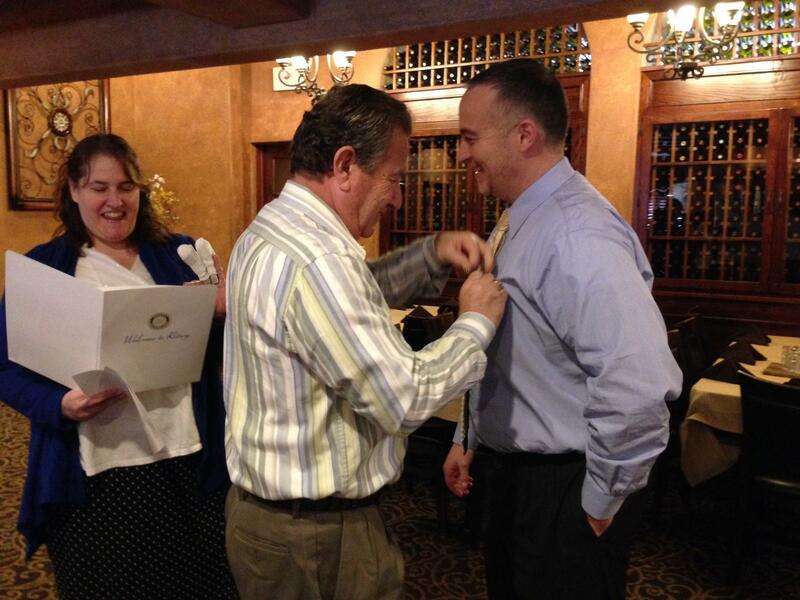 Pictured is Mark Rushwald pinning Tim as President Glynis Wray performs the induction ceremony. Science students preparing for competition are presenting their projects to the Central Ocean Rotary Club. This week, we were treated to a fascinating project from a High School North student on the effects of certain chemicals and their potential for cancer research. 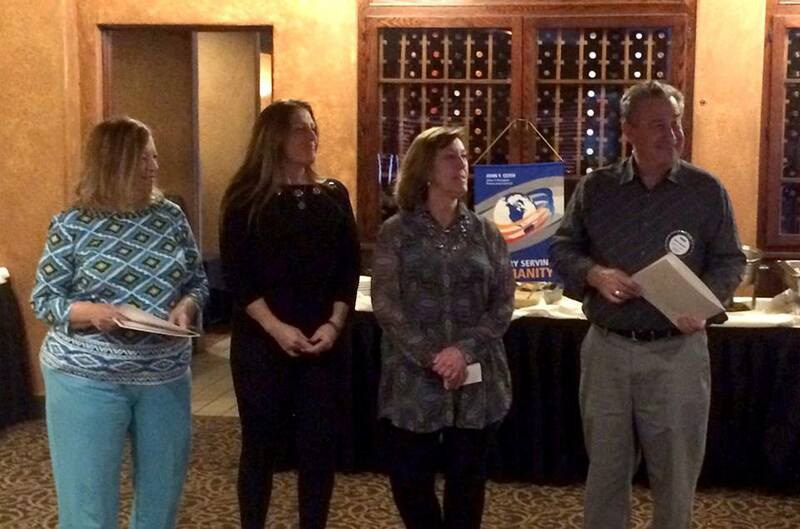 Last night, the Central Ocean Rotary Club held our 3rd Annual Gift Auction! Hundreds of people turned out to bid on gifts of all shapes and sizes. Thank you very much to all of the sponsors, friends, guests and Rotarians who helped make the event a huge success. Photos of the event are in the photo album located on the right side of the page. Due to the upcoming snowstorm, the 3rd Annual Gift Auction has been postponed until Thursday, March 13th. Location and time remain the same. Rotary member John Anderson is hosting Bowling for Nadine, a fundraiser for a single mother who is battling a rare form of ovarian cancer. The goal of the event is to raise $5,000. The event will take place on Friday, March 7th from 5-10PM at Bradley Beach Bowl & Recreation Center. For any questions or information on donations please contact John Anderson at 732-245-2520 or JJAAnderson2011@gmail.com. 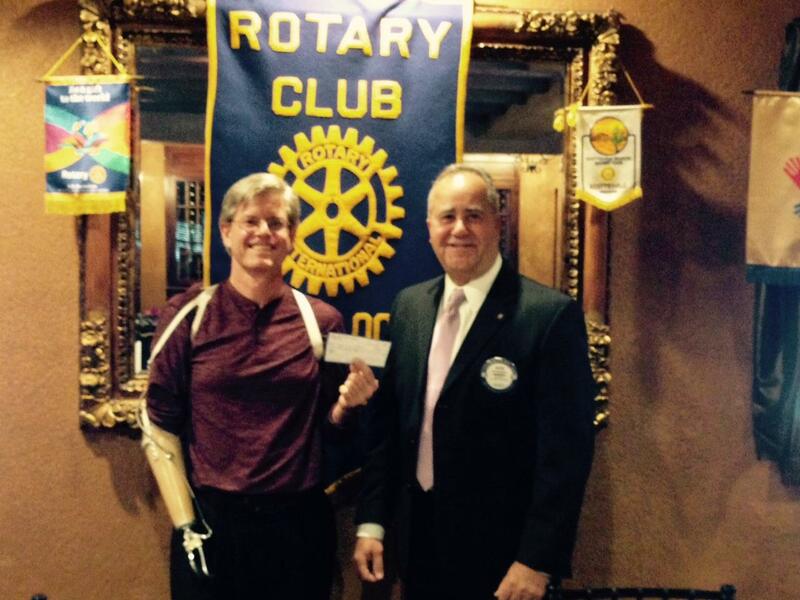 Thank you for visiting the Central Ocean Rotary Club's website. 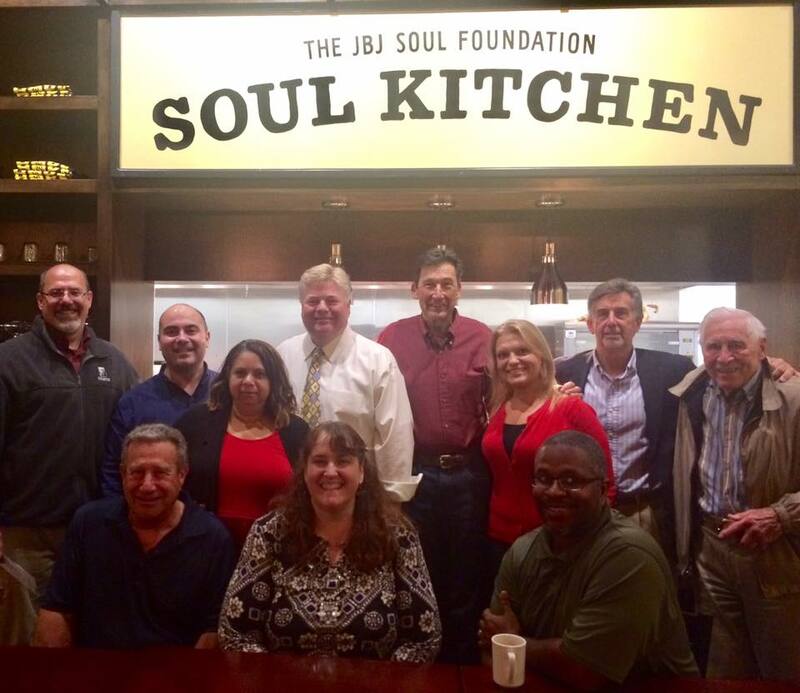 We meet each week to promote Service above Self in the Toms River area. Please use the links above to find out information on what we are up to! In 1905, Paul Harris, a young lawyer in Chicago, frequently met after hours with colleagues and other professionals to discuss the issues and concerns of the times. A man of vision, he recognized the benefit of formalizing the meetings so the group could share in the knowledge and solutions each member could offer.